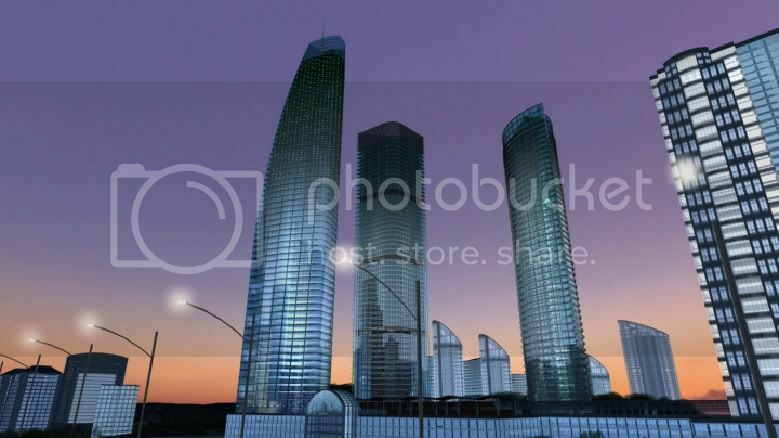 Con eso de que el otro hilo está abarrotado de fotos y bastante abajo mejor abrimos uno nuevo más ordenado y actualizado. 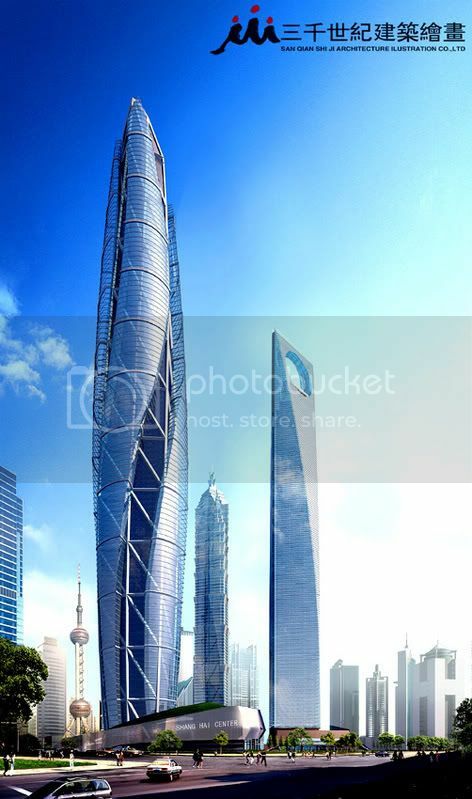 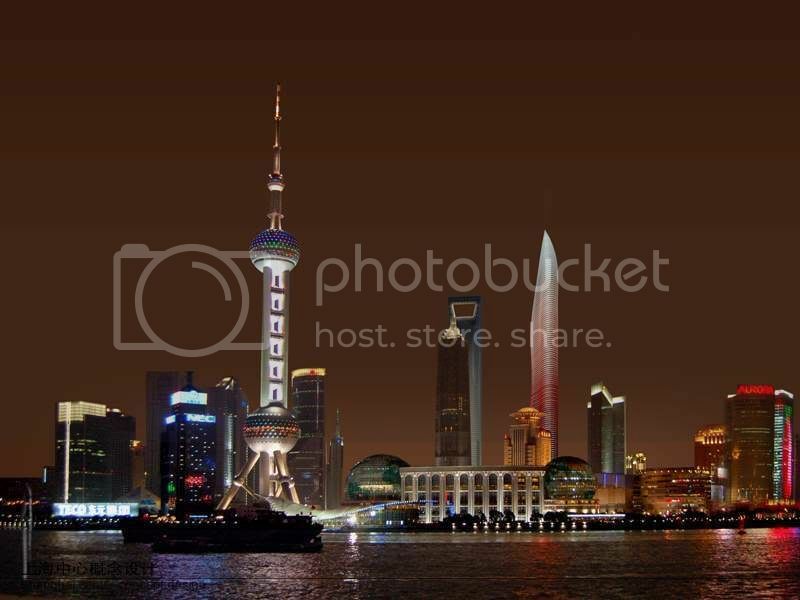 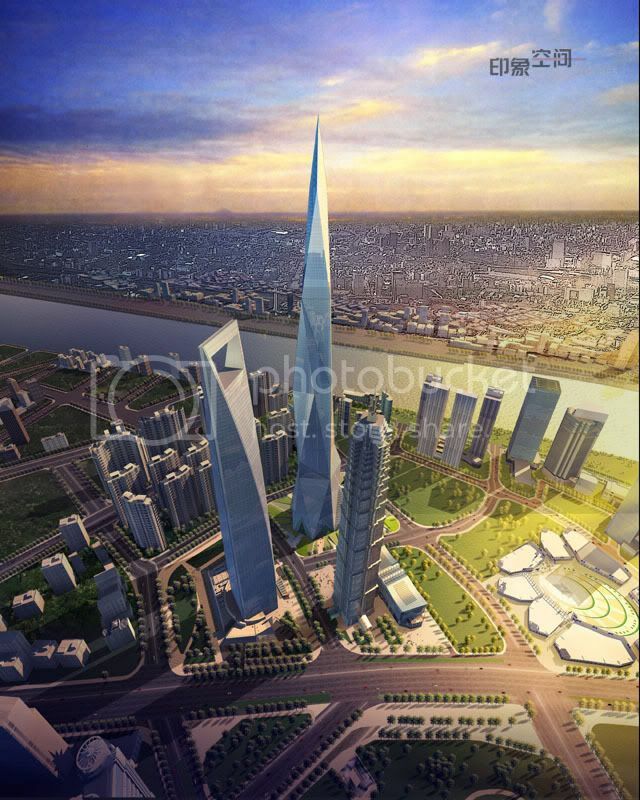 More than 300 supertall projects on going in China. 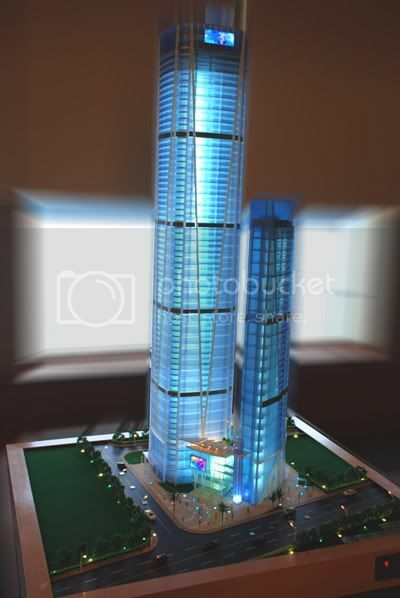 Proyectos de rascas de 300m+, excluyendo cancelados, visionarios, etc. 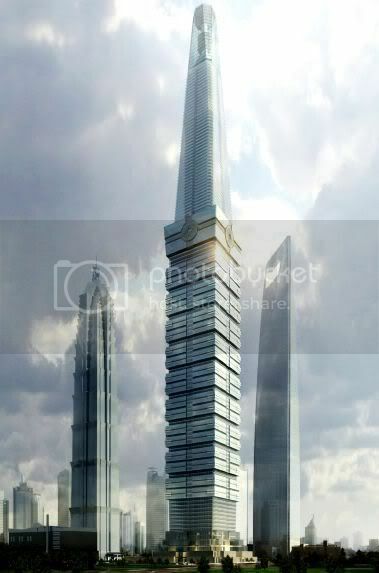 y también sin torres de telecomunicaciones. 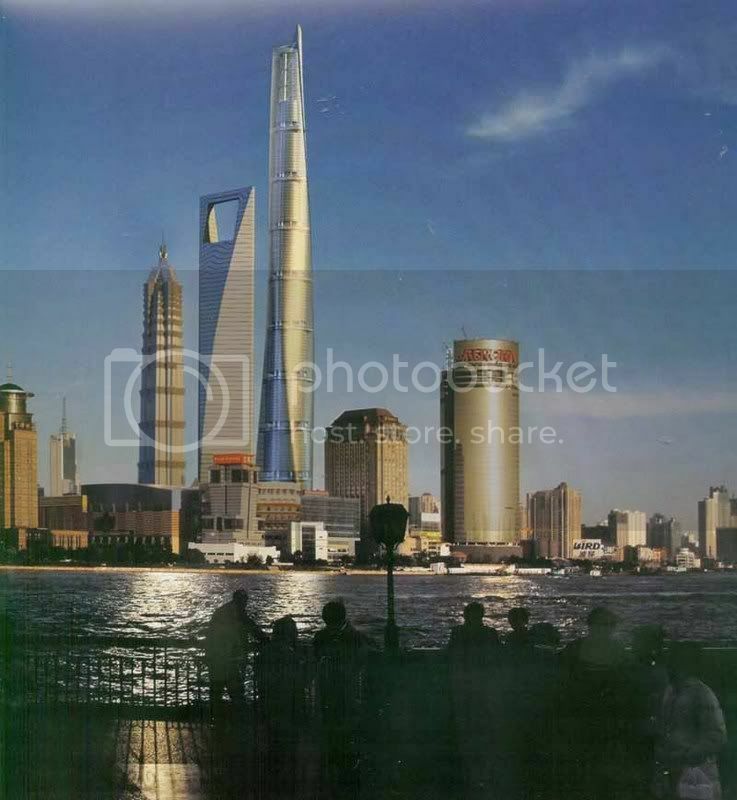 Foto-índice de proyectos en marcha en China tal y como lo he puesto en el internacional (perdón por el inglés). 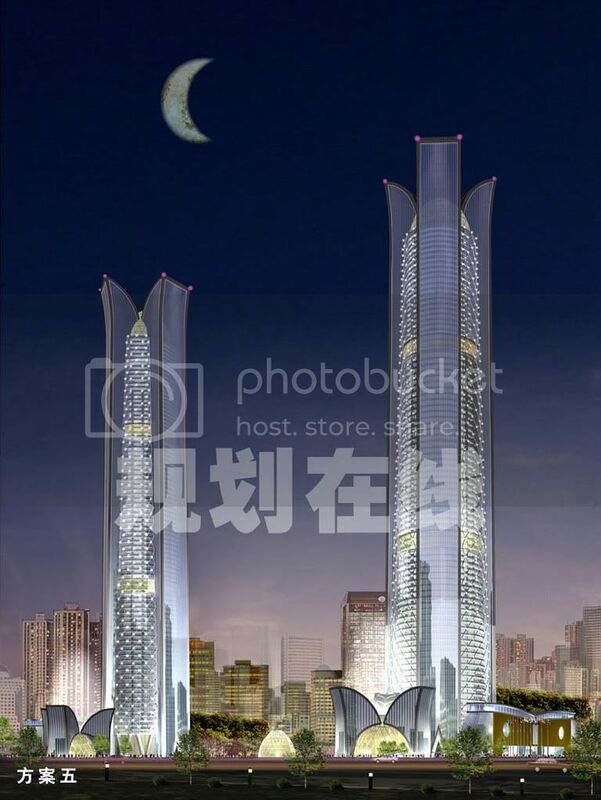 He excluido los de Taiwán porque estoy harto de trolls. 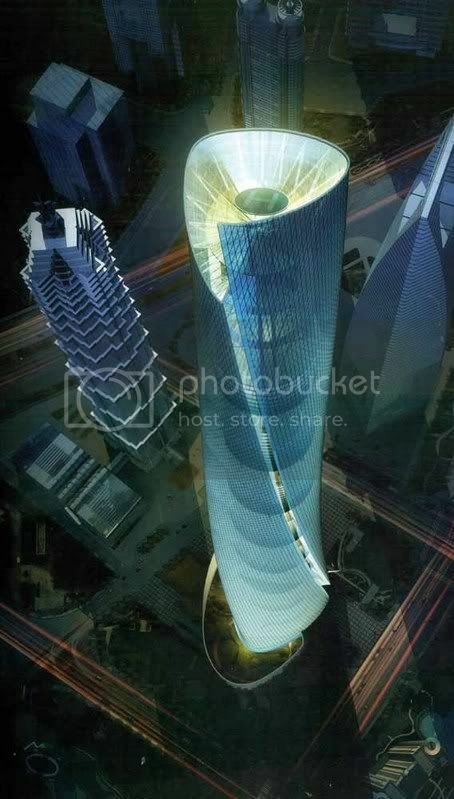 XIAMEN | Dynasty 123 (Concept proposal): 500m+, 123 floors. 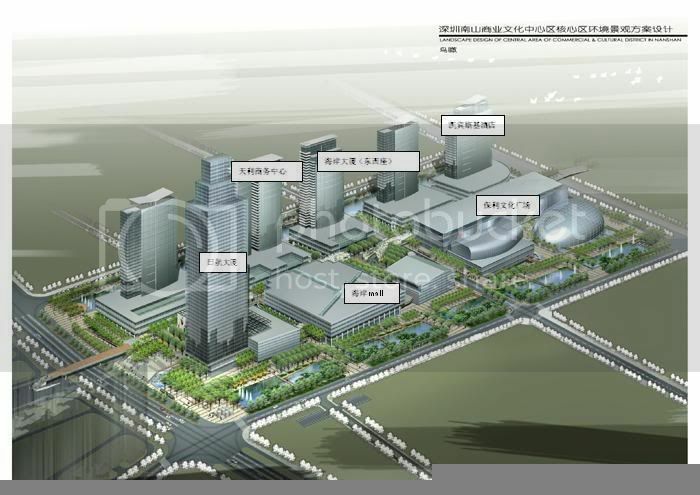 There’s almost no info available about this concept proposal released by Dynasty Properties in Xinglin area. 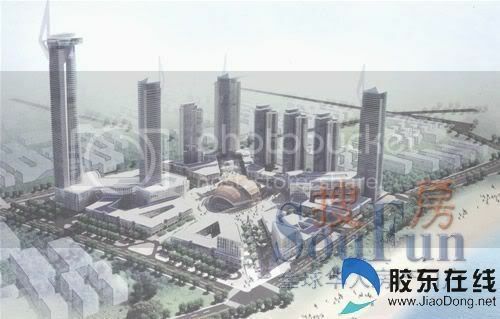 WUHAN | Wangjiadun Supertalls (Concept proposal): 14x300-500m,. 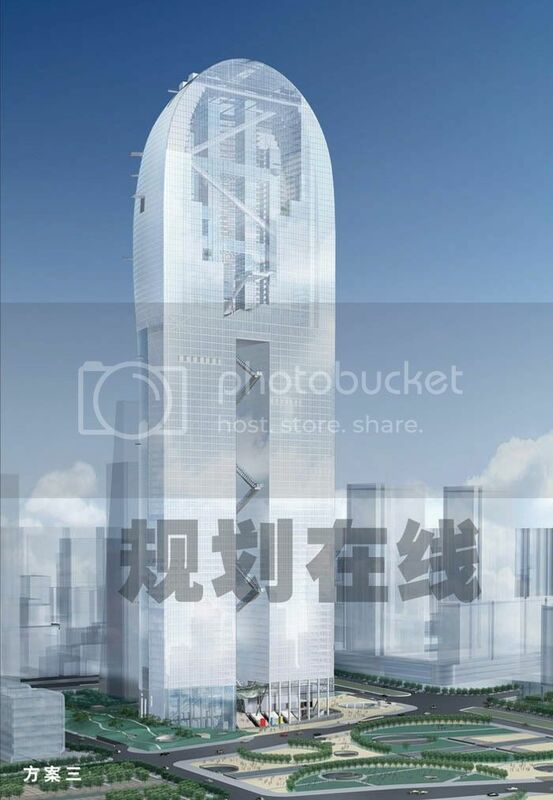 As far as 14 supertalls are scheduled to be built within 2020 at Wangjiadun CBD, Wuhan’s largest skyscraper area. 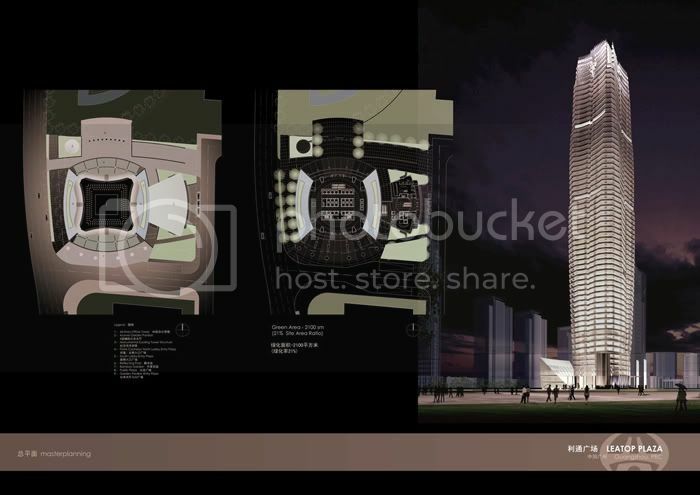 The available material is very conceptual and likely to be very different from the final results. 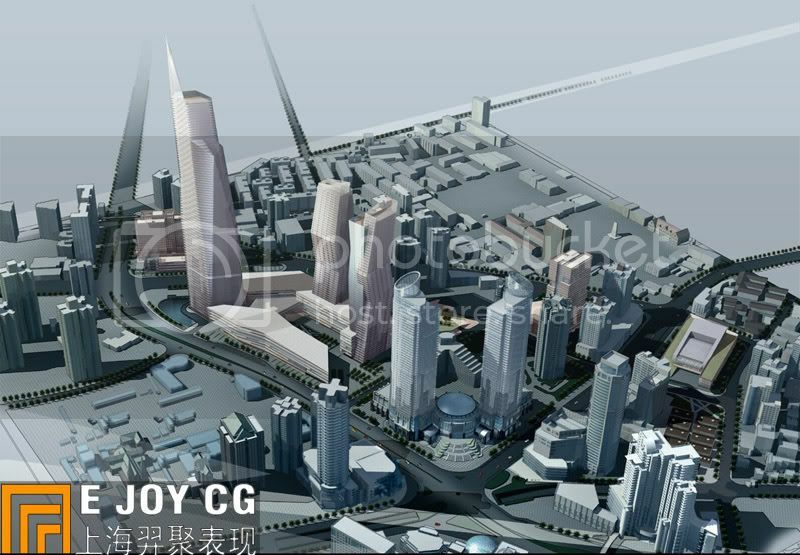 CHONGQING | Jiangbei CBD Supertalls (Concept proposal): 1x500m, 1x380m, 1x360m. 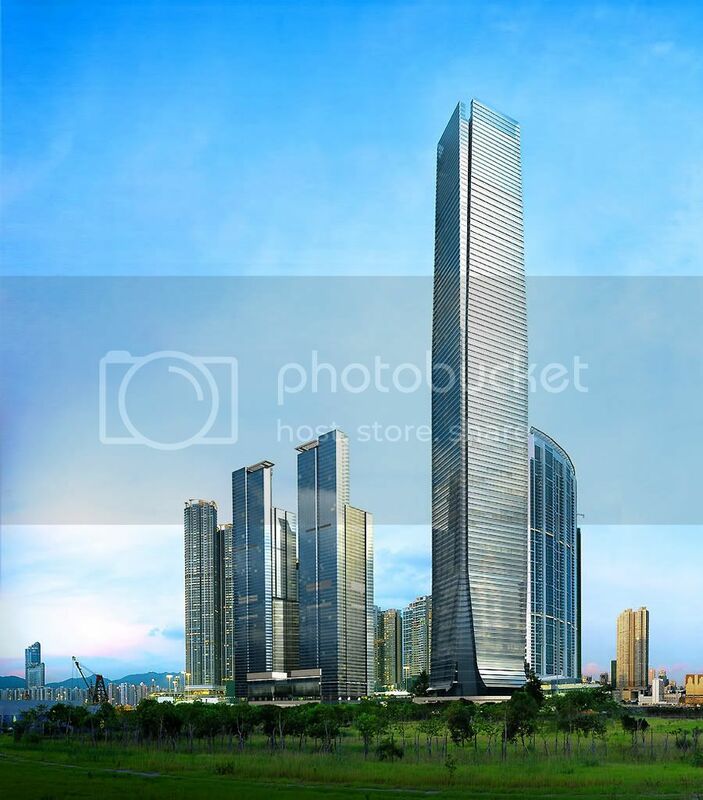 The second core of Chongqing CBD has seen a recent increase about the maximum heights for its landmark projects, located respectively at plots A13, A07 and A11. 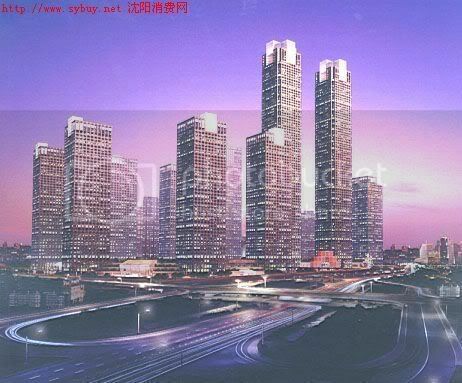 Formerly, Jiangbei highest were planned to reach 300m, 350m and 240m, the plan has just been changed. 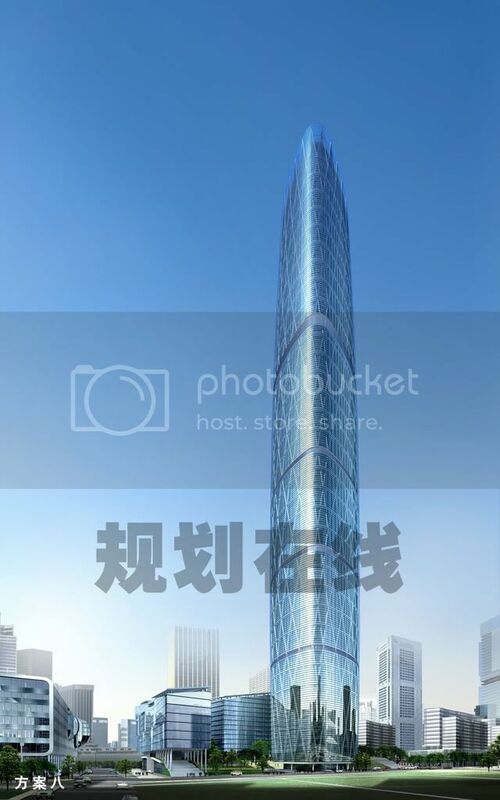 Vantone Group is said to be developing the tallest project. 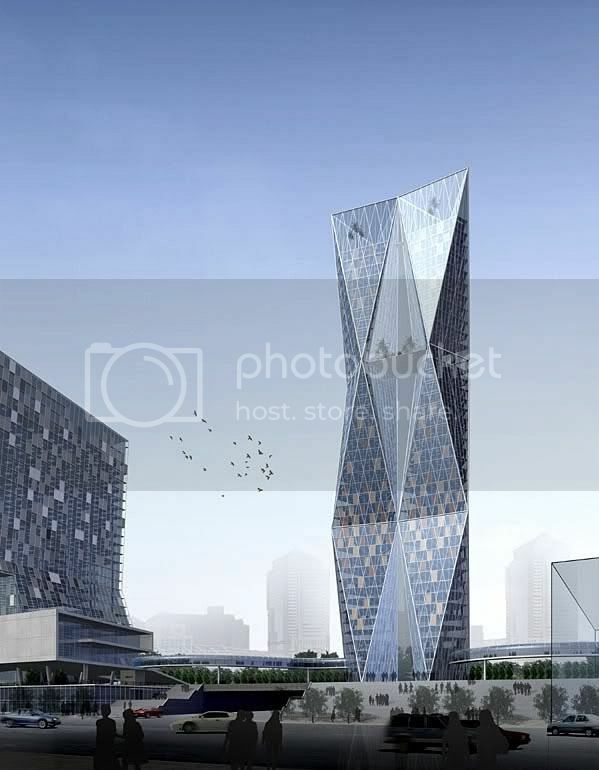 NINGBO | Ningbo Twin Towers (Concept proposal): 2x480m, 100+ floors.This oversized proposal in charge of Hassell and Hyder studio has very few chances. 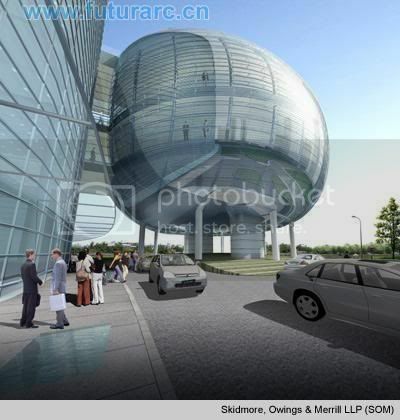 A reduced version has been reported to be under study. 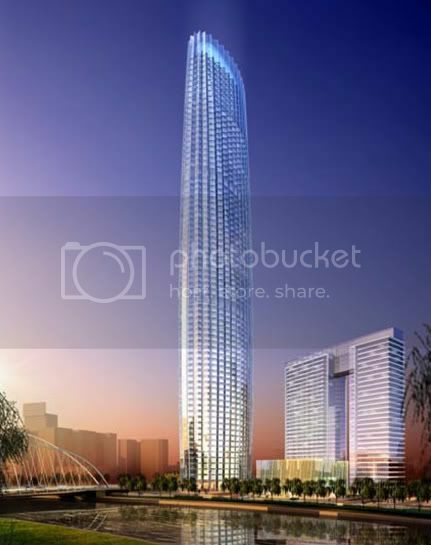 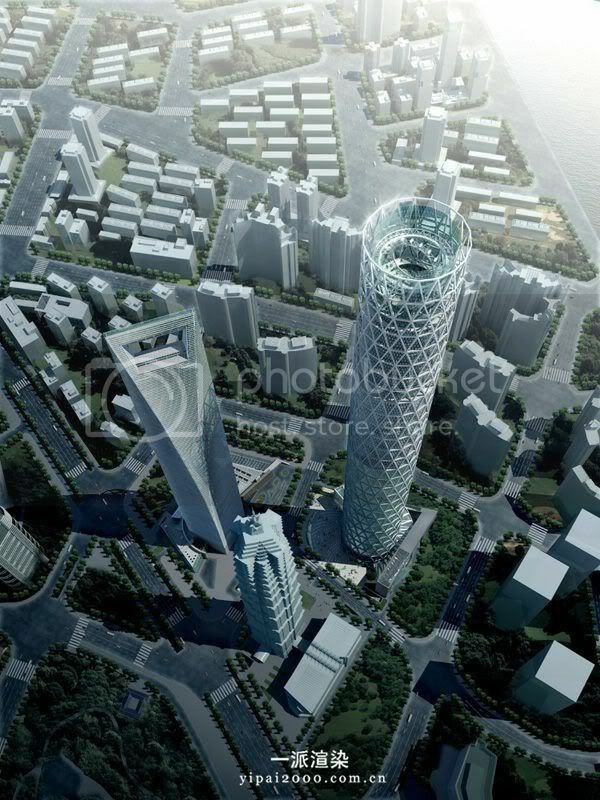 SUZHOU | The Wharf Supertower (Approved): 420m, 100 floors. 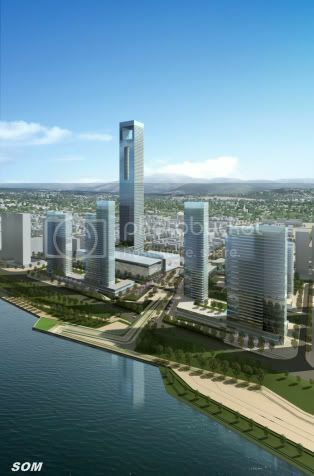 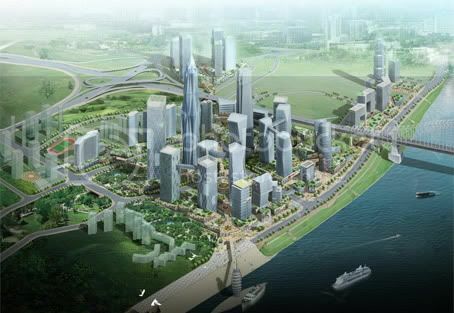 This landmark project developed by The Wharf Holdings will be located at the core of Suzhou Jinji Lake new CBD. 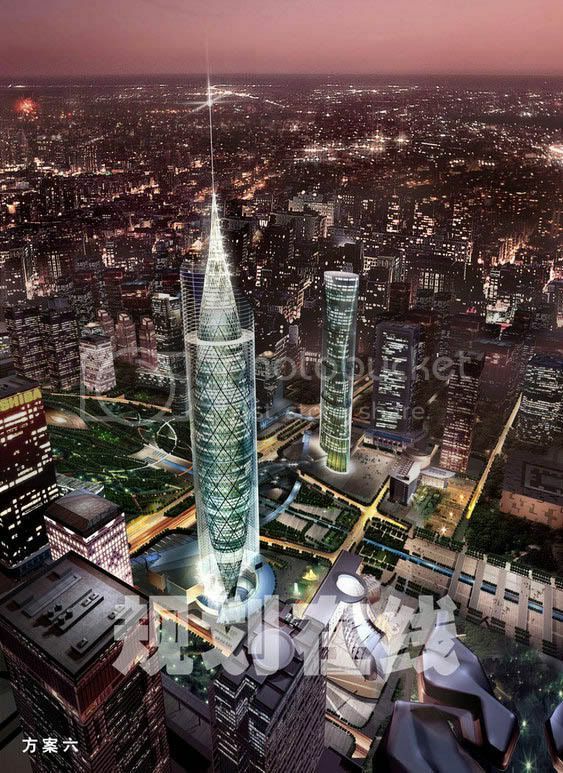 The tower is being designed by KPF. 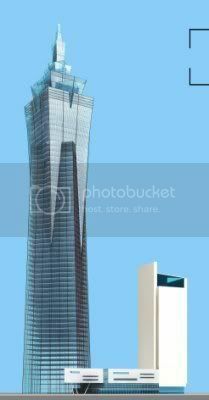 TIANJIN | Eastern New Century Square (Proposed): 400m+, 80+ floors. 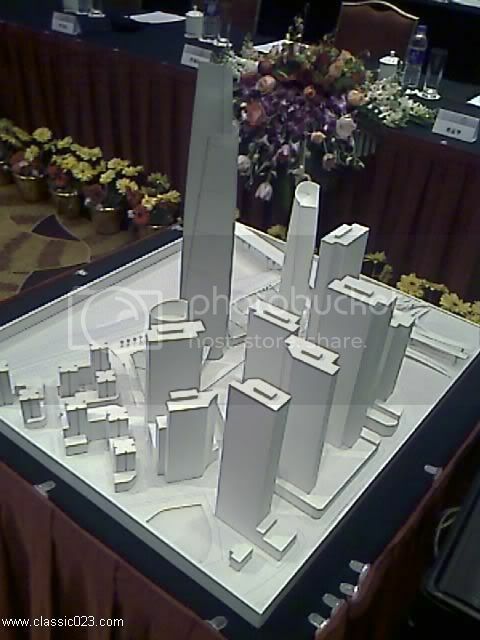 Old proposal, almost no info about it. 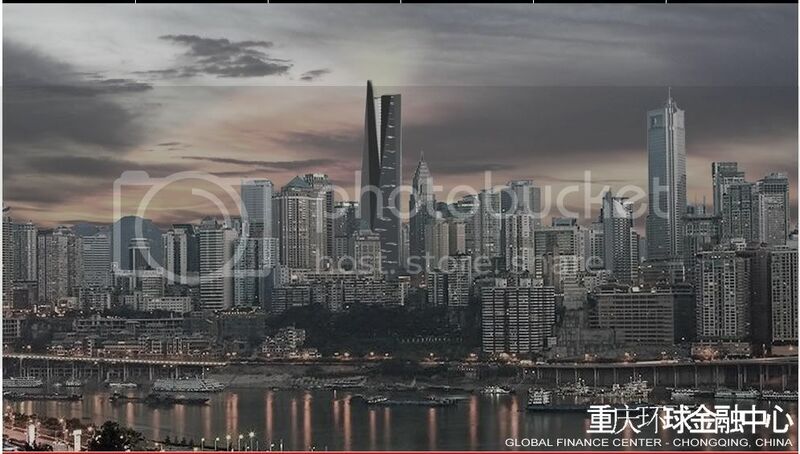 Very few chances. 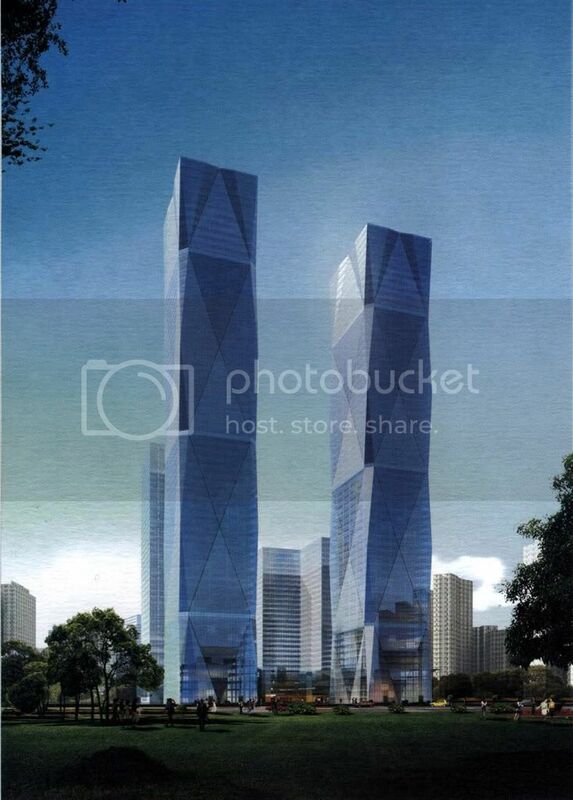 CHANGSHA | Changsha Twin Towers (Concept proposal): 2x400m, 80 floors. 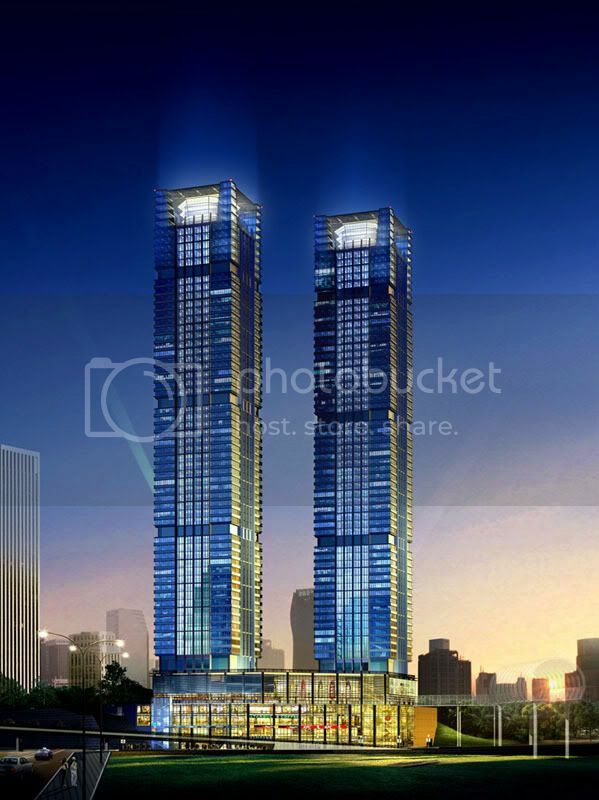 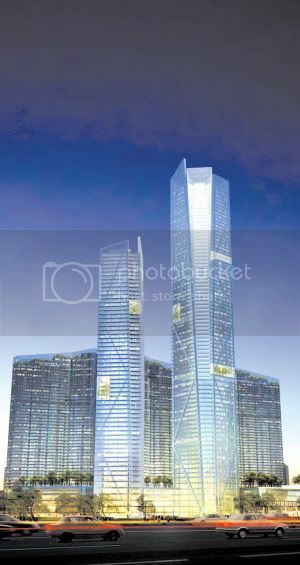 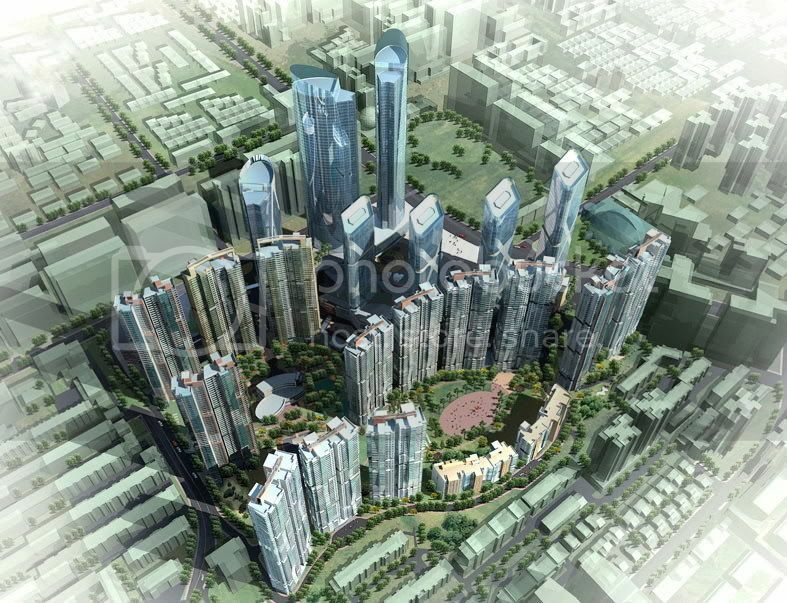 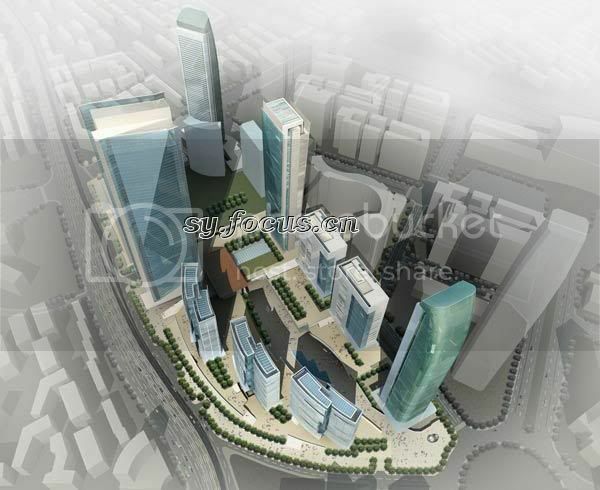 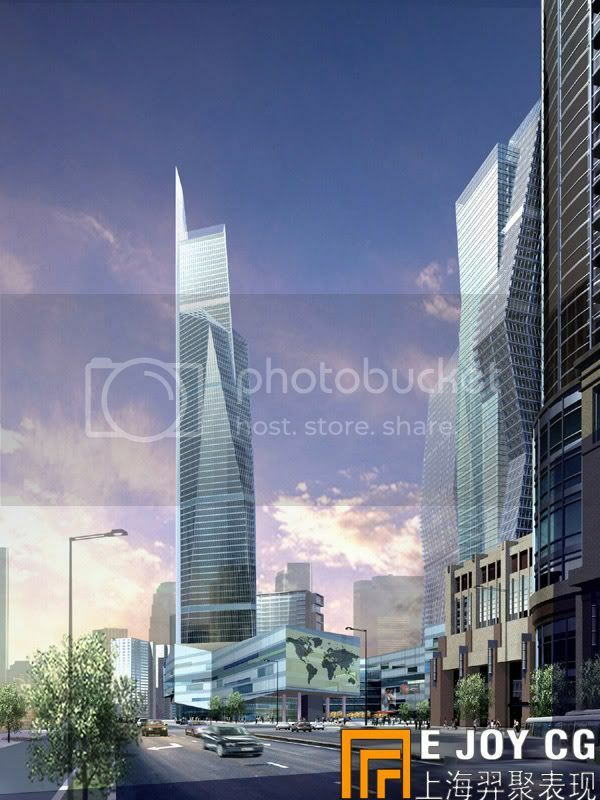 Landmark towers proposed for Changhsa’s coming CBD. 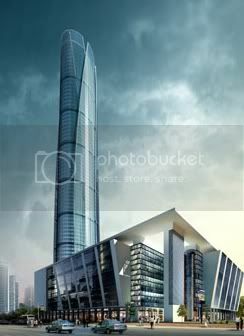 Long term plan. 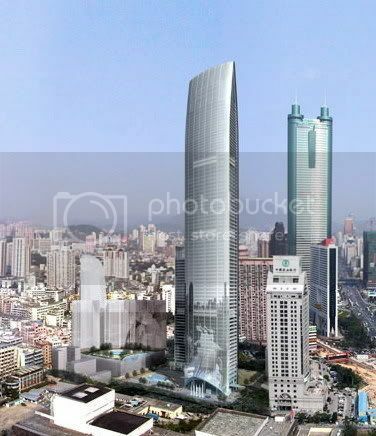 SHENZHEN | Feng Long Center (Proposed): 400m~, 80~ floors. 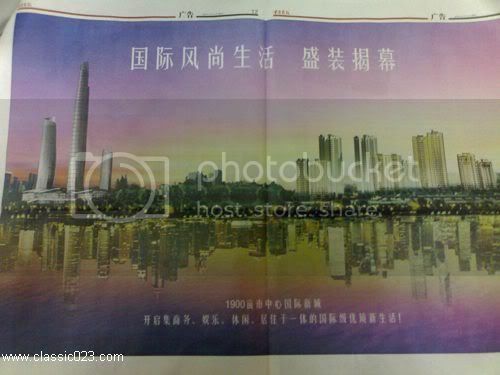 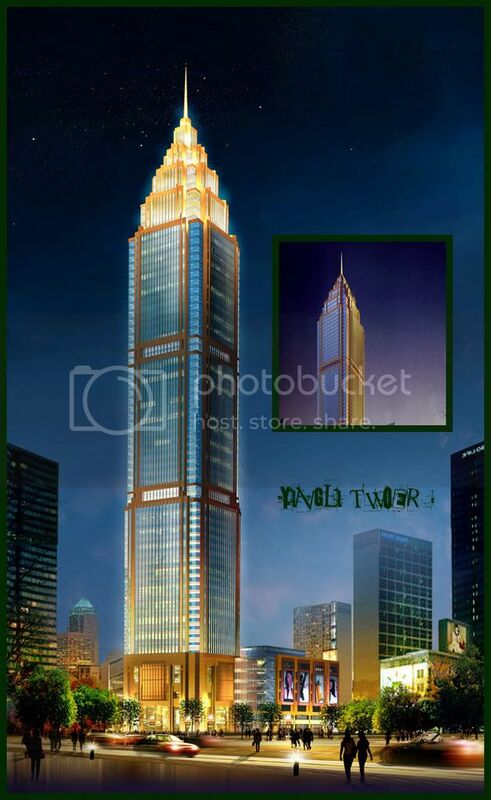 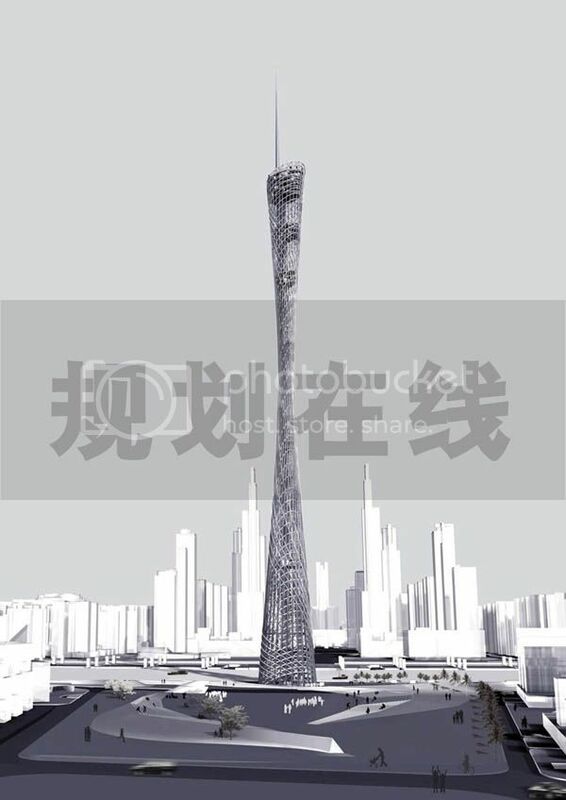 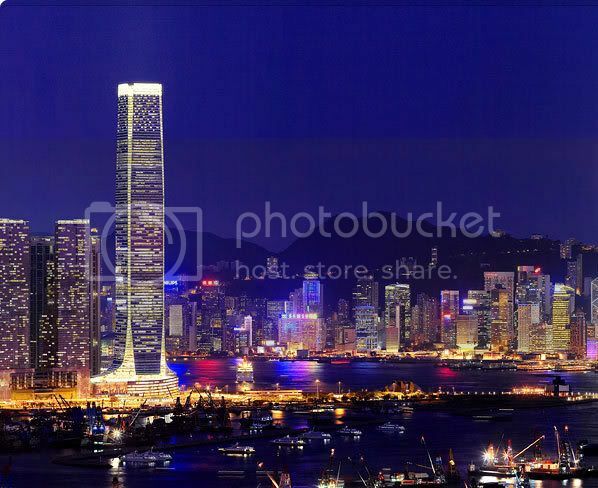 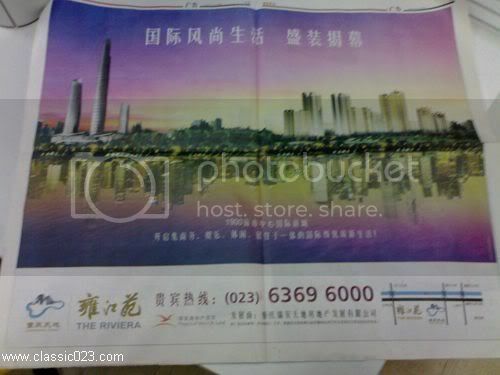 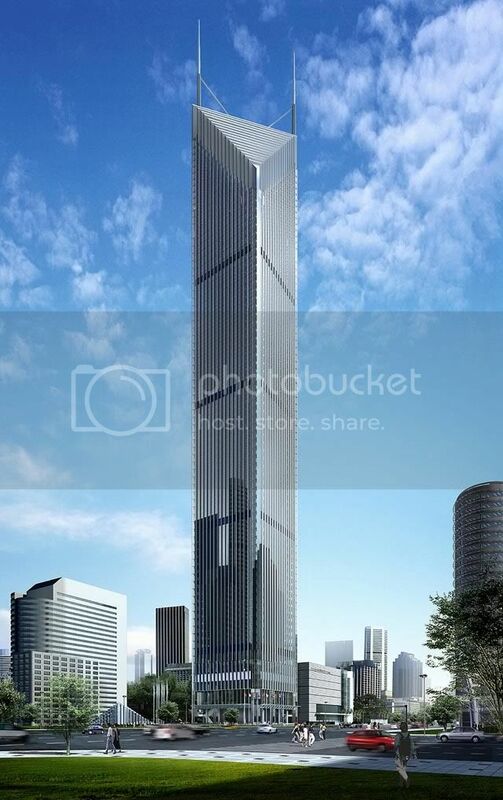 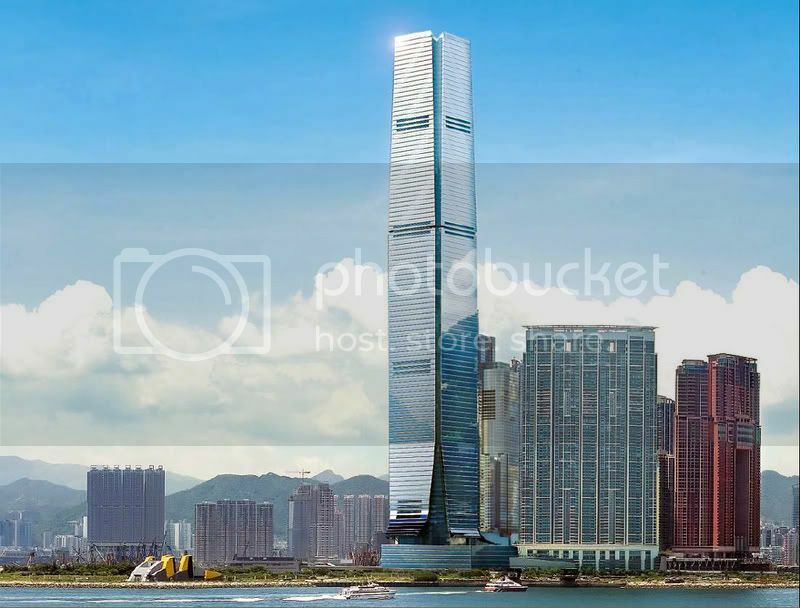 Proposed in Futian district, there’re no news about this supertall for more than one yar. 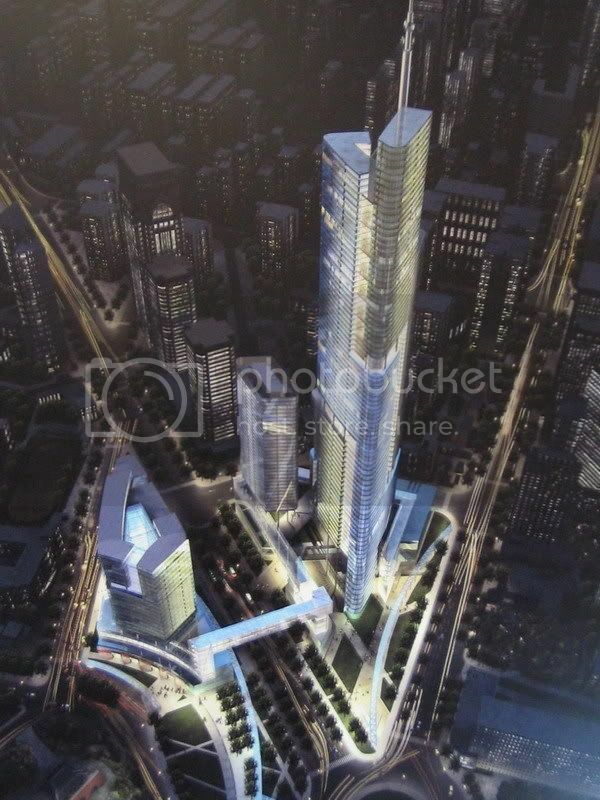 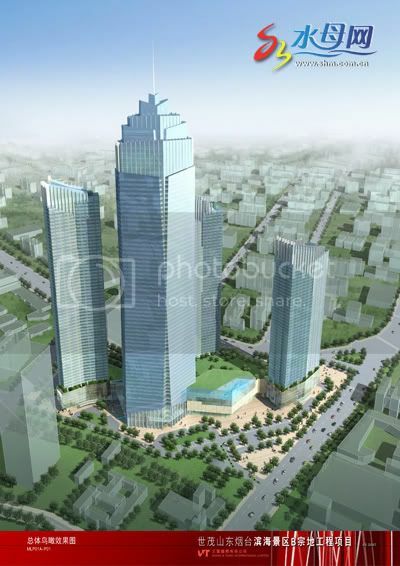 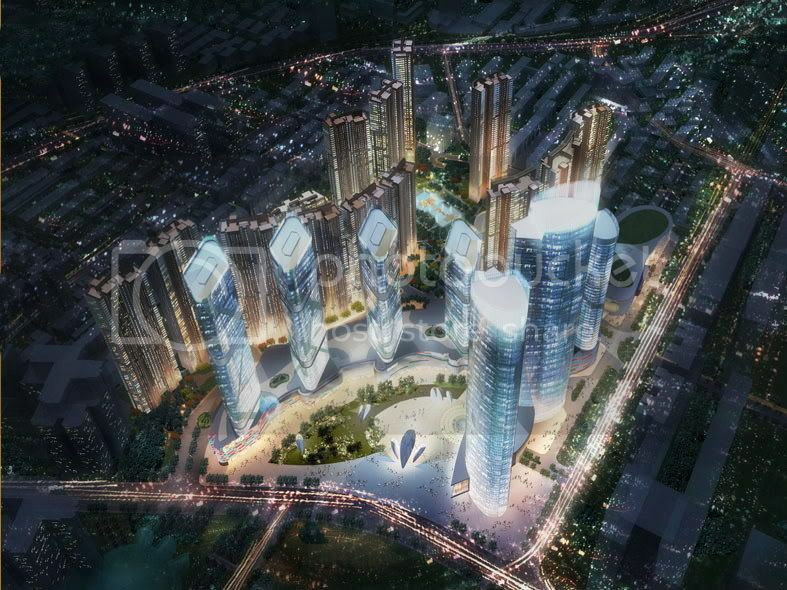 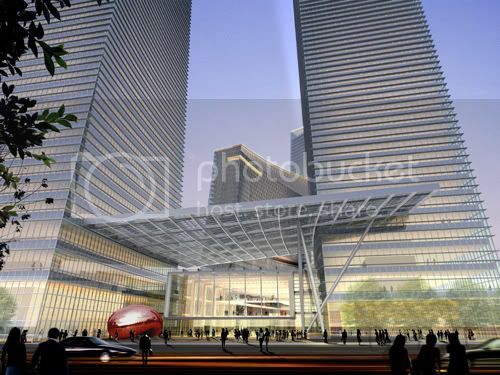 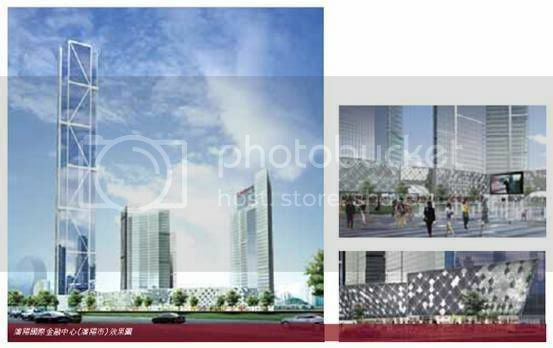 SHENYANG | Oriental International Plaza (Proposed): 2x380m. 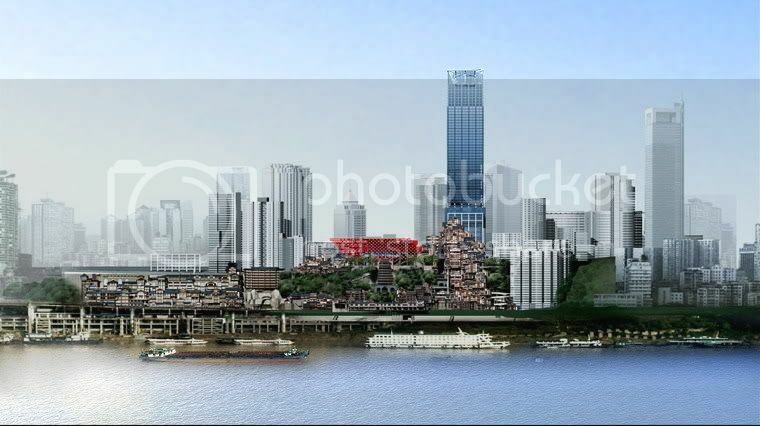 Proposal for Heping district, still no images. 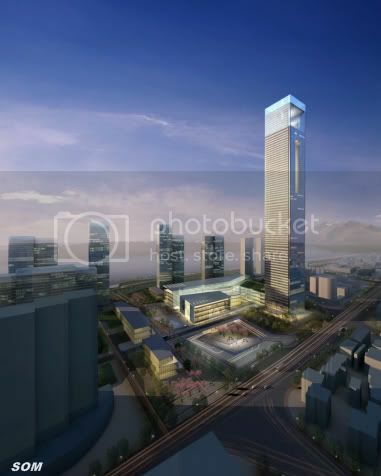 SHENYANG | Sun Rise IBT (Concept proposal): 377m, 77 floors Developed by Sun Rise Group (ROK),the fourth stage for this large development is scheduled to be started in late 2008. 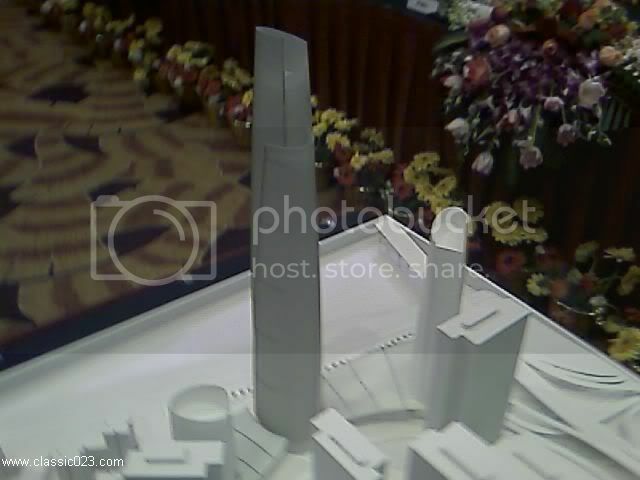 The design is still very conceptual. 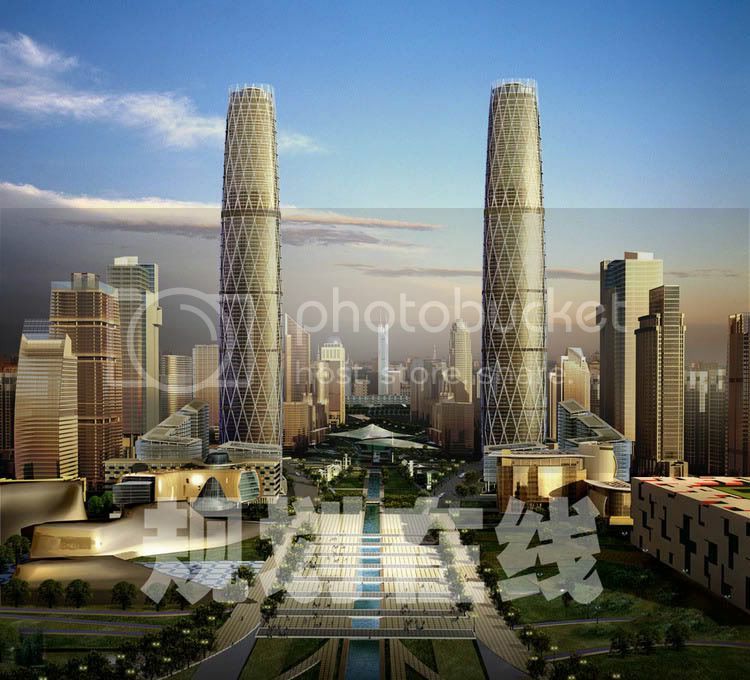 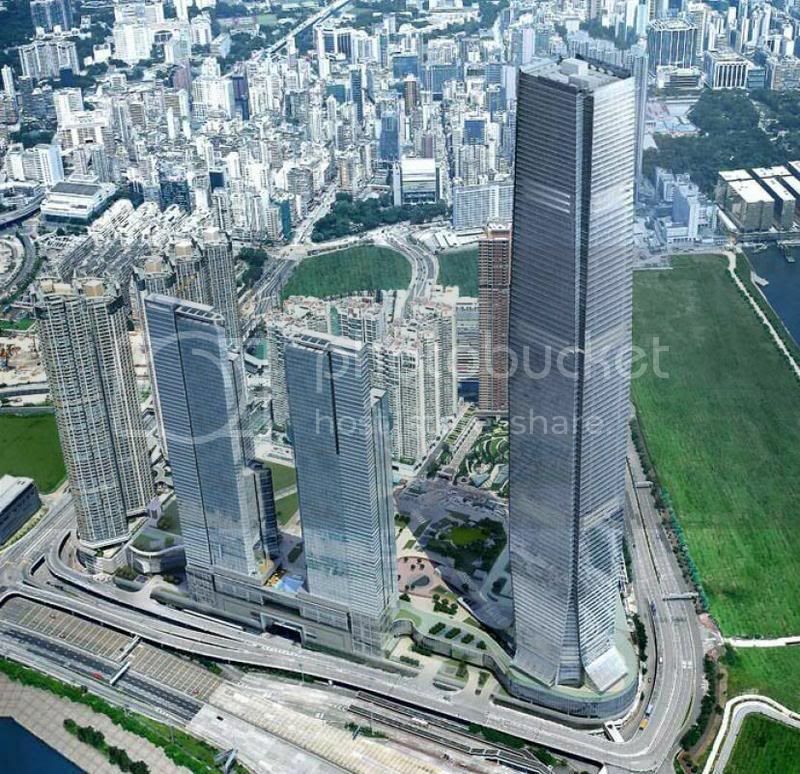 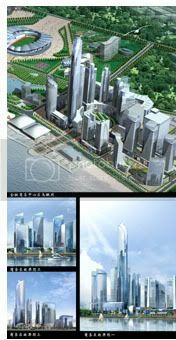 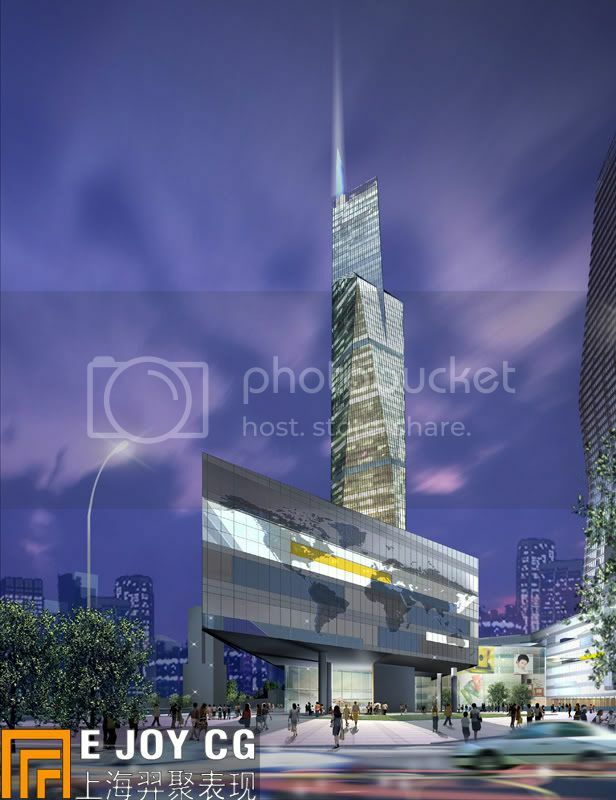 WUXI | North Station CBD Twin Towers (Concept proposal): 2x350m+, 89 floors Official announcements claimed that there are two 89 floor towers planned at this financial district. 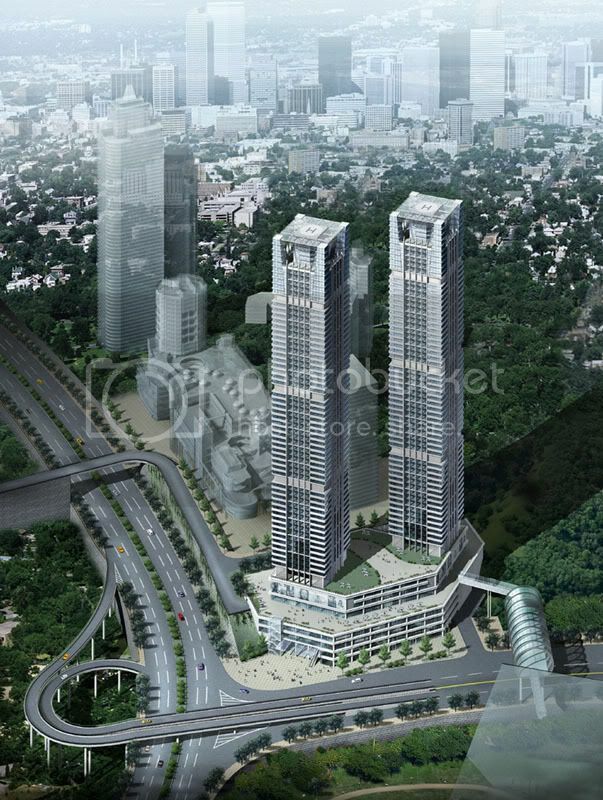 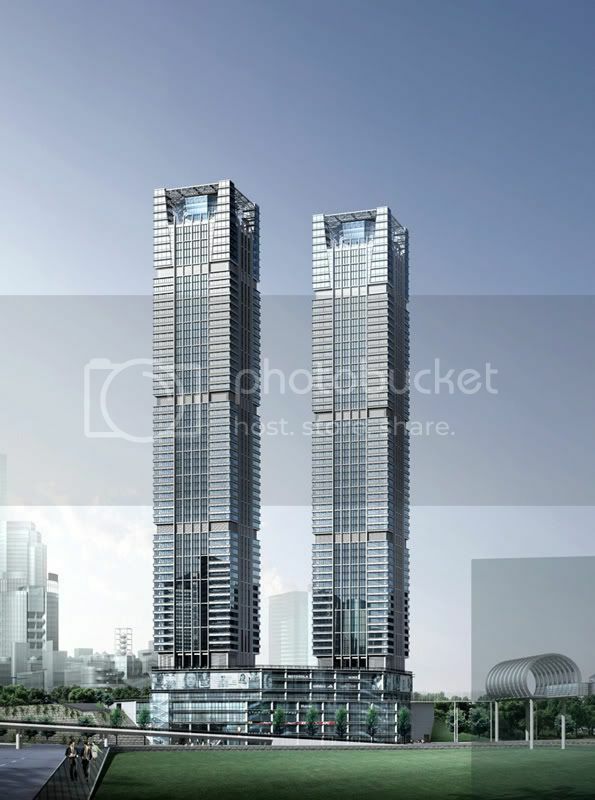 However, the first available renders show a more modest design around 68 floors for these twins. 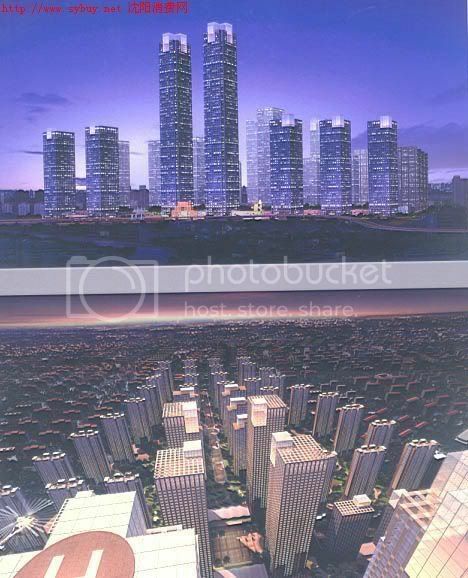 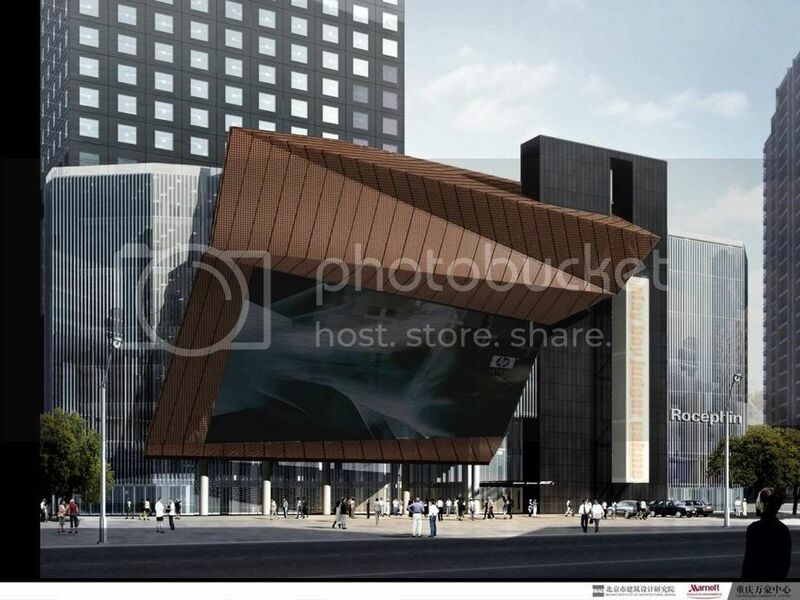 SHENYANG | Shenyang Eton Center (Proposed): 2x320m+, 70+ floors. 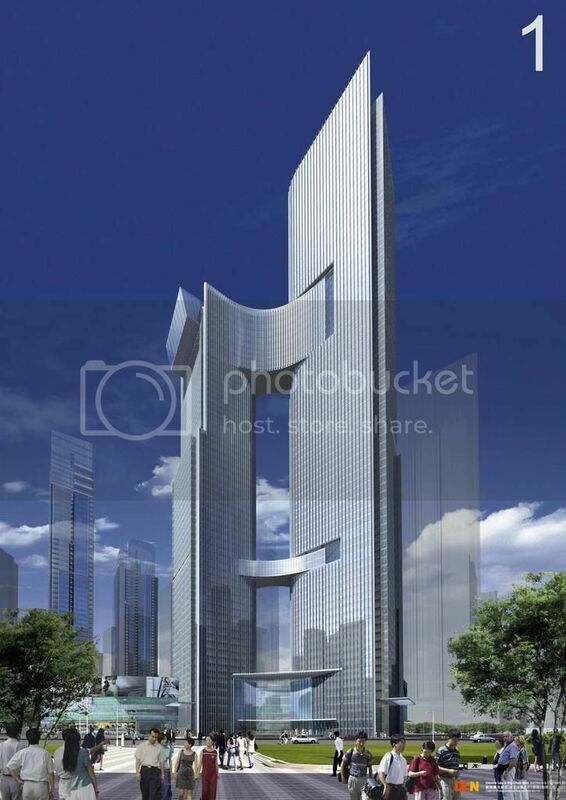 This new project will be developed by Eton Holdings and built next to Hang Lung twins in Shenhe district. 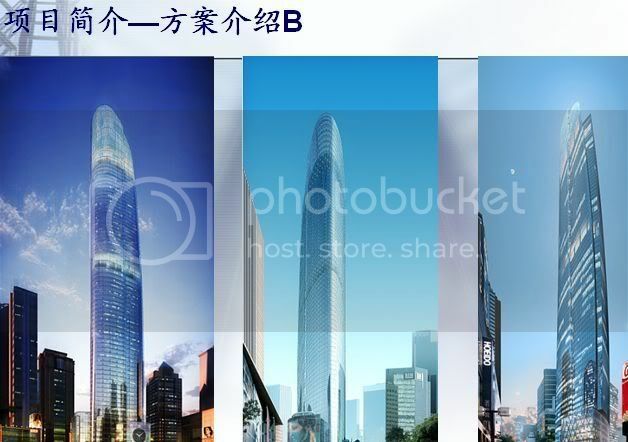 The architect is NBBJ. 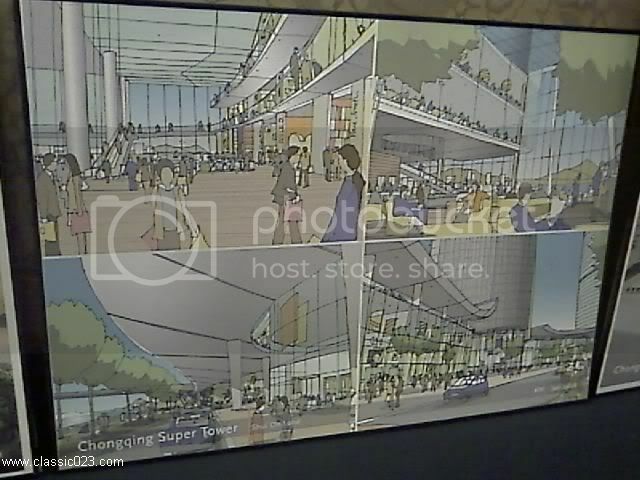 Tiny images posted at the developer’s website show one or two supertalls depending on the proposal. 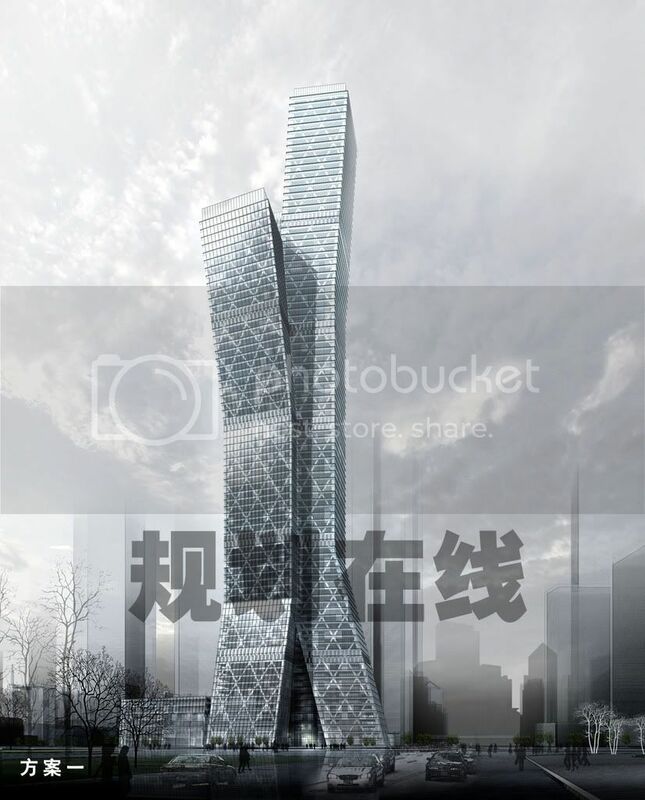 HANGZHOU | Qianjiang Twin Towers (Concept proposal): 2x320m, 75 floors.Concept renders for Qianjiang CBD show this twin project and it has been rumoured that the final version might be launched in early 2008, probably around 350m. 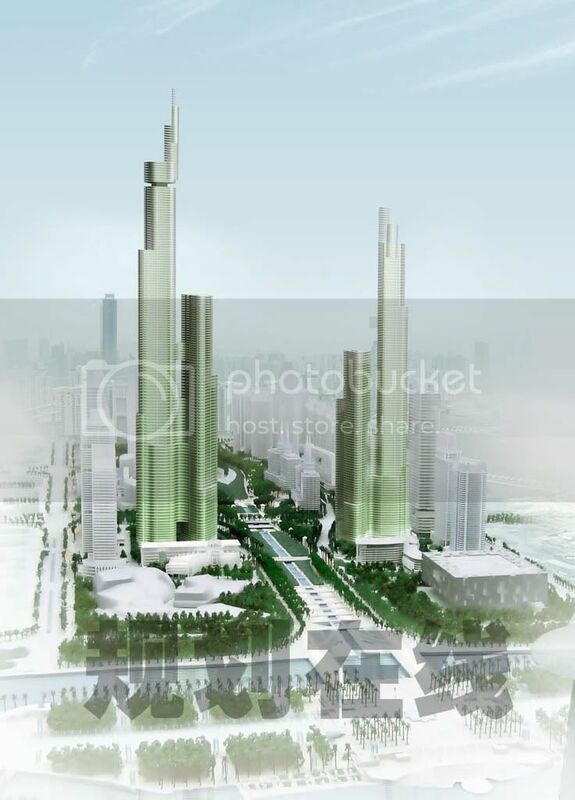 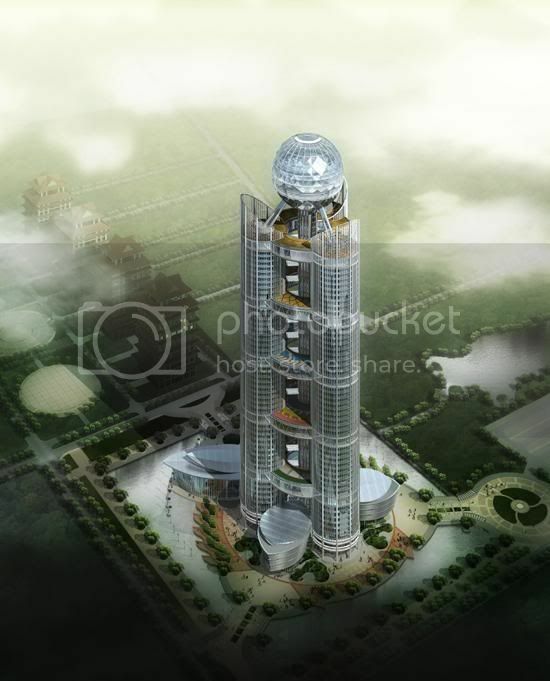 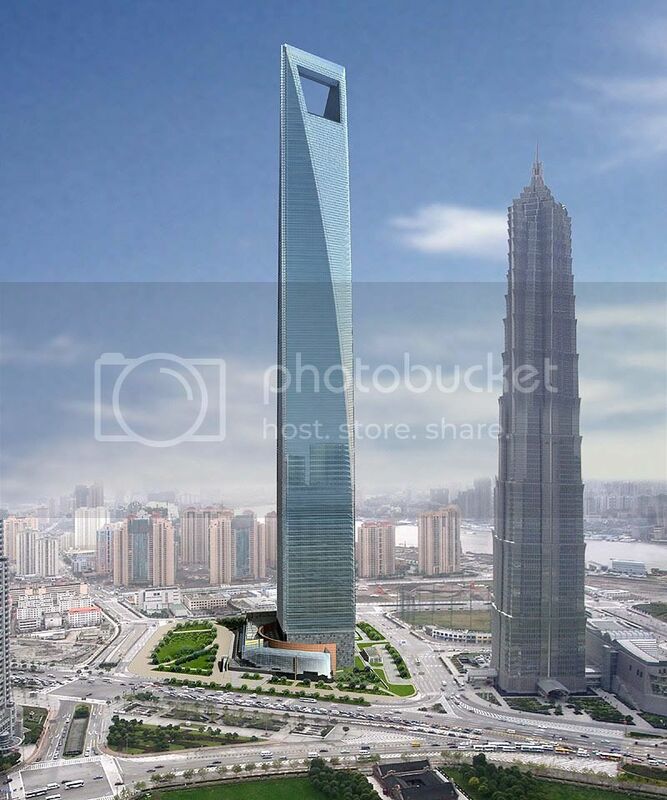 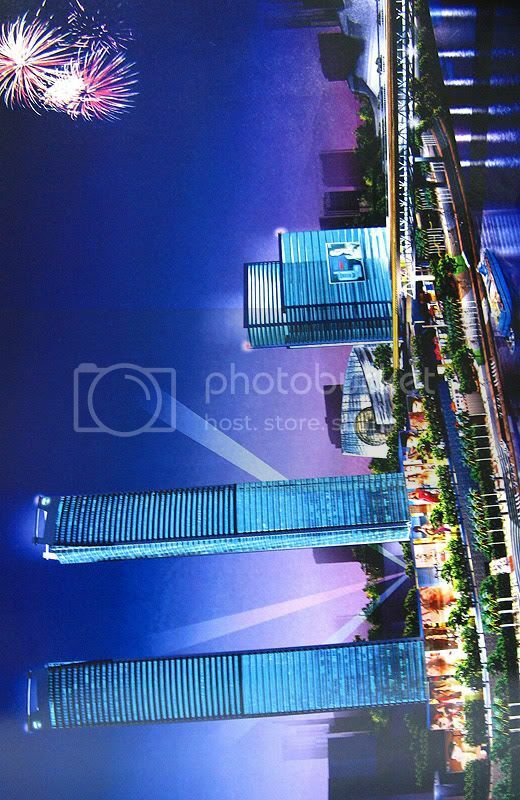 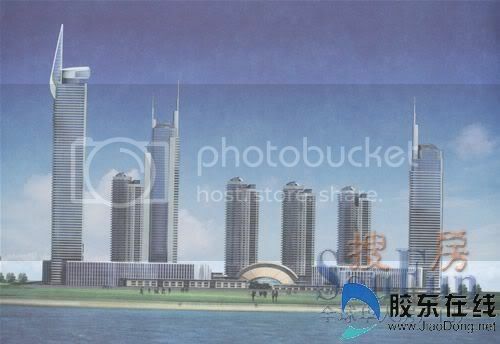 NANNING | World Trade Commerce City (Proposed): 308m, 77 floors. 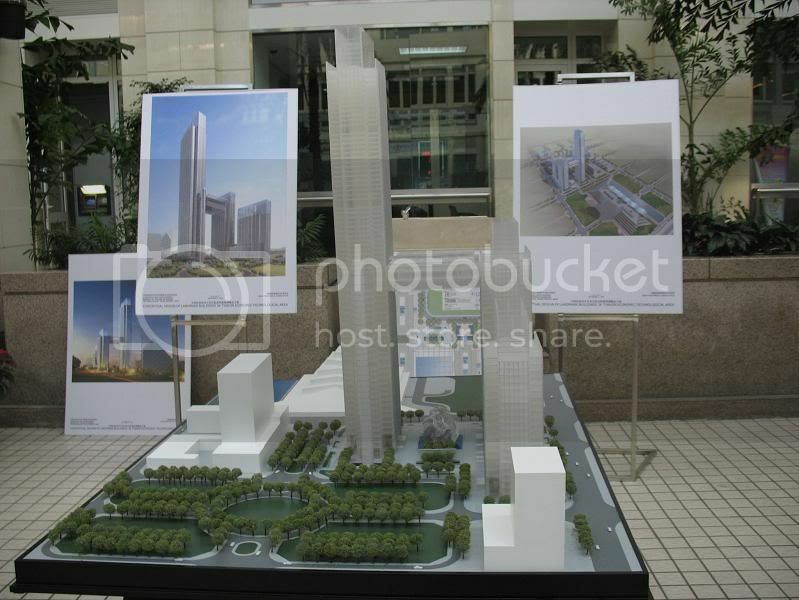 This is an old proposal with rather few chances to be re launched despite of rumours. 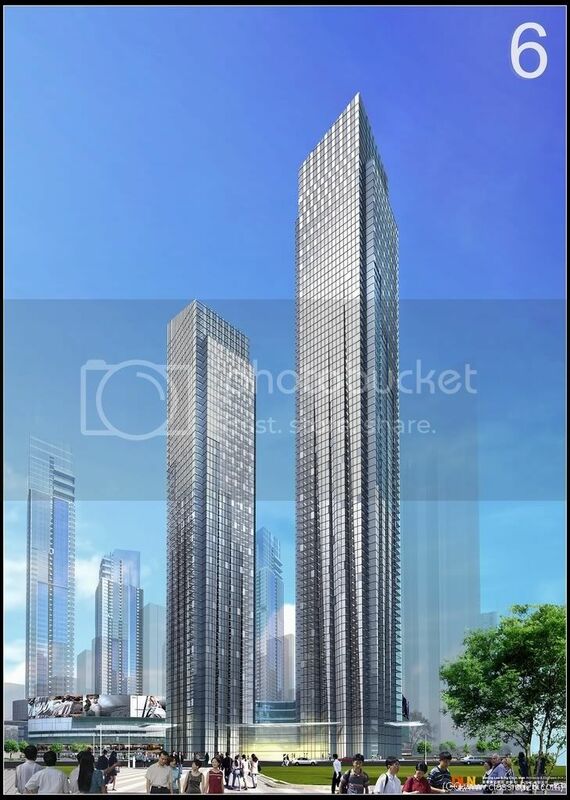 CHONGQING | Park Place (Proposed): 2x305m, 70~ floors.Located in Jiangbei New City CBD, this proposal might be drastically cut due to height limits. 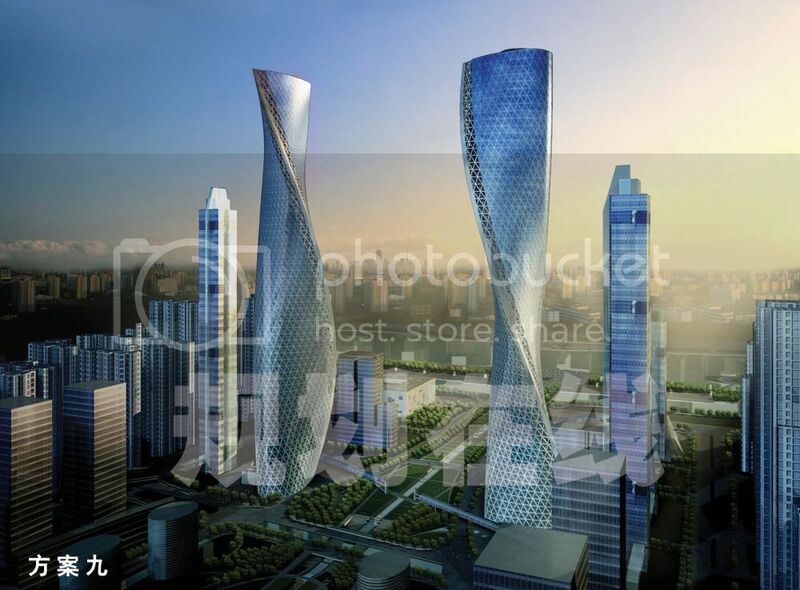 According to the these limits, the final project might be just three towers of 250m, 150m and 124m. 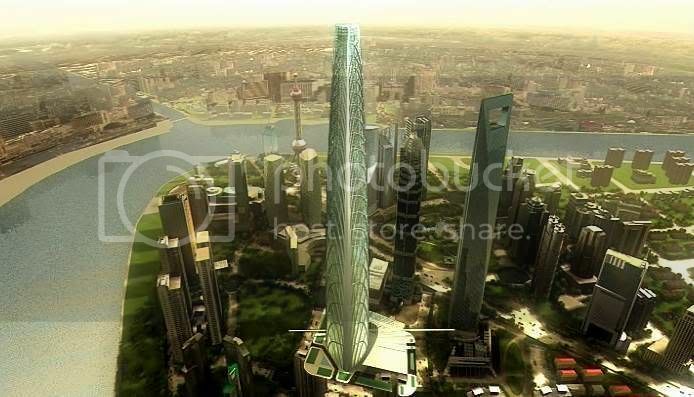 SHANGHAI | Rui’an Center (Concept proposal): 305m, 58 floors. 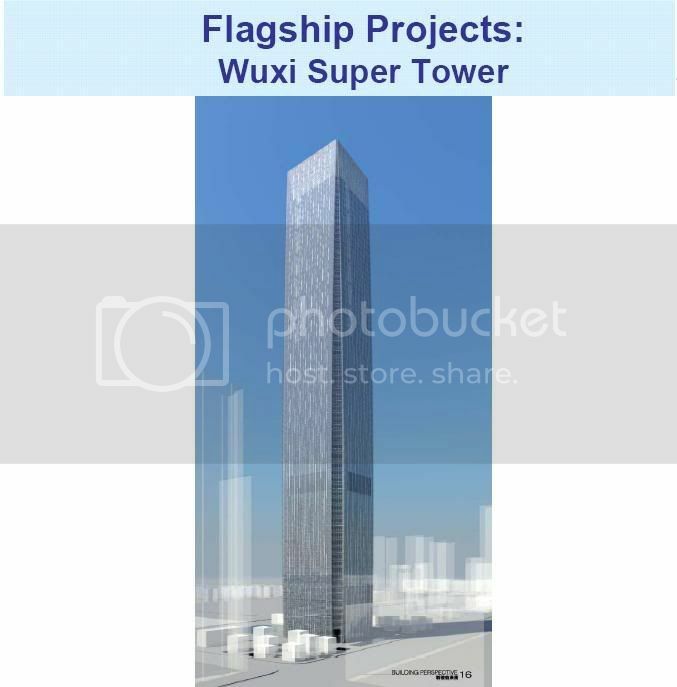 The last phase of Taipingqiao Redevelopment, run by Shui On Land, includes a supertall, whose client would be Rui’an Group. 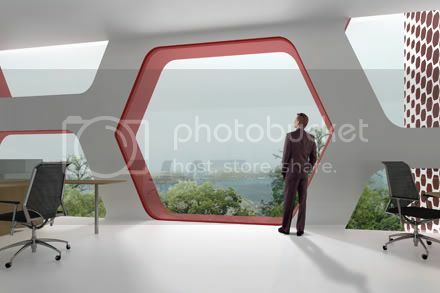 Still no formal designs. 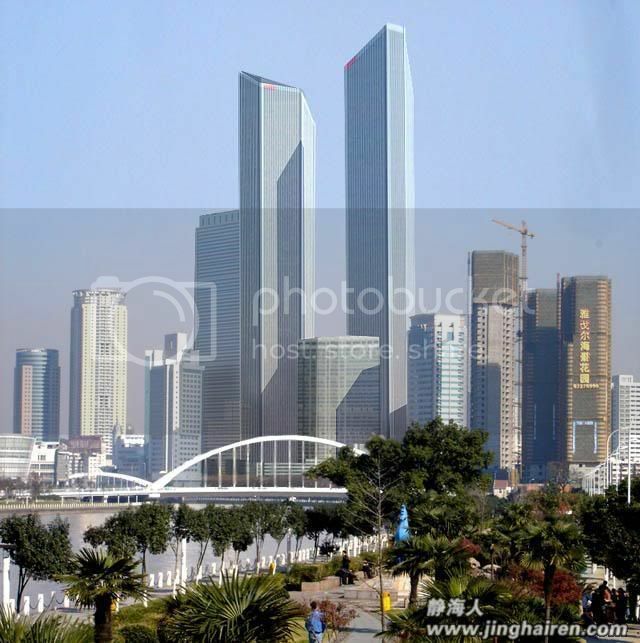 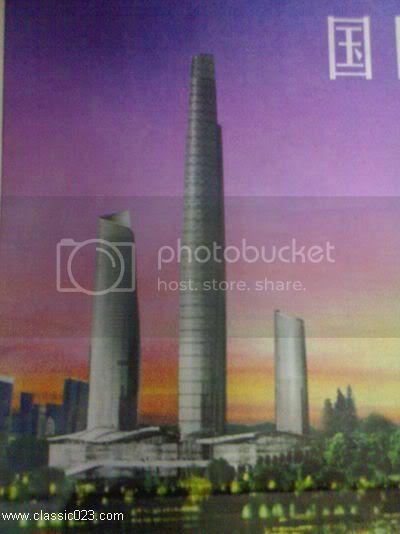 TIANJIN | Binhai Twin Towers (Approved): 300m+, 70+ floors. 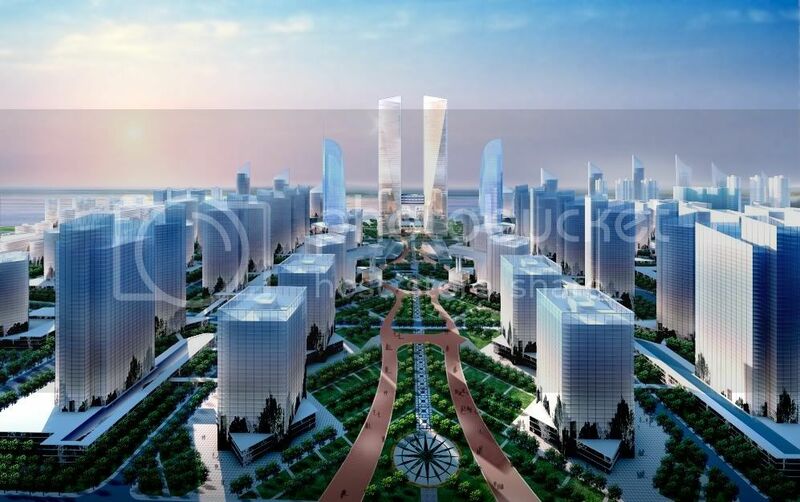 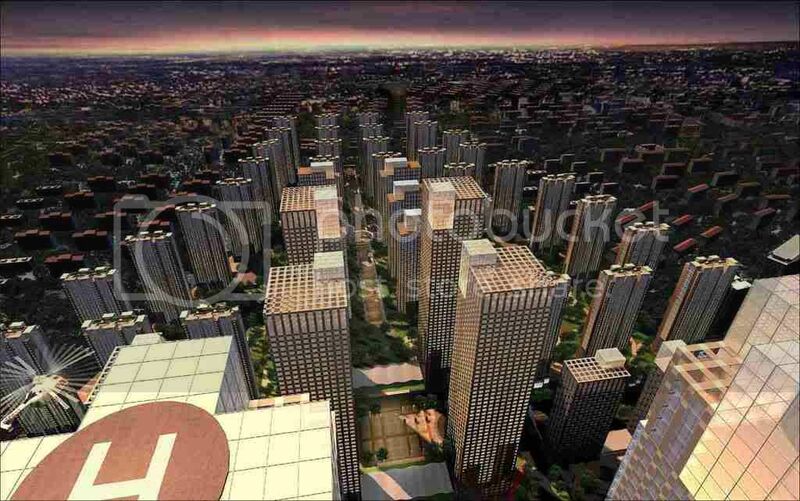 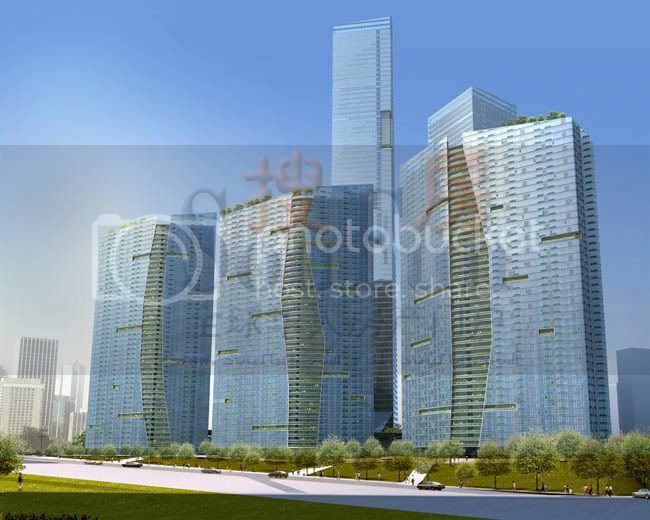 This project by Perkins Eastman is approved to be built at Xiangluowan CBD in a long term. 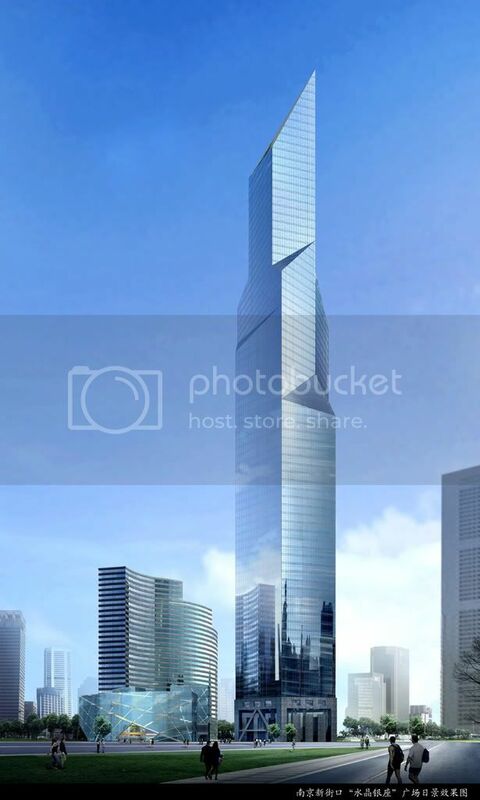 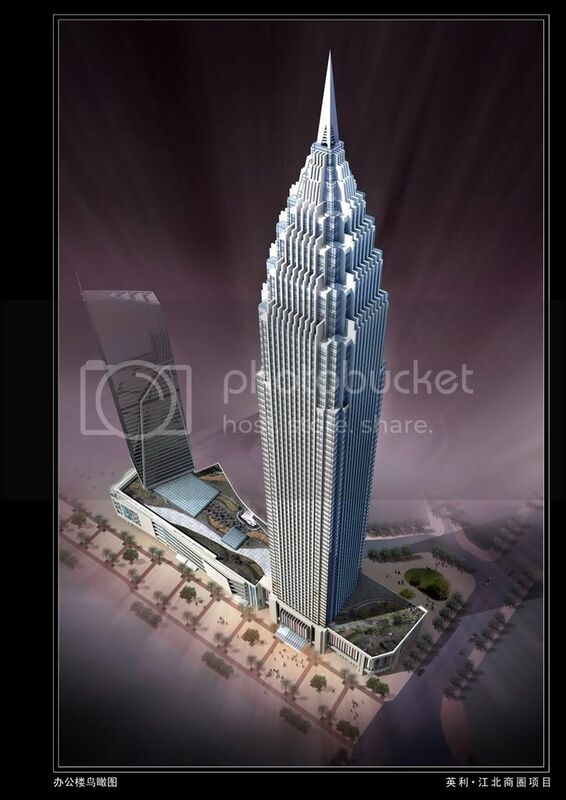 Final height is expected to be far above 300m. 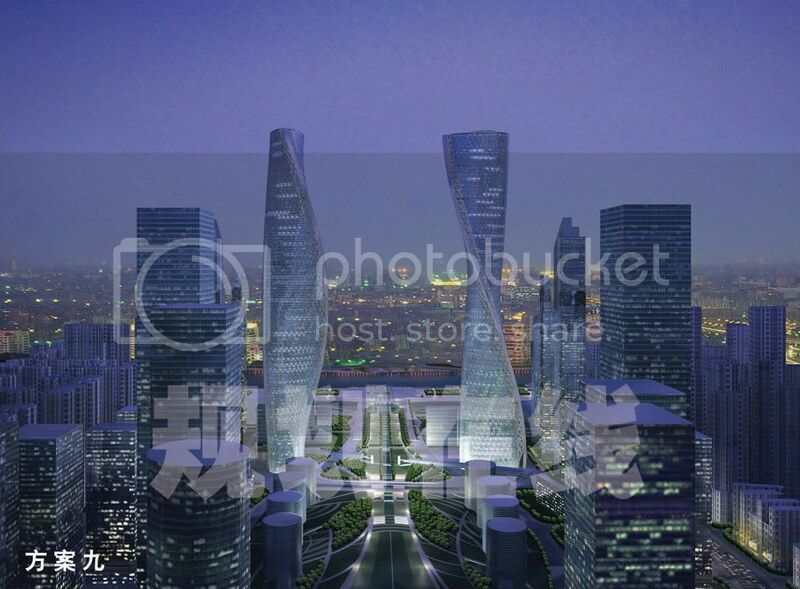 SHENYANG | Shenyang New World International Convention and Exhibition Center (Proposed): 300m+, 70+ floors. 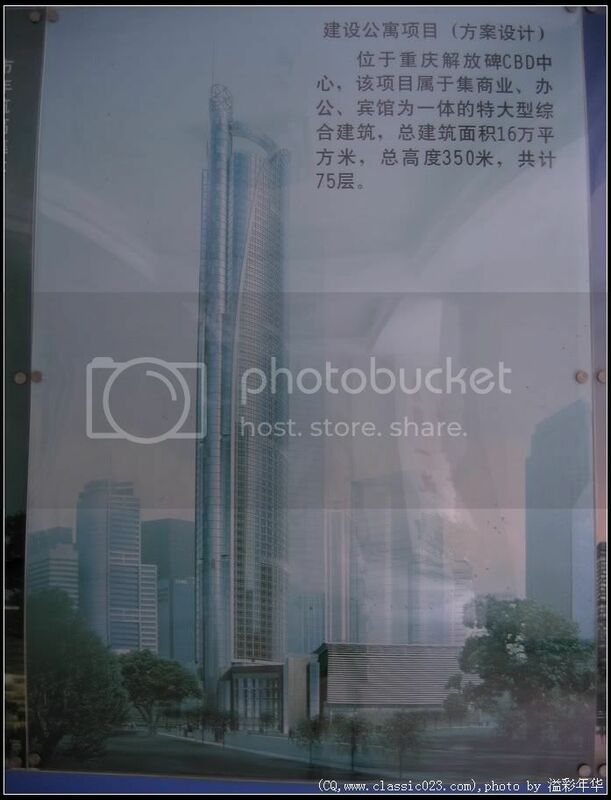 Nothing is new about this recently launched project composed by several towers but the possibility of a supertall around 70-80 floors within it. 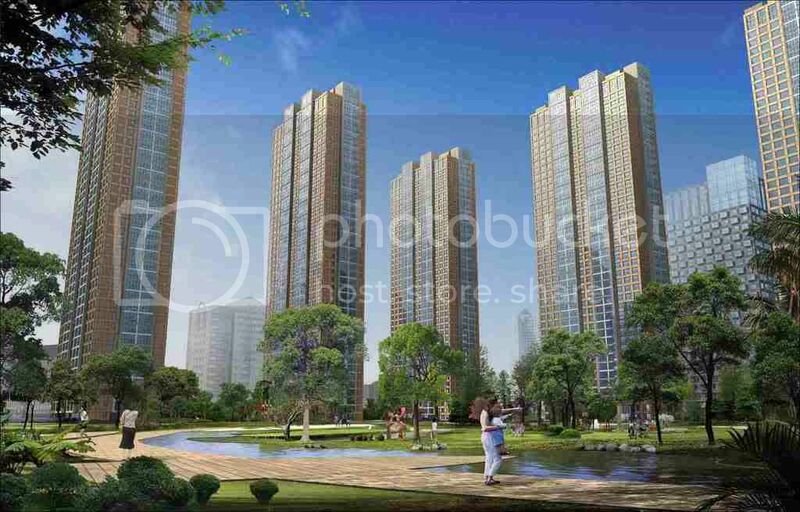 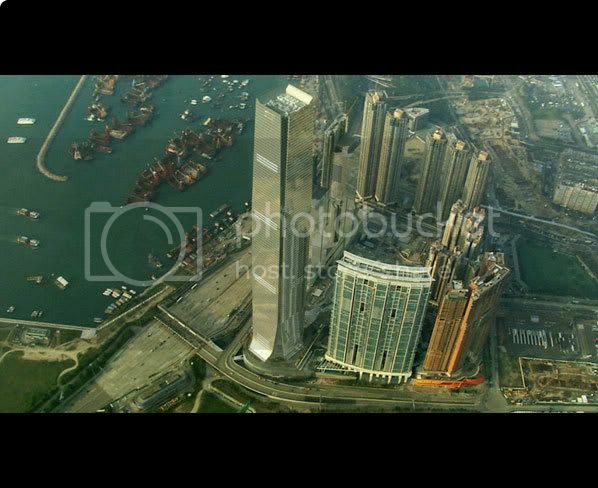 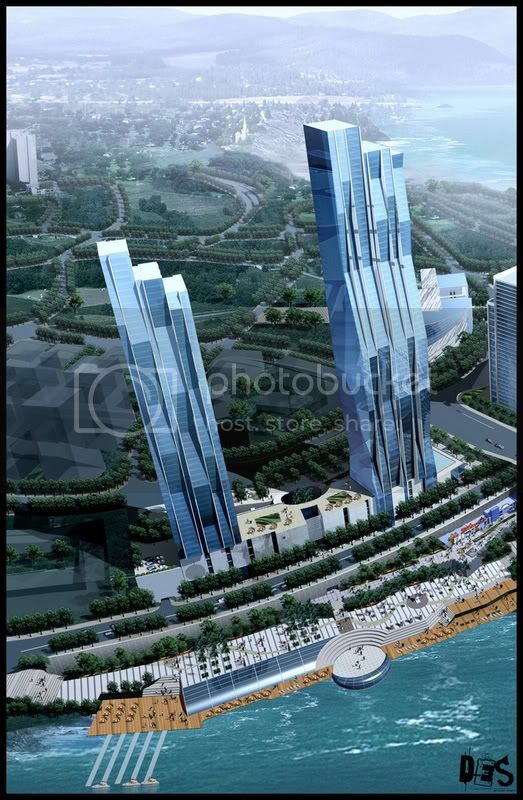 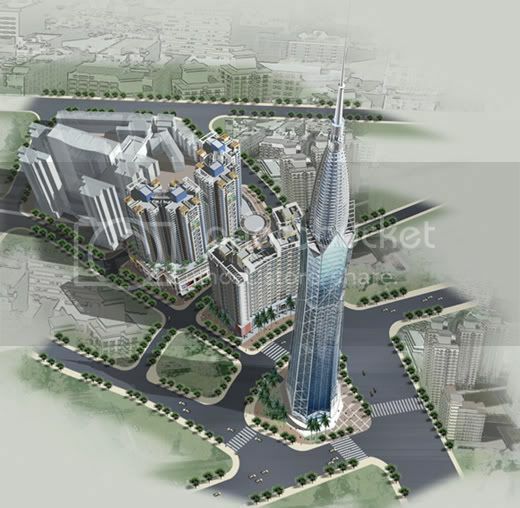 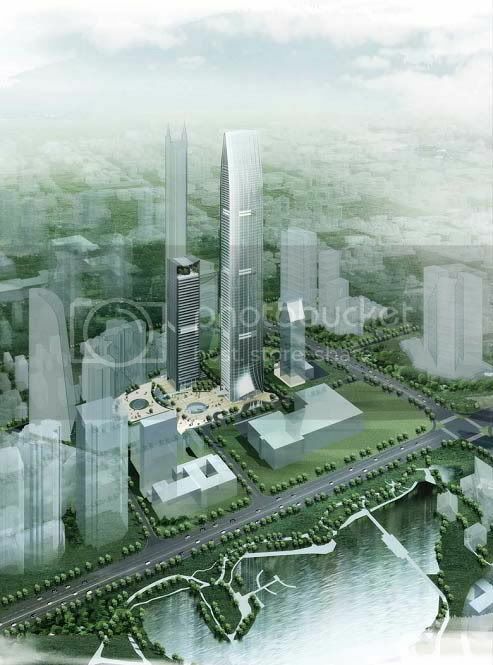 FOSHAN | R&F Project (Approved): 300m+, 80 floors. 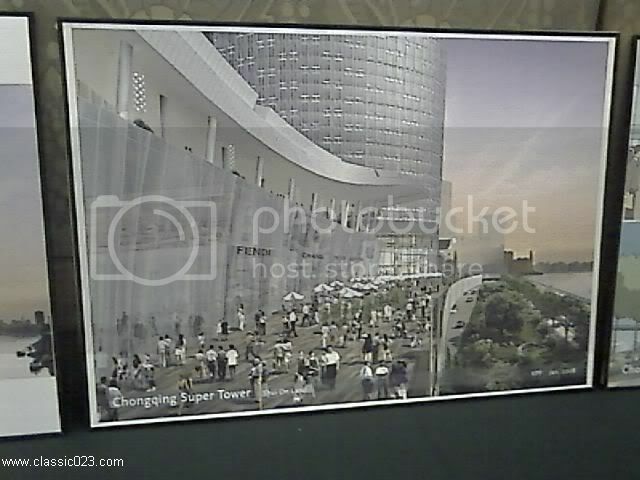 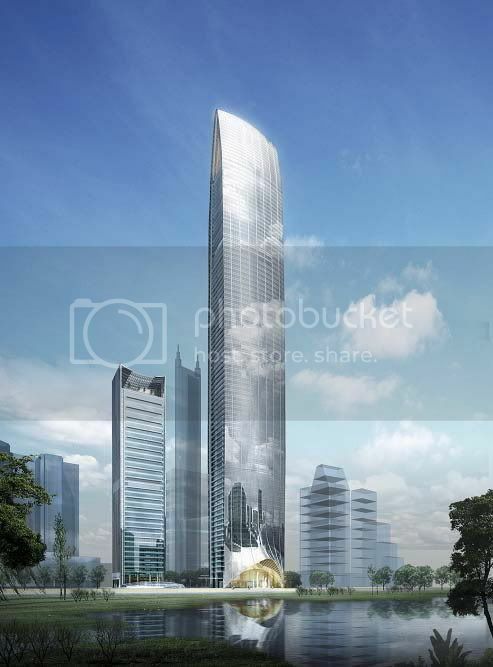 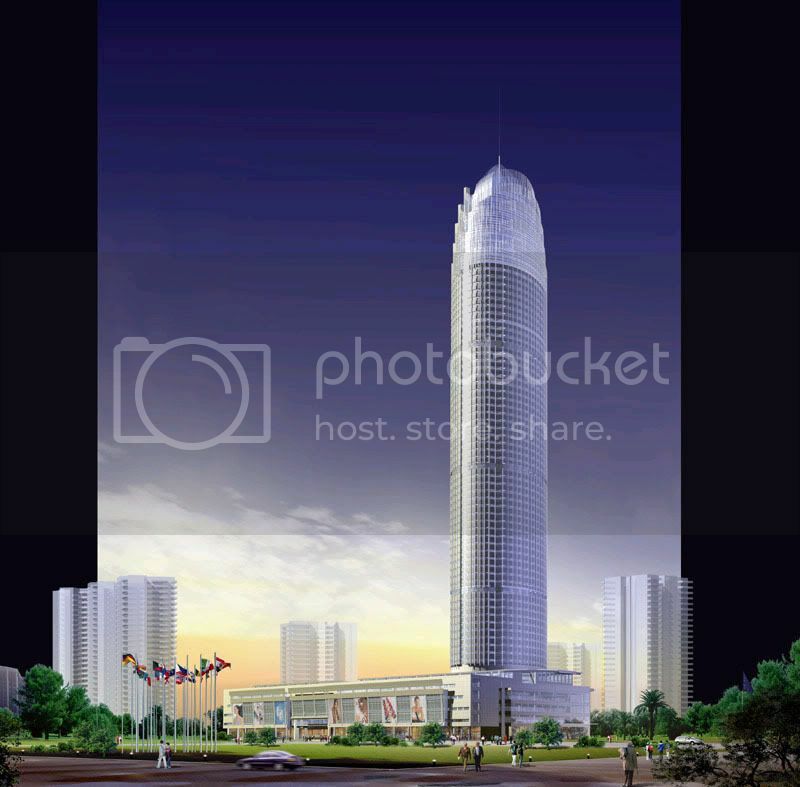 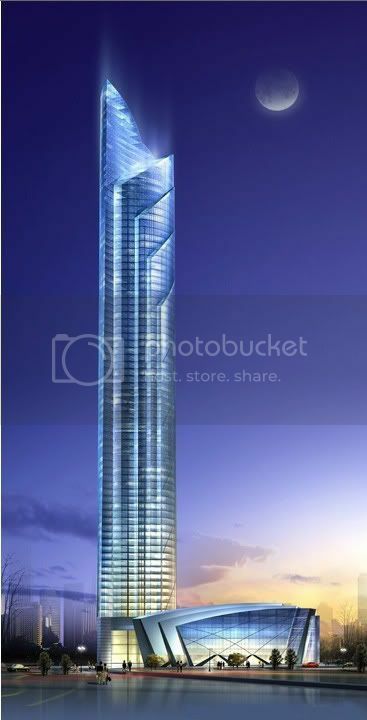 There aren’t available images of the supertall project being developer by R&F Properties in Foshan. 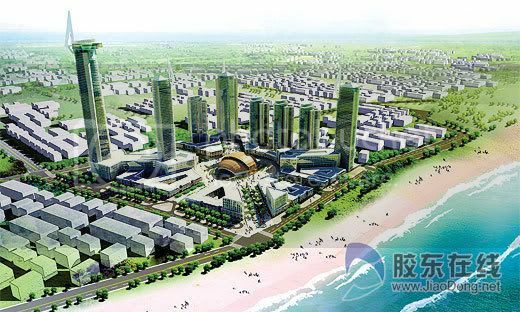 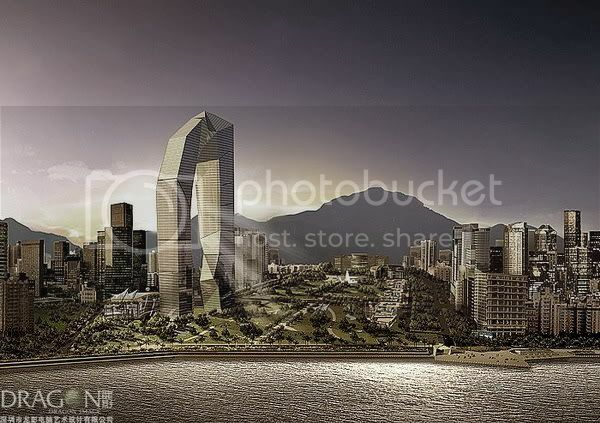 YANTAI | World Wine City (Proposed): 300m+, 77 floors This project has been released in late 2007 and there isn’t almost any info about it by the moment. 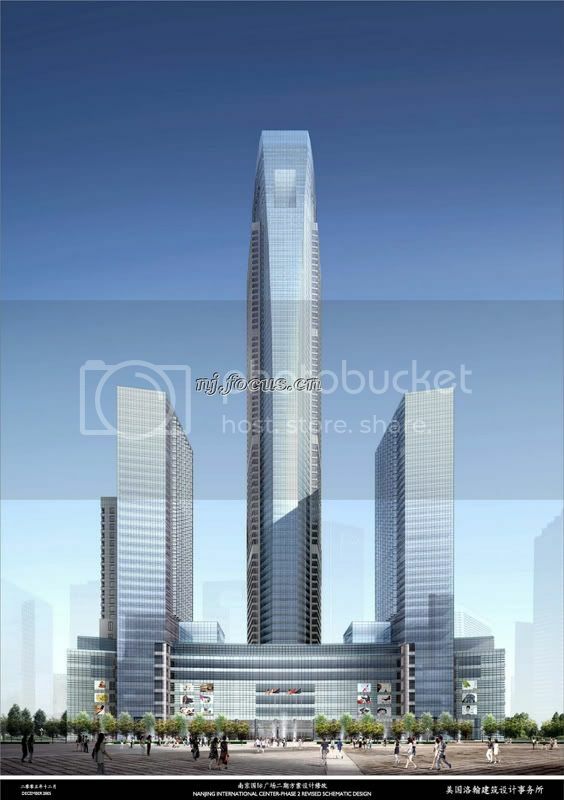 CHANGZHOU | Changzhou Supertall (Proposed): 300m+, 70 floors There isn’t much information out by the moment about this project..
YIWU | Yiwu World Trade Center (Proposed): 300m+, 70~ floors This building will be the main landmark of the financial district proposed for Yiwu city. 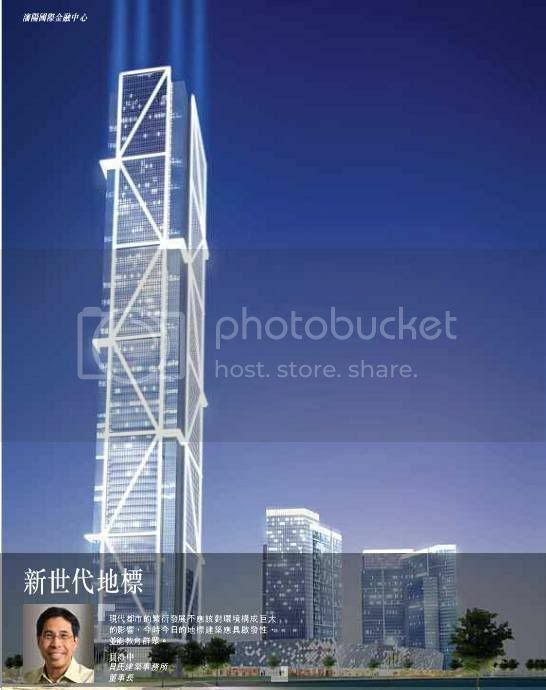 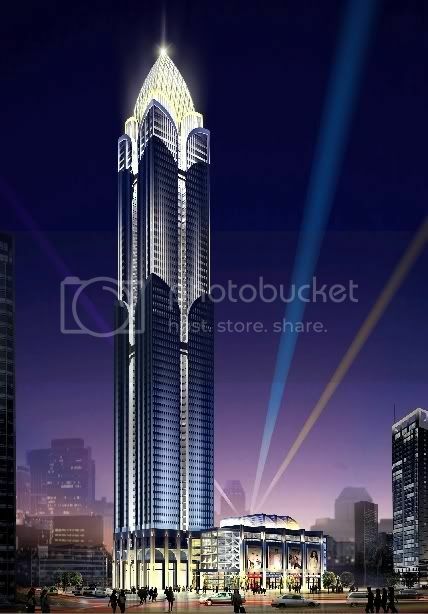 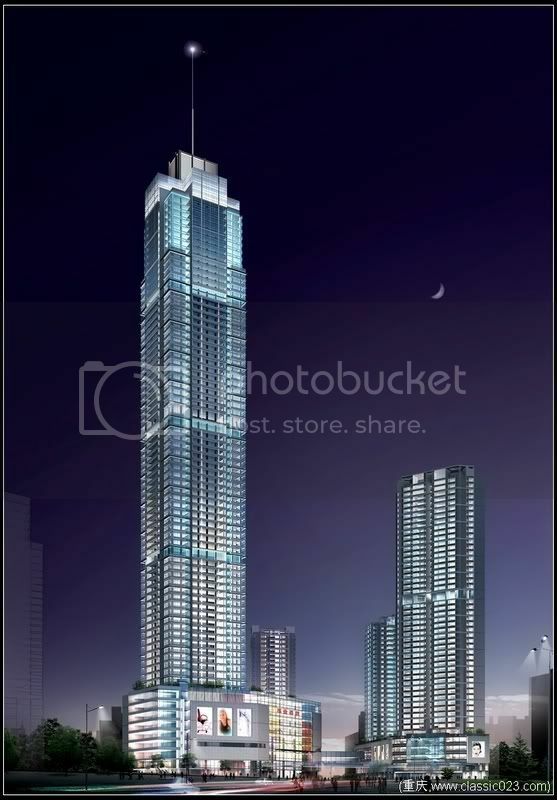 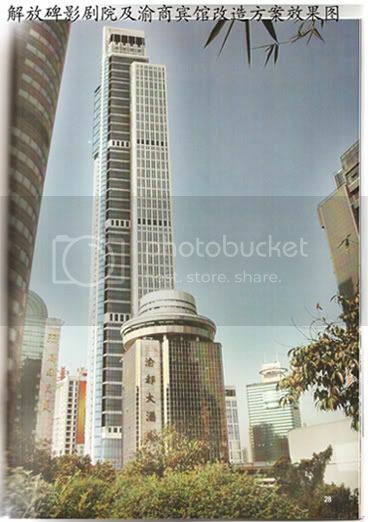 SHENZHEN | East Pacific Center (Approved): 300m+, 70~ floors. 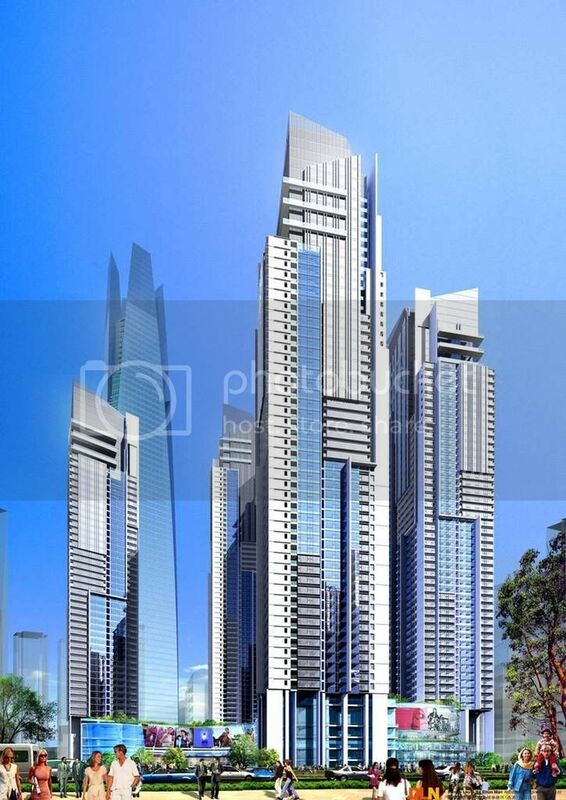 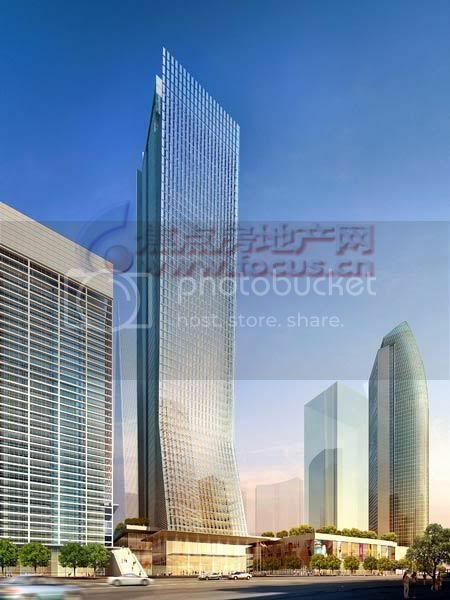 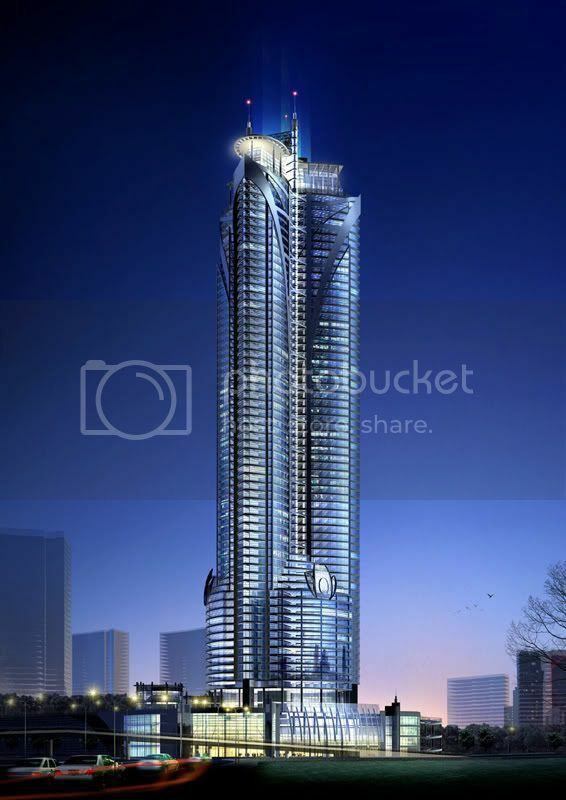 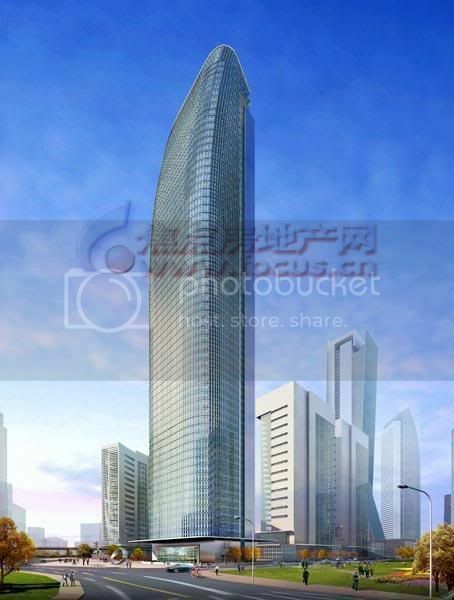 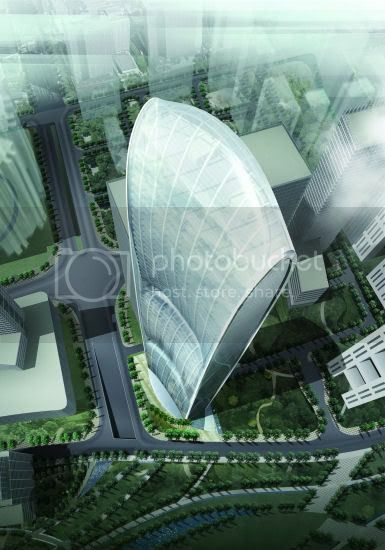 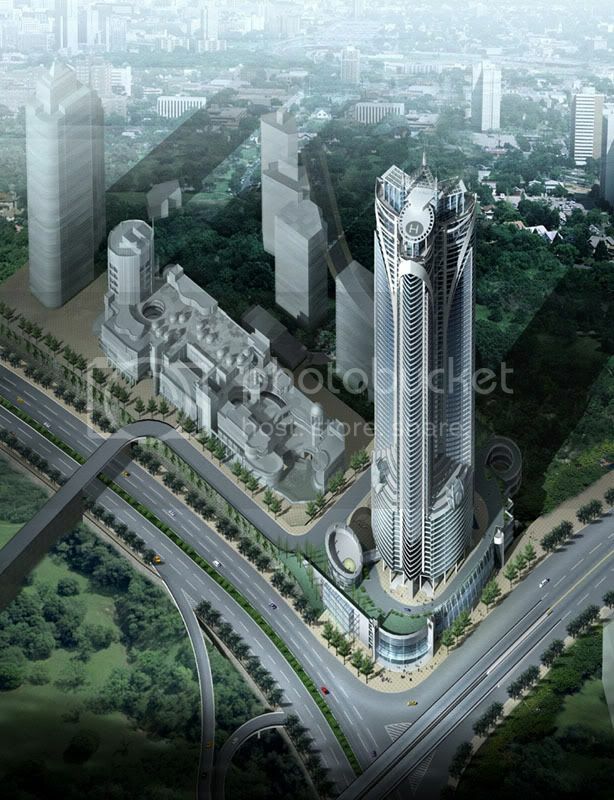 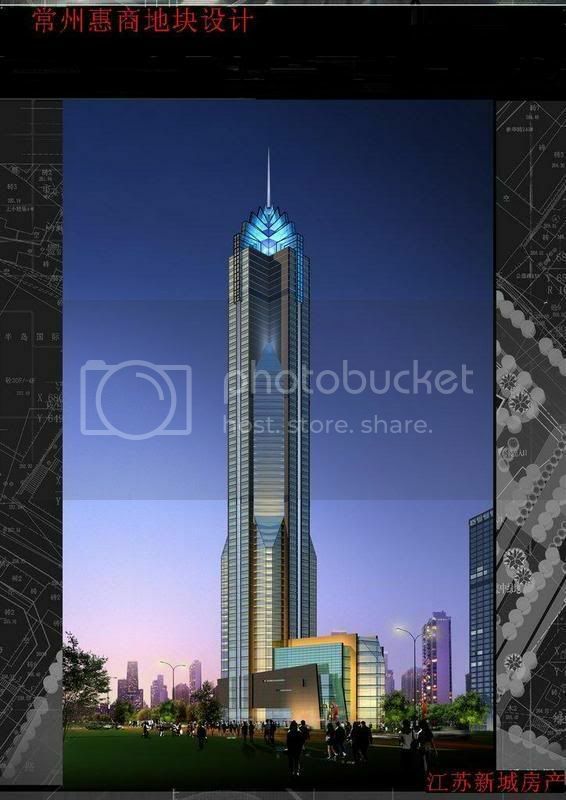 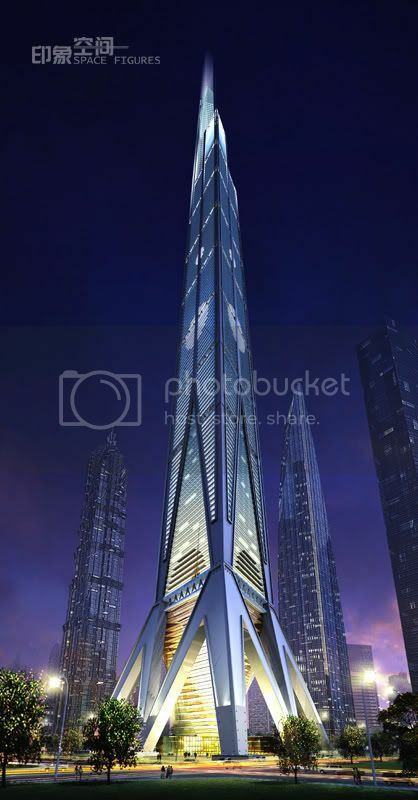 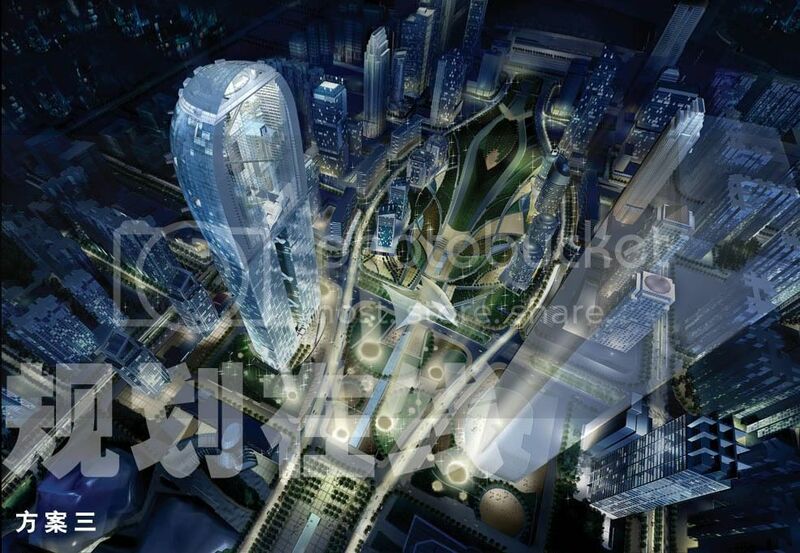 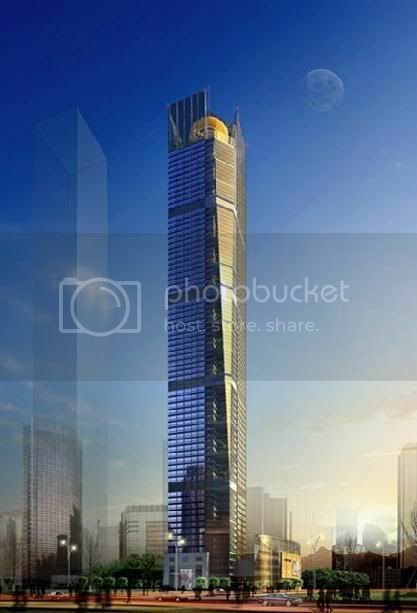 This supertall project developed by Excellence group is still under design. 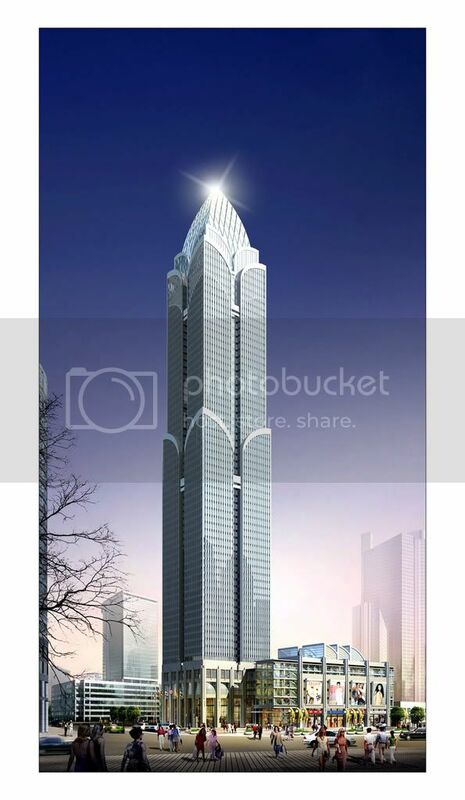 CHONGQING | Danzishi Supertall (Approved): 300m+. 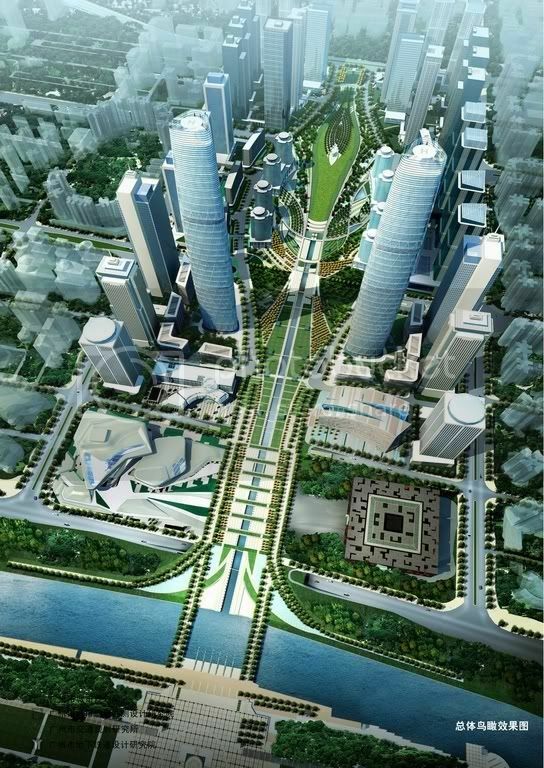 Danzishi is expected to host the third phase of Chongqing CBD after Jiefangbei and Jiangbei New City. 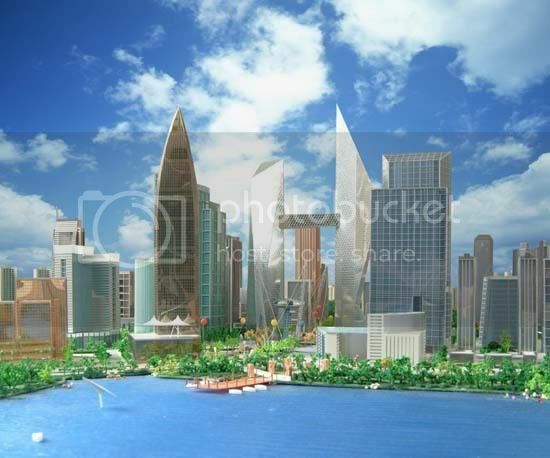 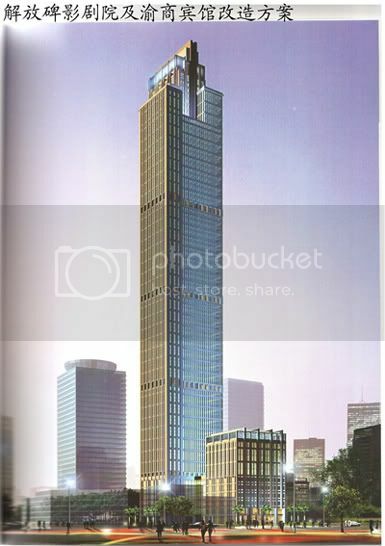 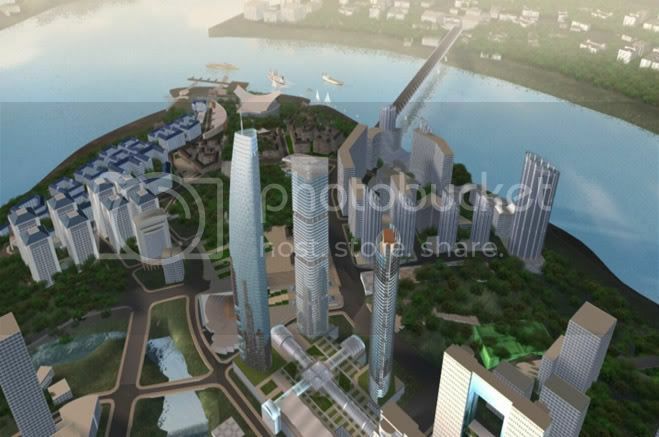 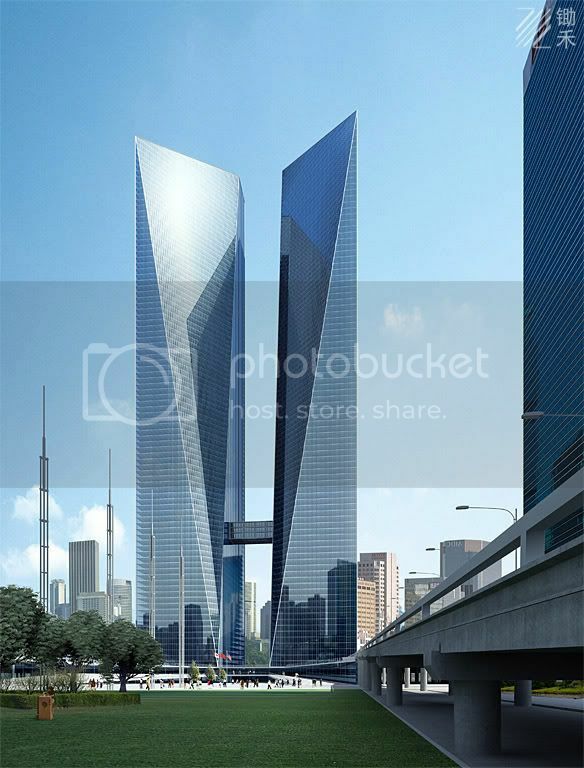 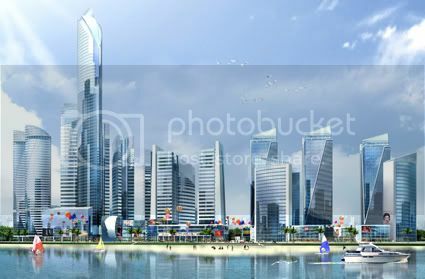 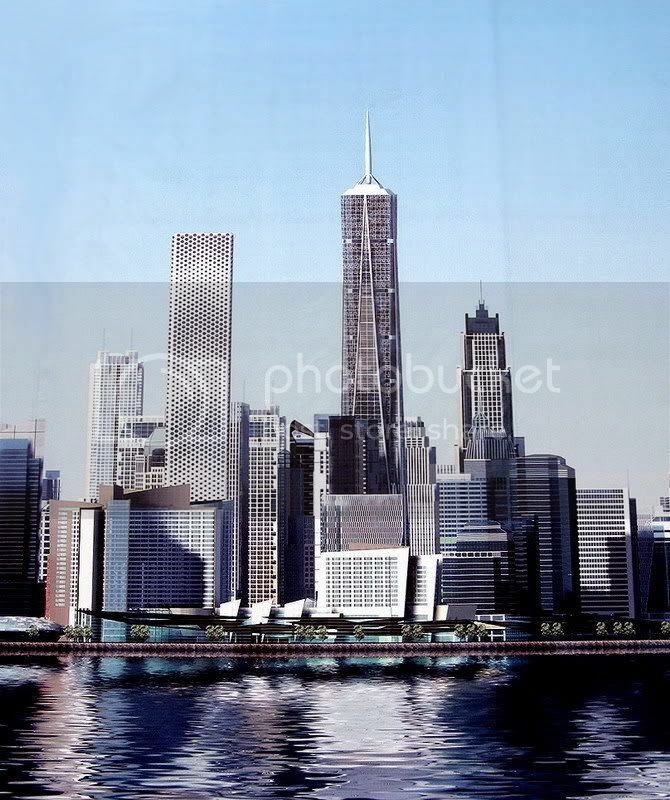 The concept renders show a supertall project there. 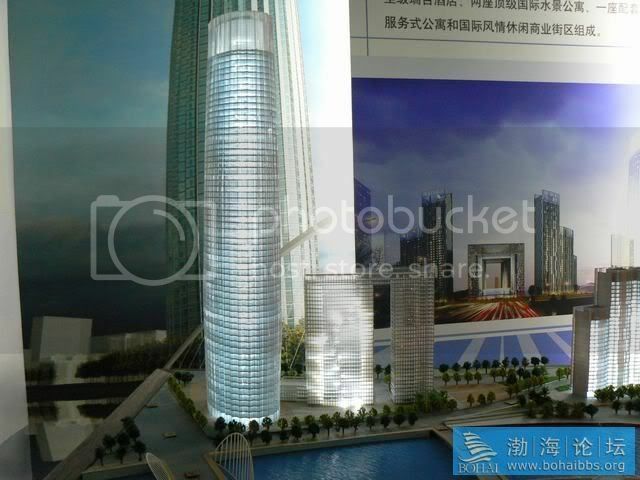 TIANJIN | Tianjin International Trade Center (On hold) 300m, 80 floors. 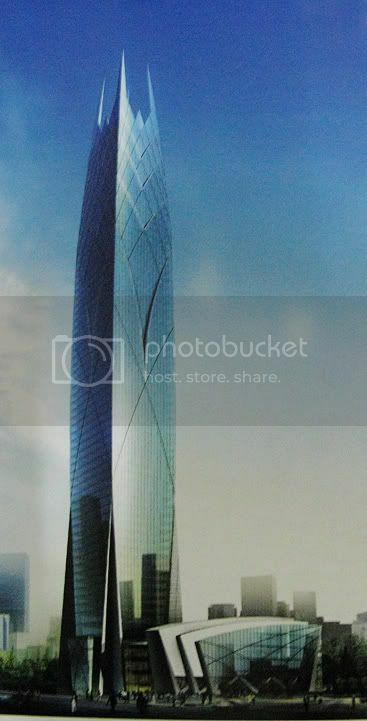 This tower located at the CBD of Tianjin has been on hold for several years. 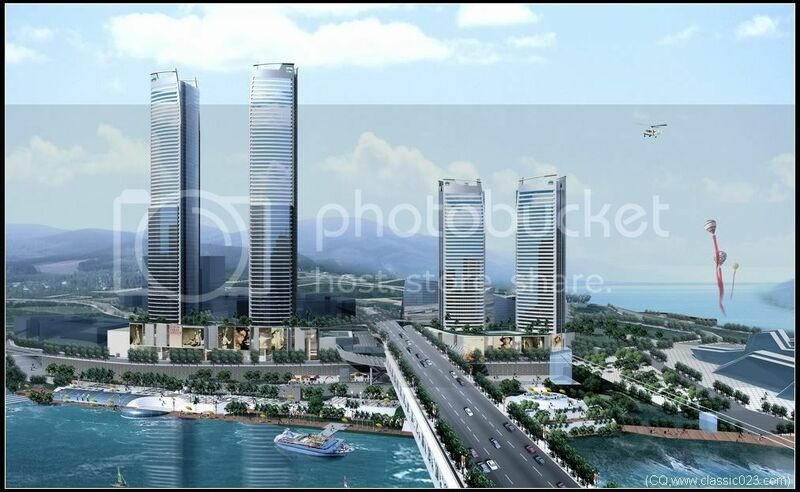 Construction works have been announced to be resumed for several times, but no progress has been made by the moment. 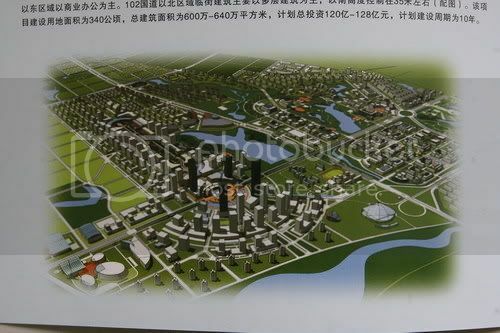 CHANGCHUN | Changchun Shimao City (Concept proposal): 2x300m. 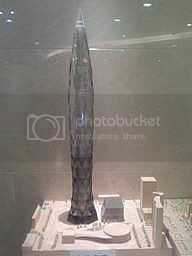 There is no clear information about his project by the moment. 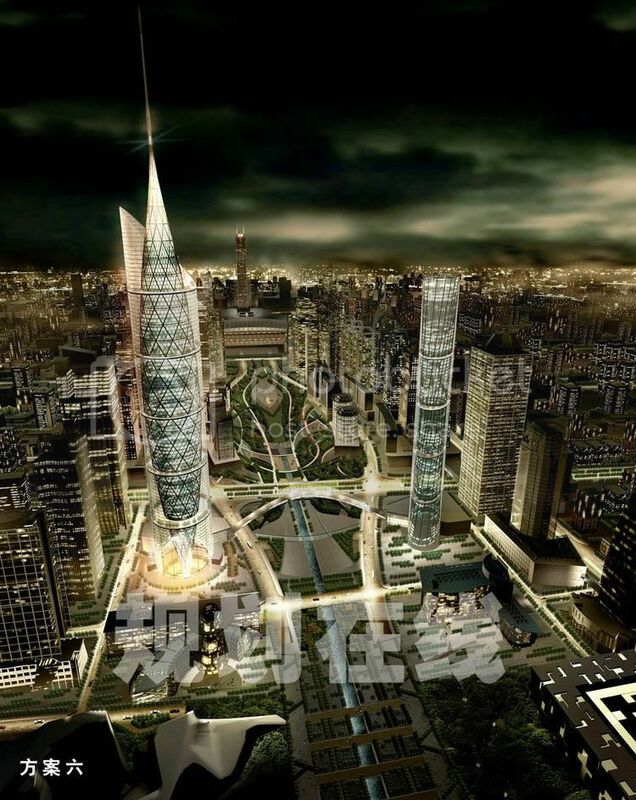 Shimao Group announced that two 300m towers will be built in this new development. 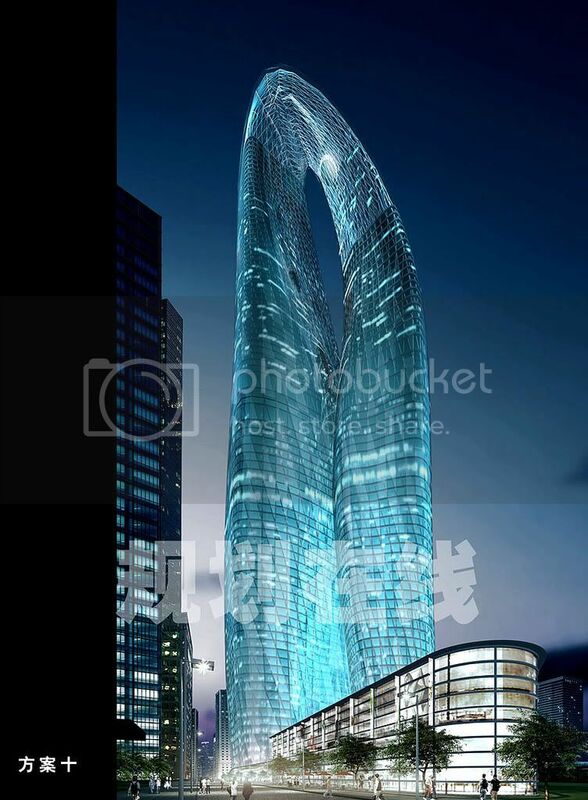 CHONGQING | Triumph Tower (Proposed): 300m~, 75 floors. 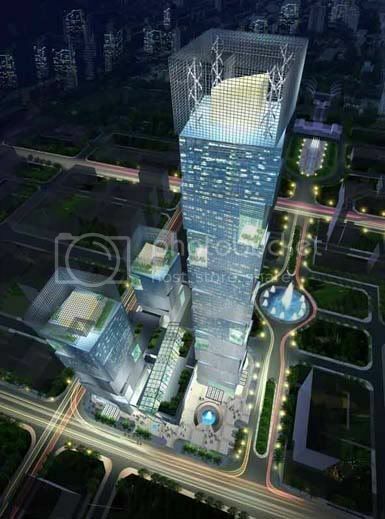 One of the most unknown projects in Jiefangbei, located next to Century Star Plaza project. 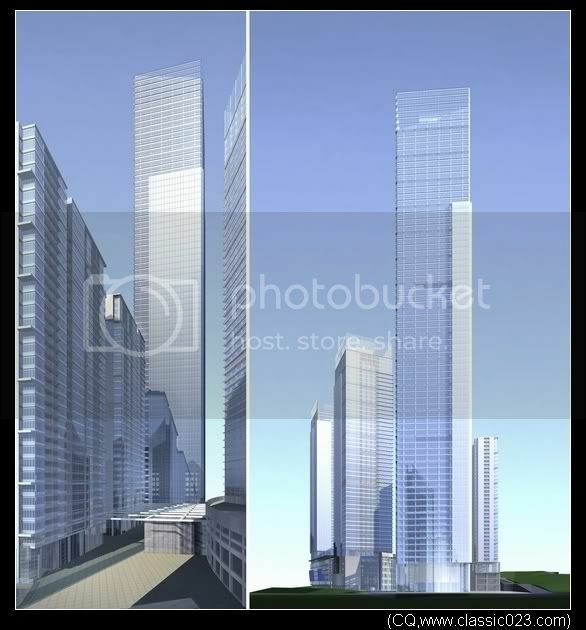 Possible supertall. 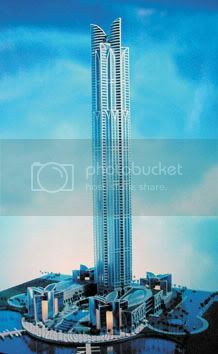 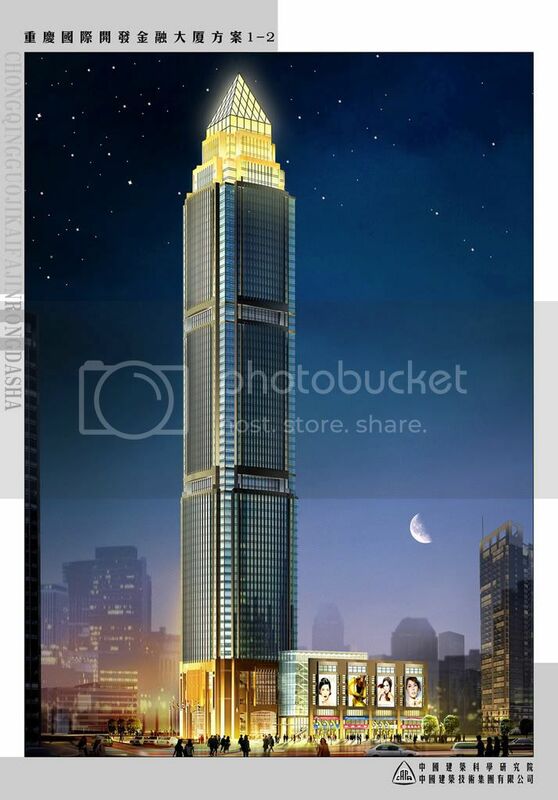 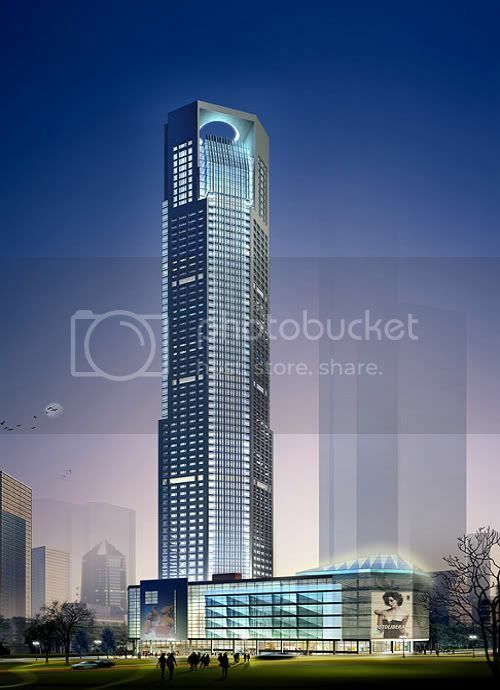 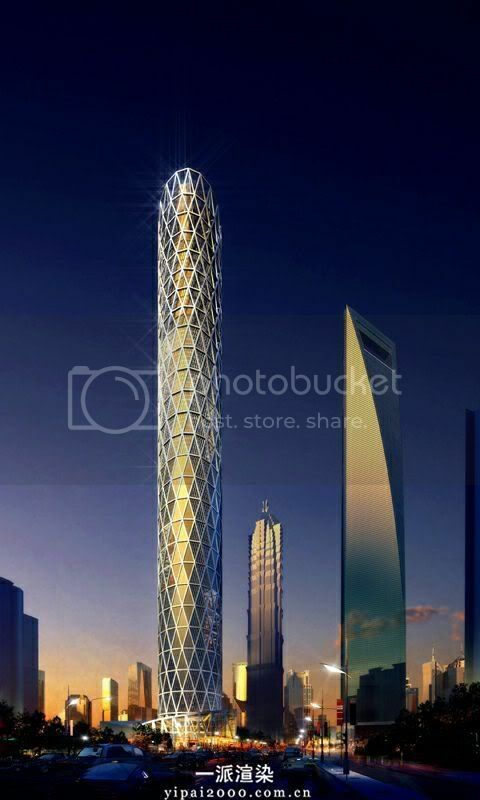 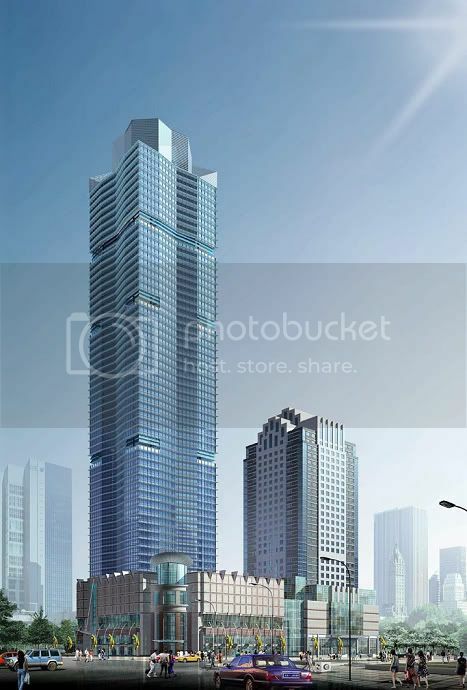 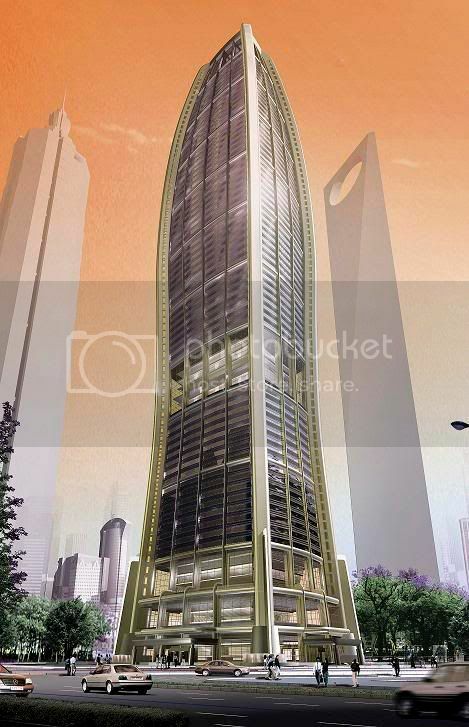 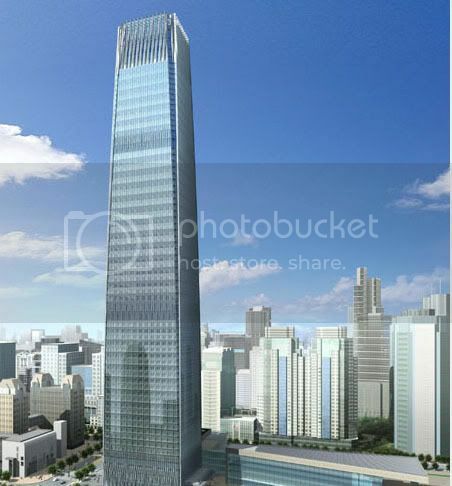 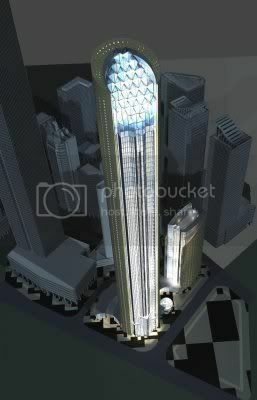 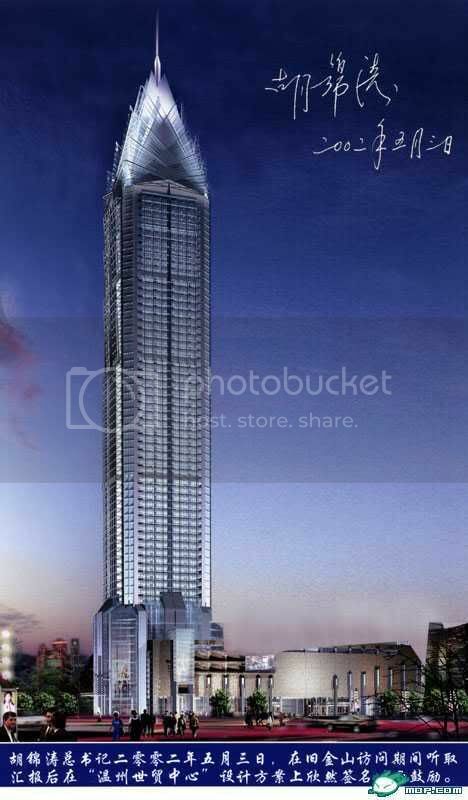 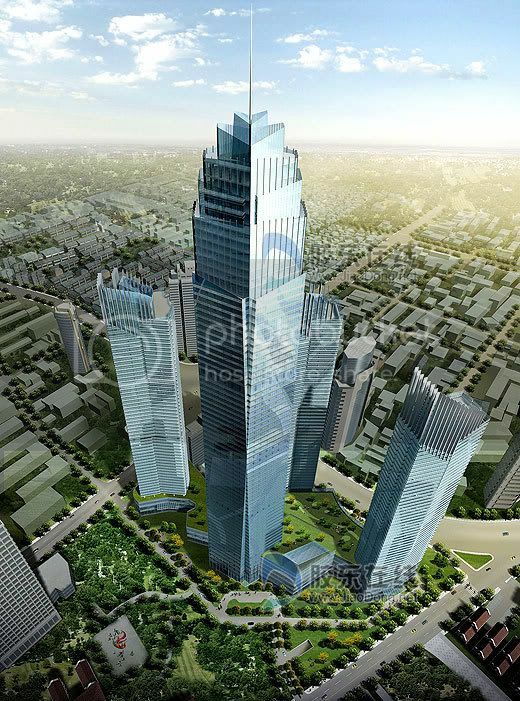 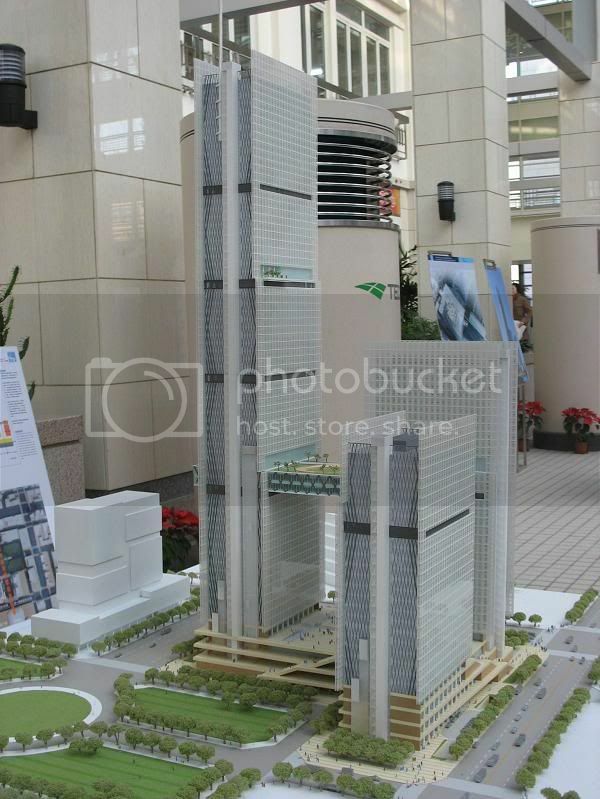 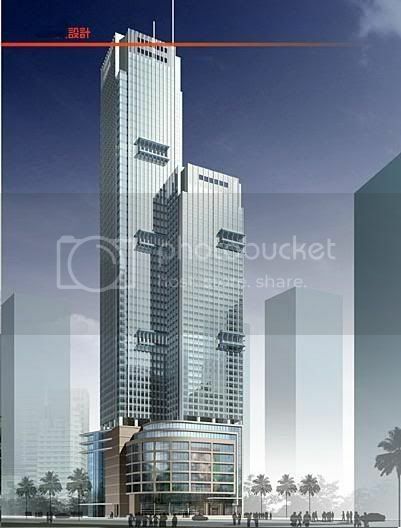 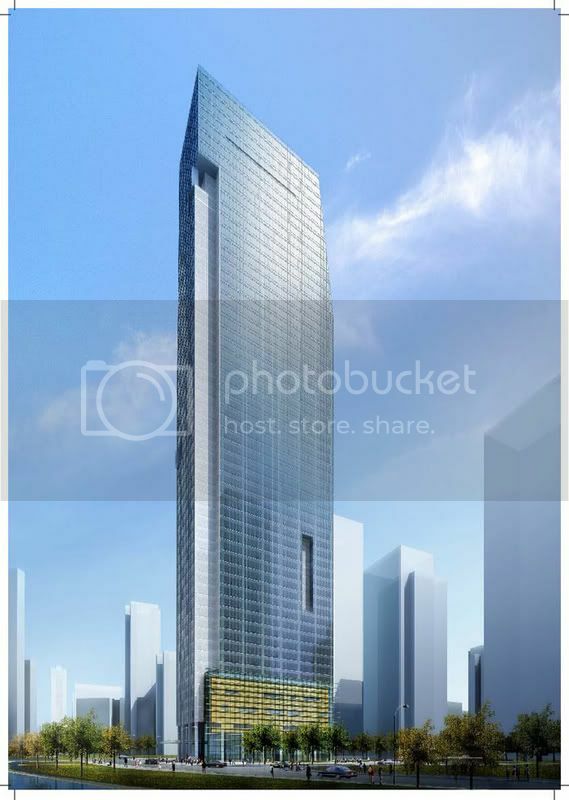 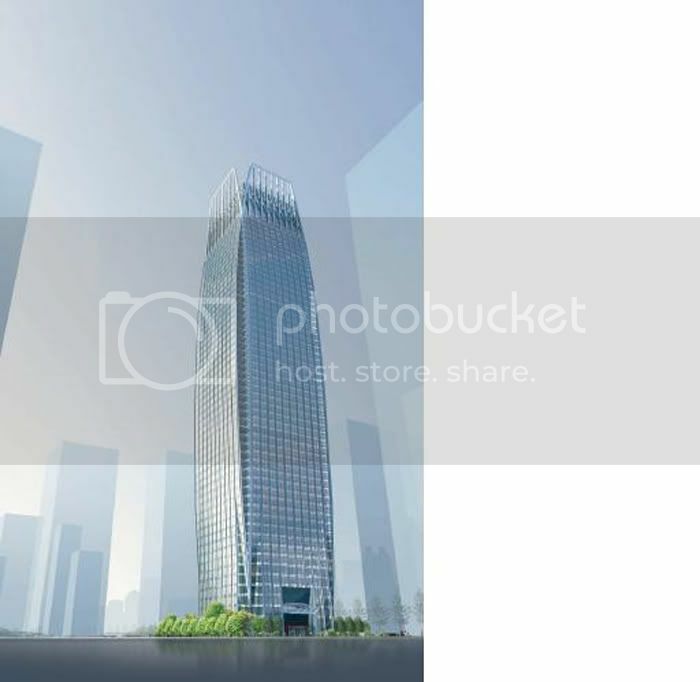 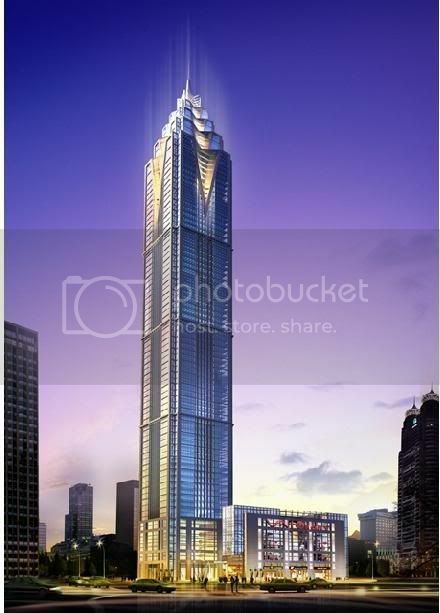 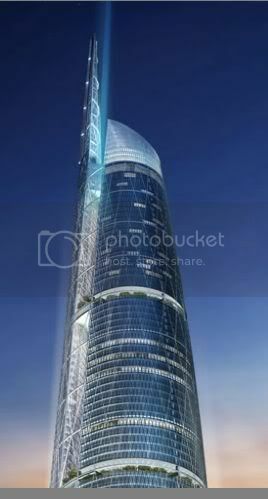 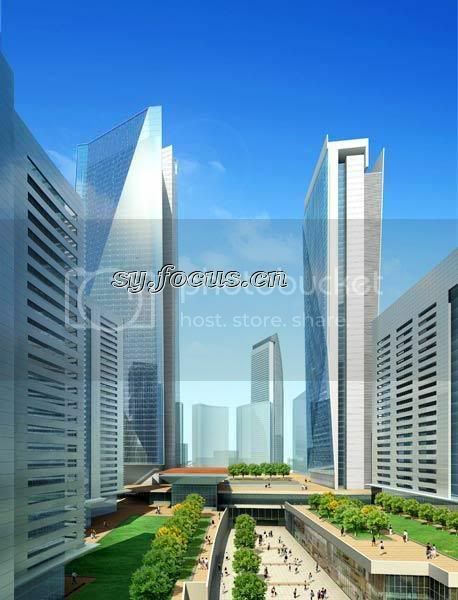 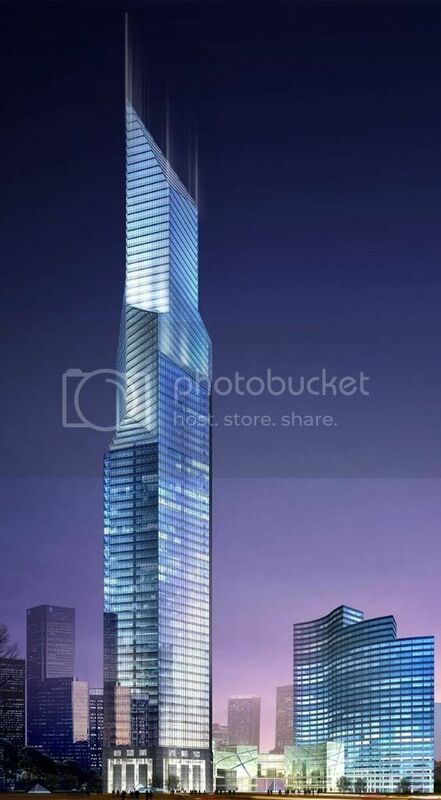 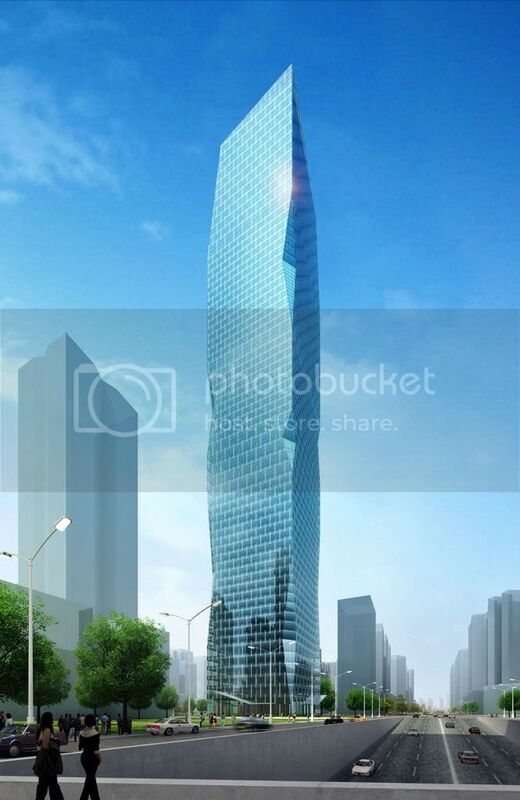 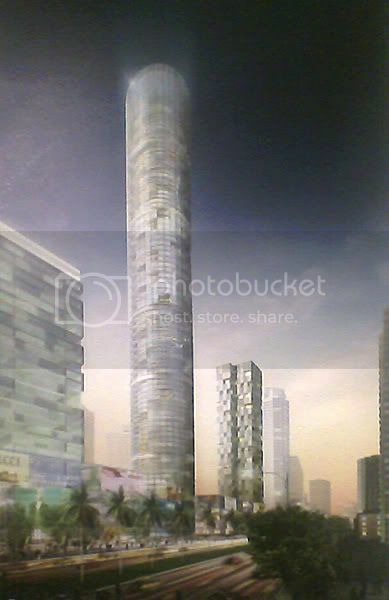 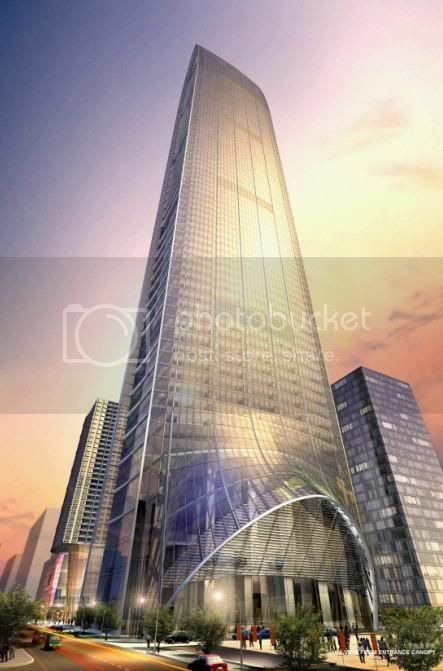 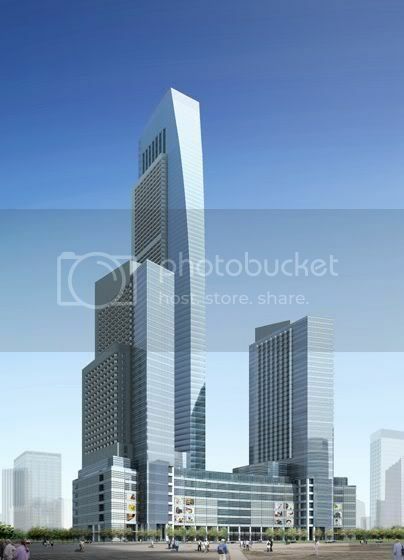 TIANJIN | Xiao Bai Lou Union Plaza (Approved): 300m~, 73 floors. 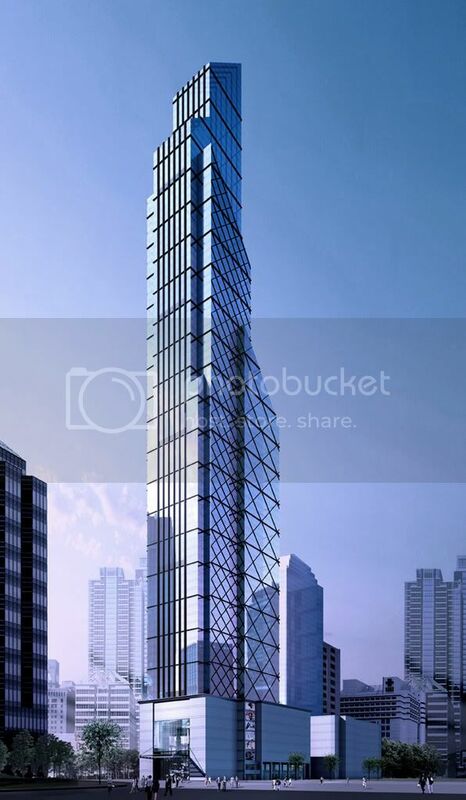 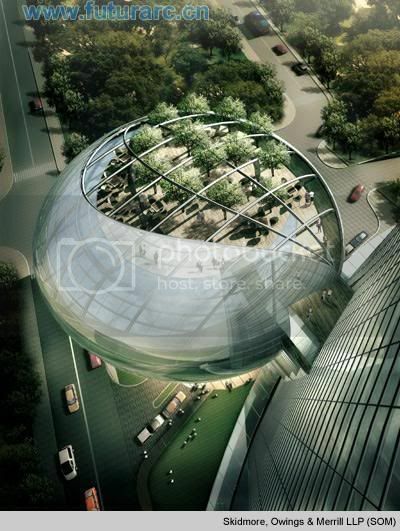 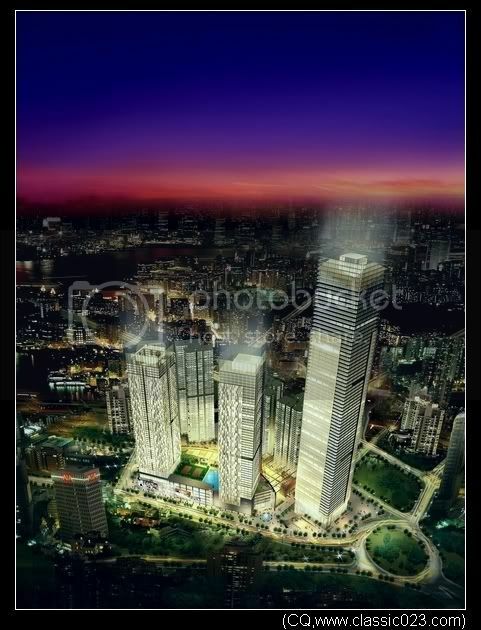 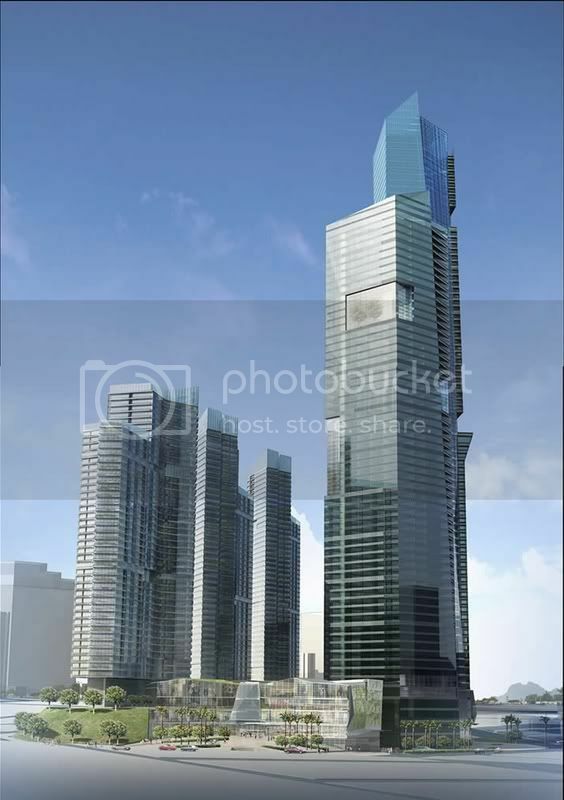 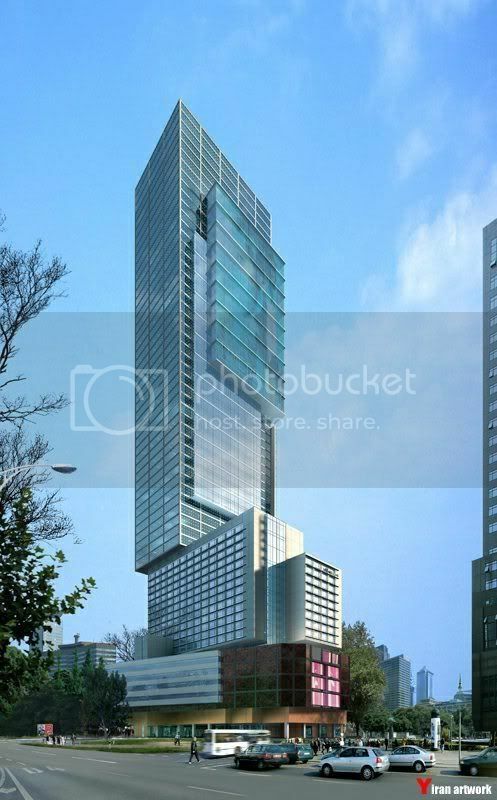 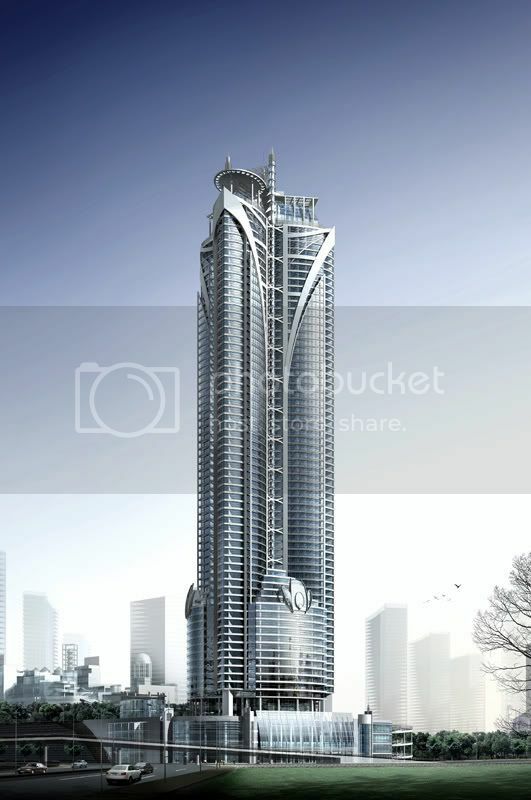 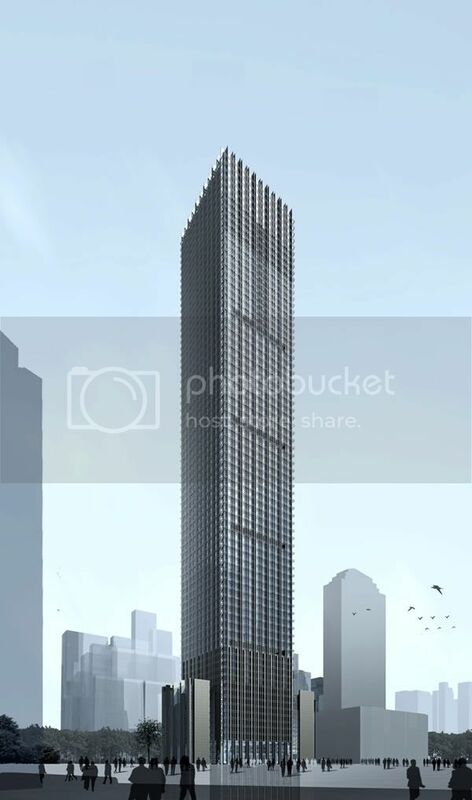 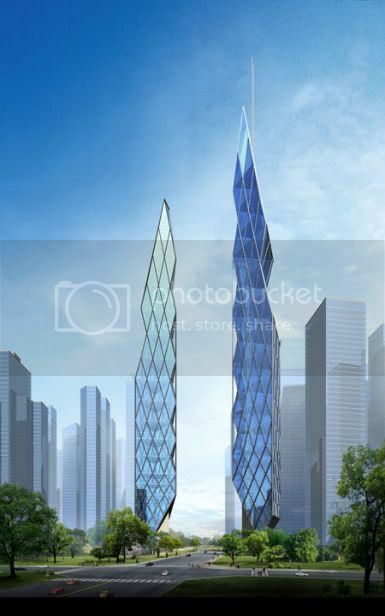 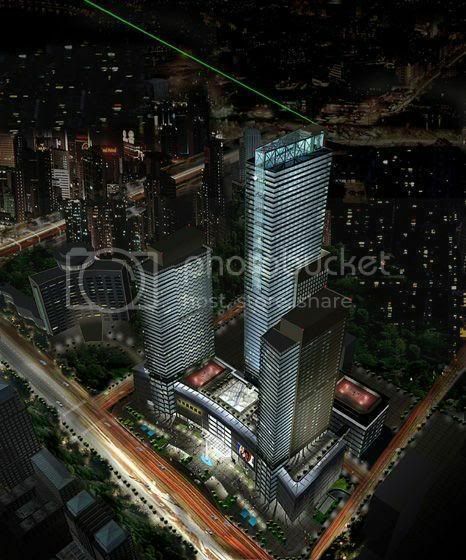 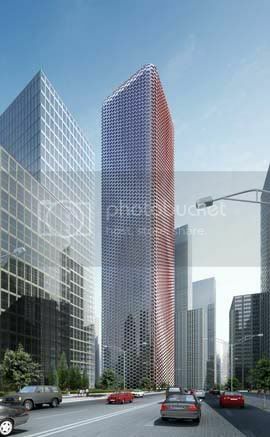 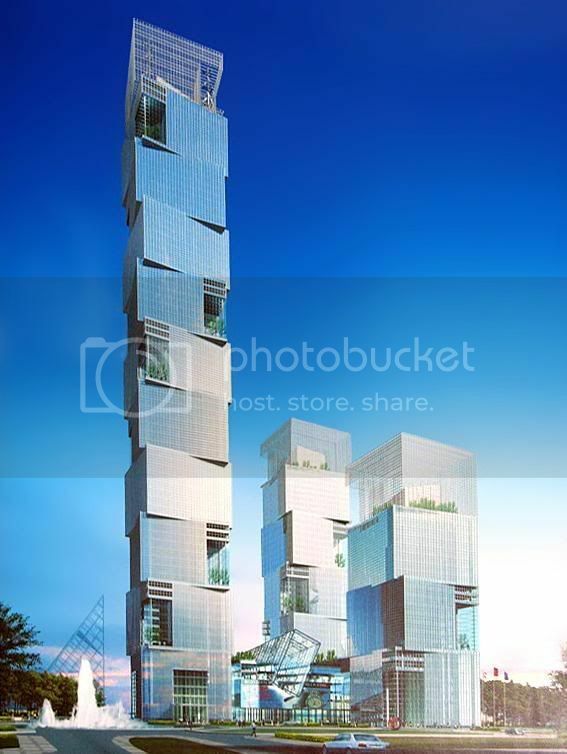 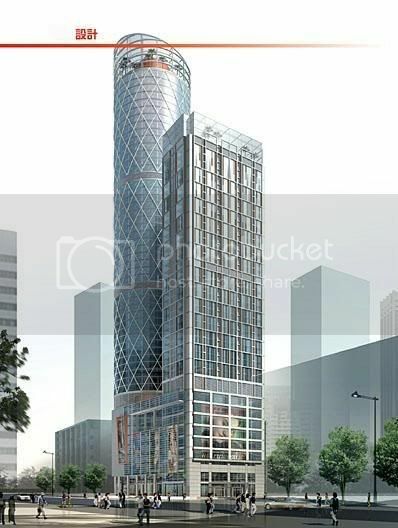 This project by RSP architects shall be started soon in Xiaobailou CBD, final height unknown. 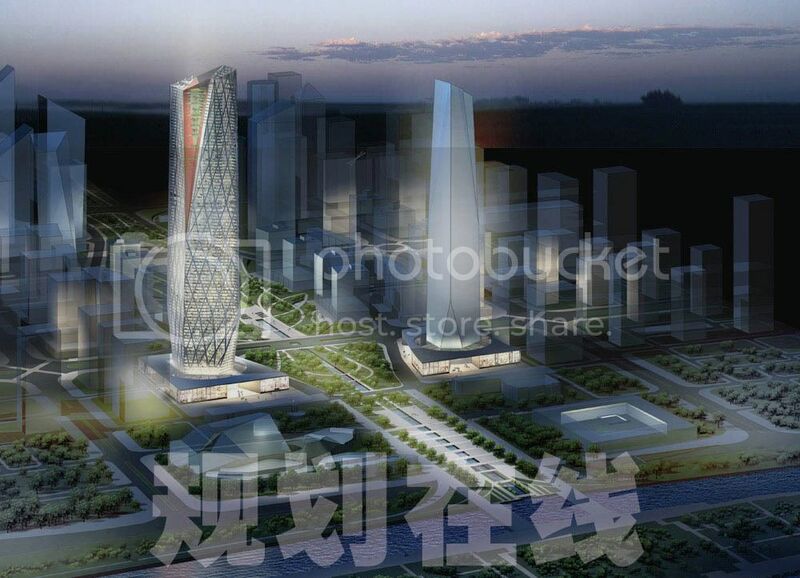 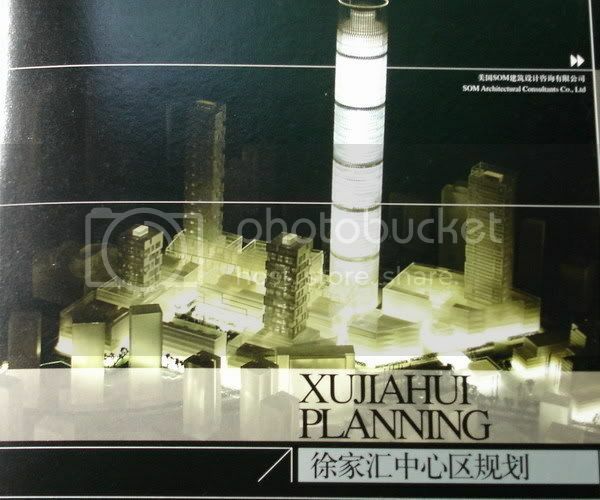 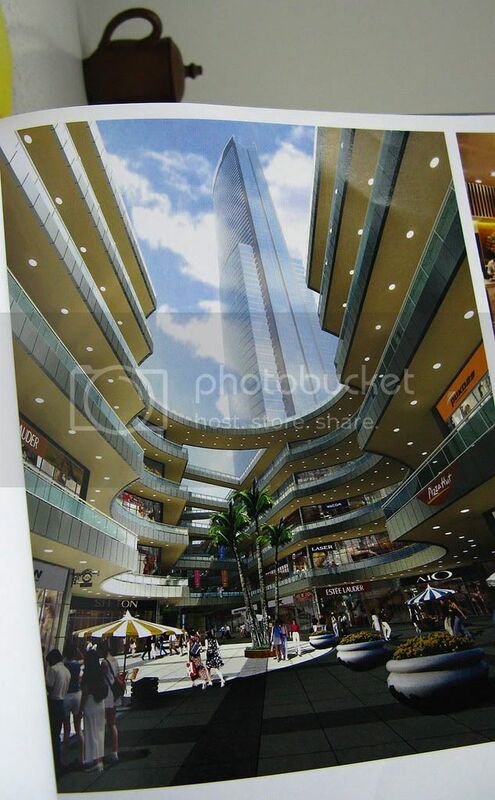 WUXI | Jinkui Plaza (Proposed): 300m~, 70 floors There’re several proposals for this coming project. 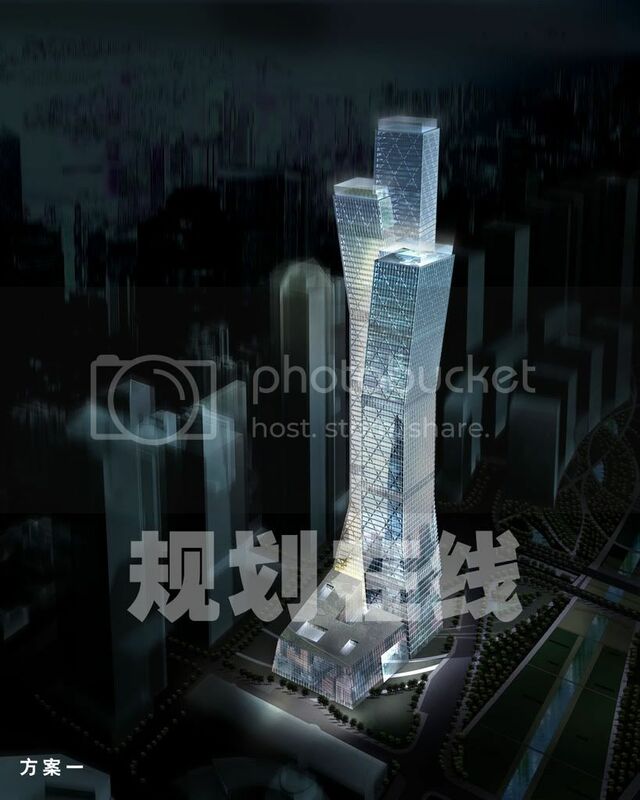 SHENZHEN | Yantian Center (Concept proposal): 300m~, 70 floors. 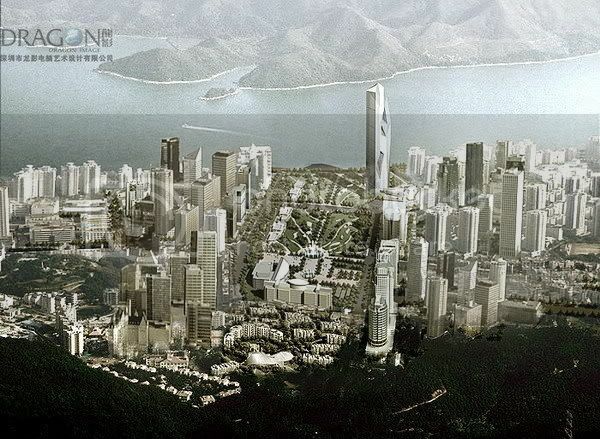 Concept proposal for Shenzhen, no further info about it by the moment. 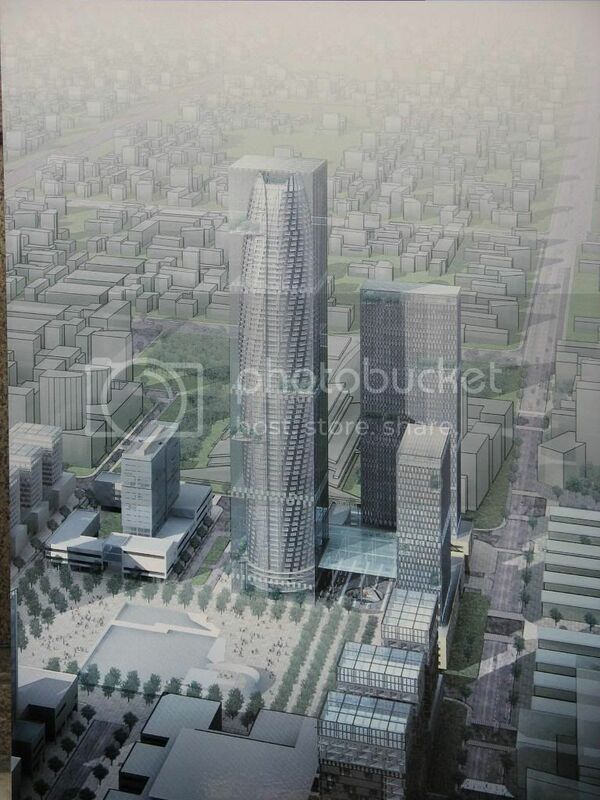 TIANJIN | South Station CBD Towers (Concept proposal): 4x300m~, 70~ floors. 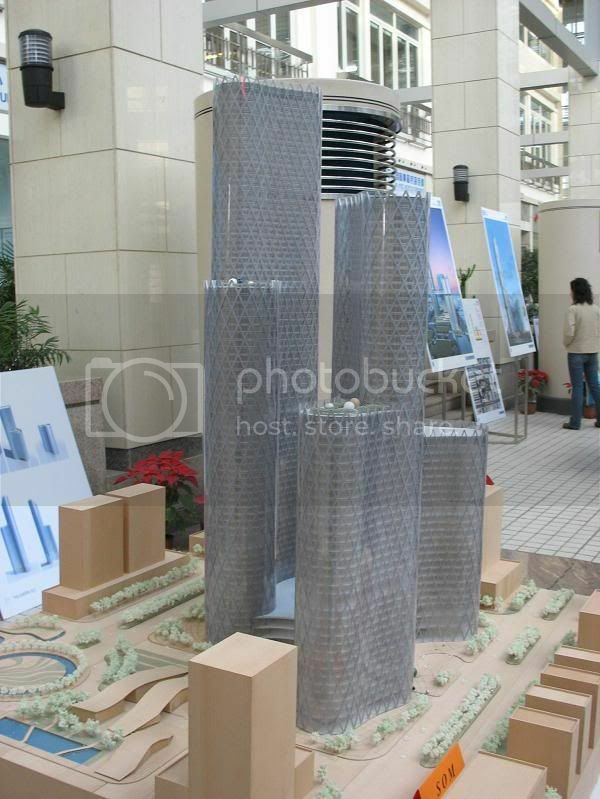 This project is still very conceptual, four towers around 70 floors are expected to be built. 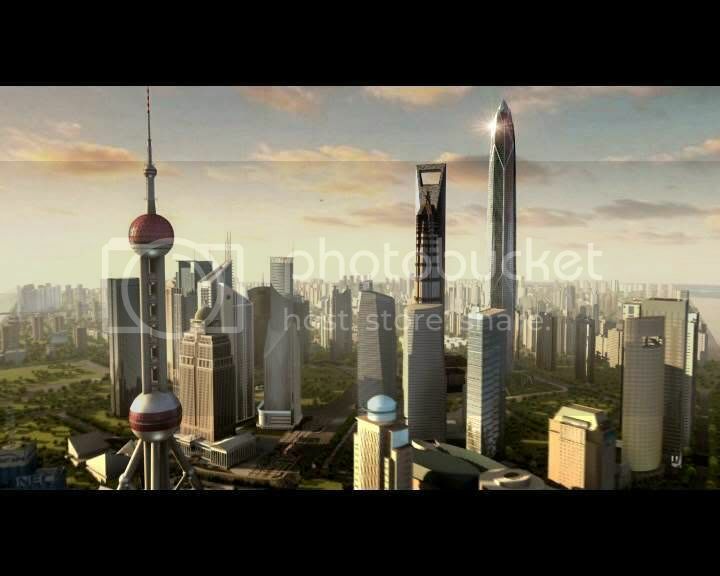 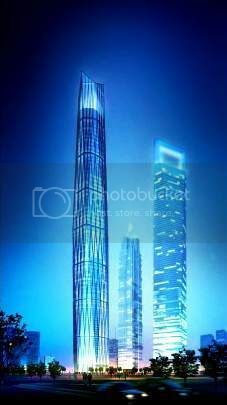 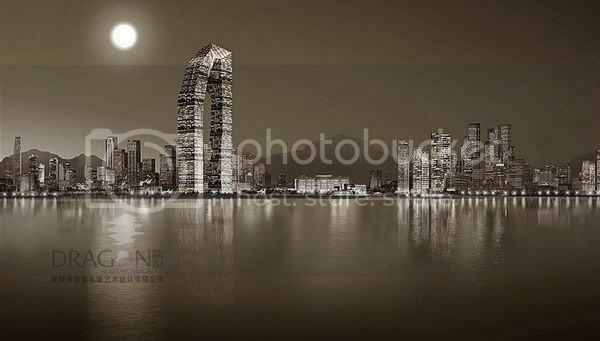 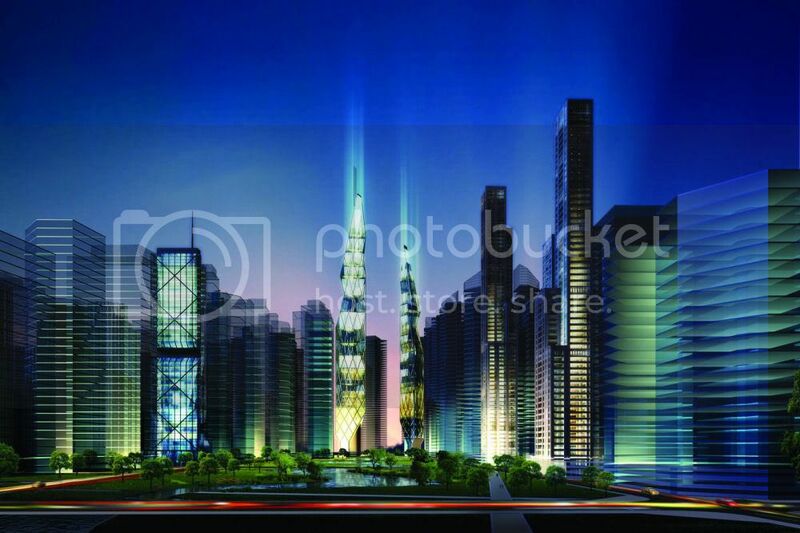 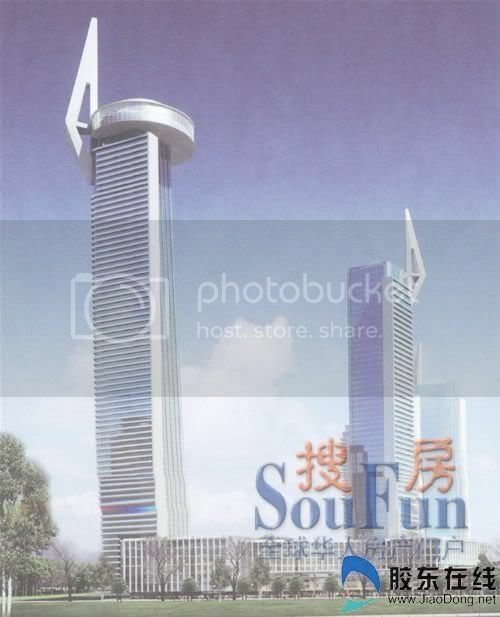 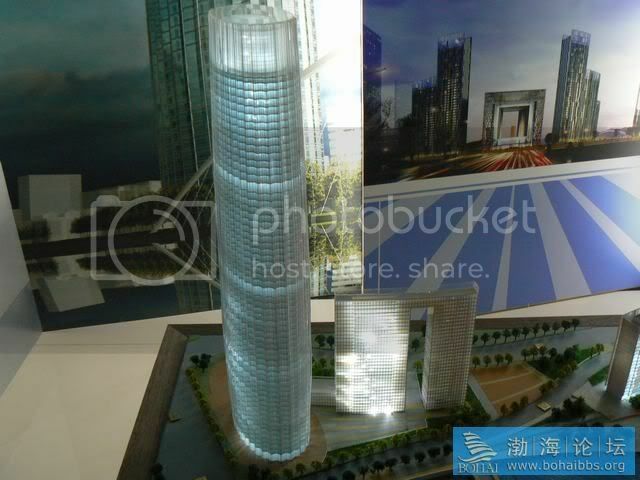 SUZHOU | Suzhou Twin Towers (Concept proposal): 300m~, 68 floors. 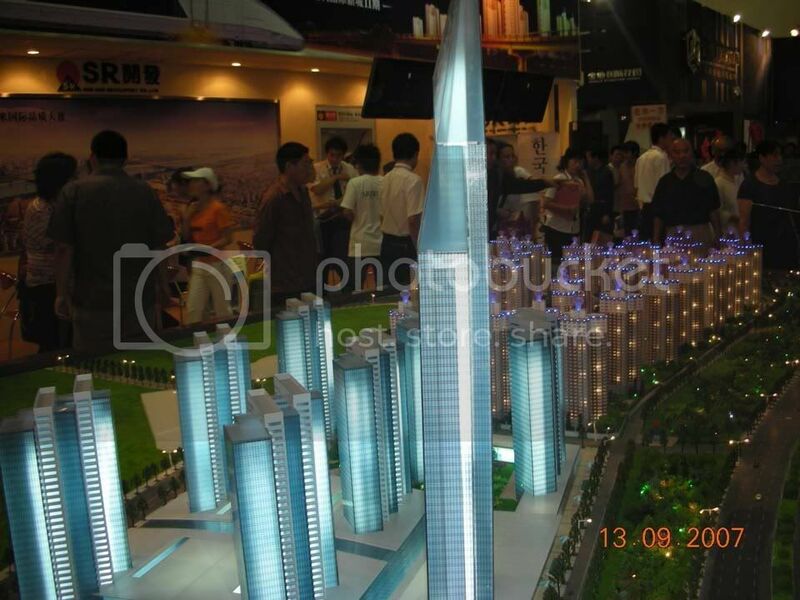 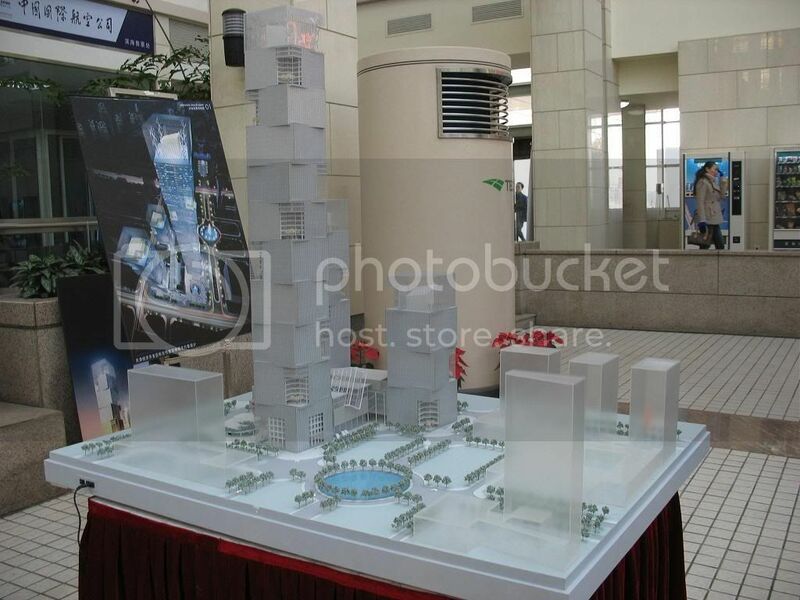 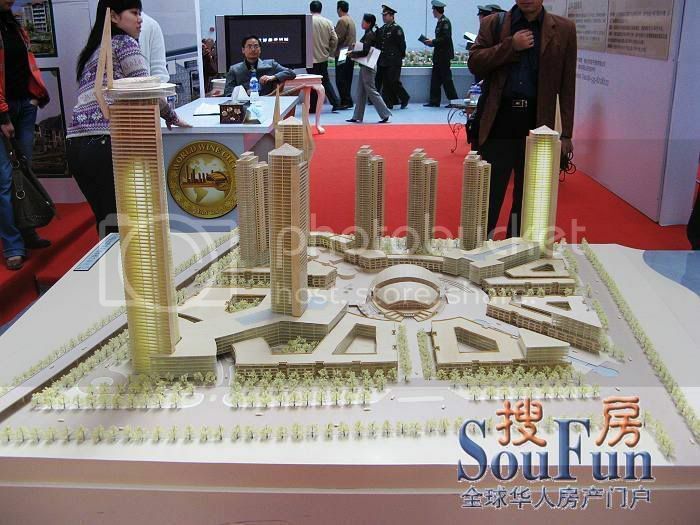 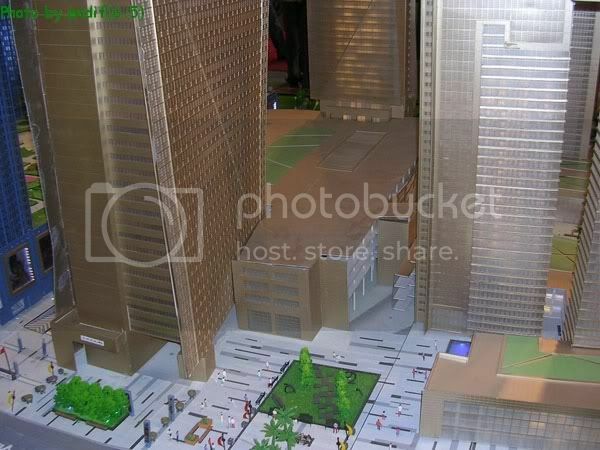 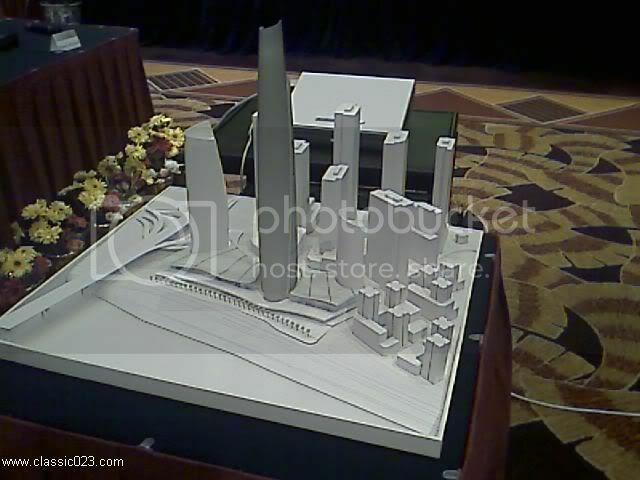 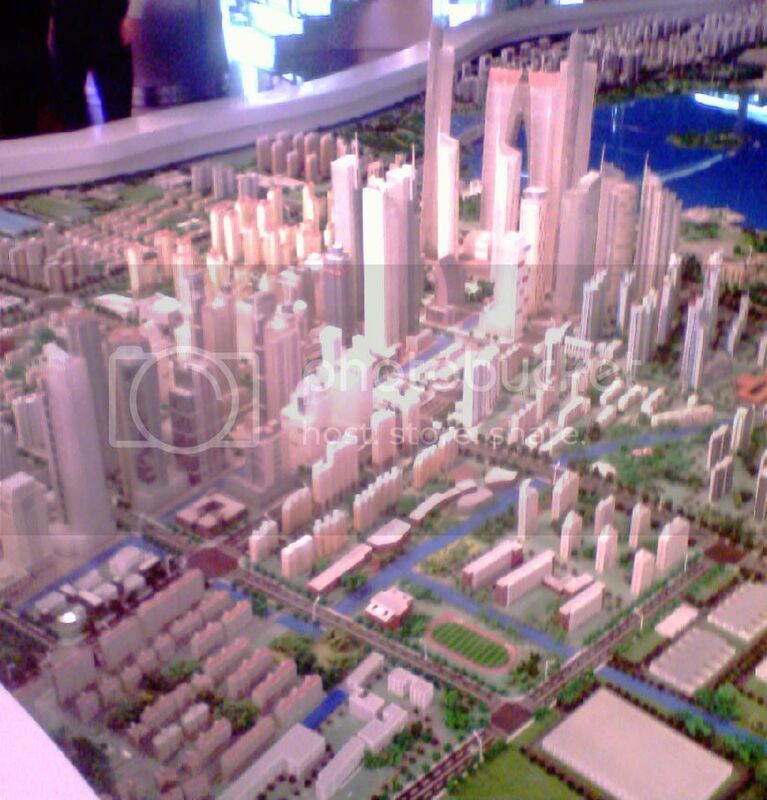 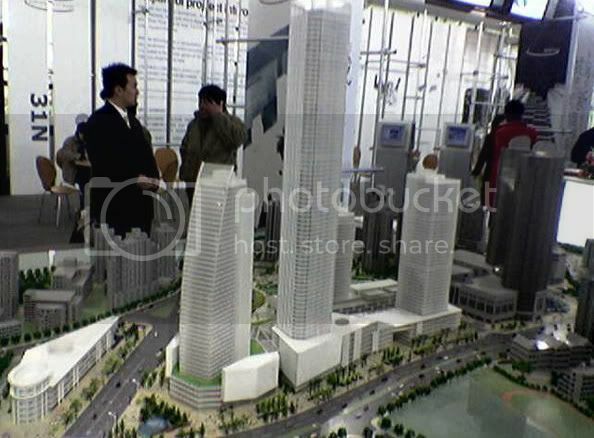 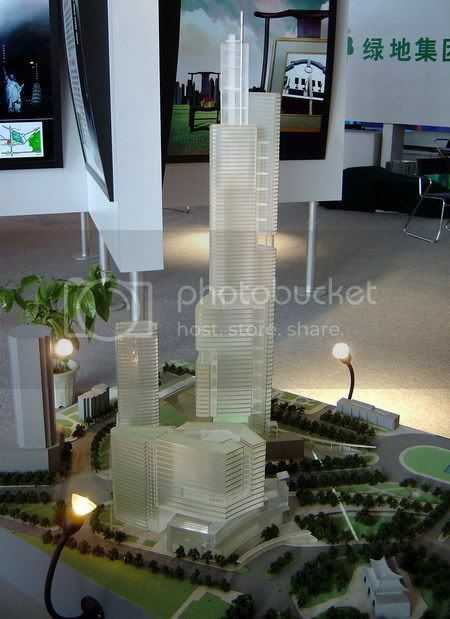 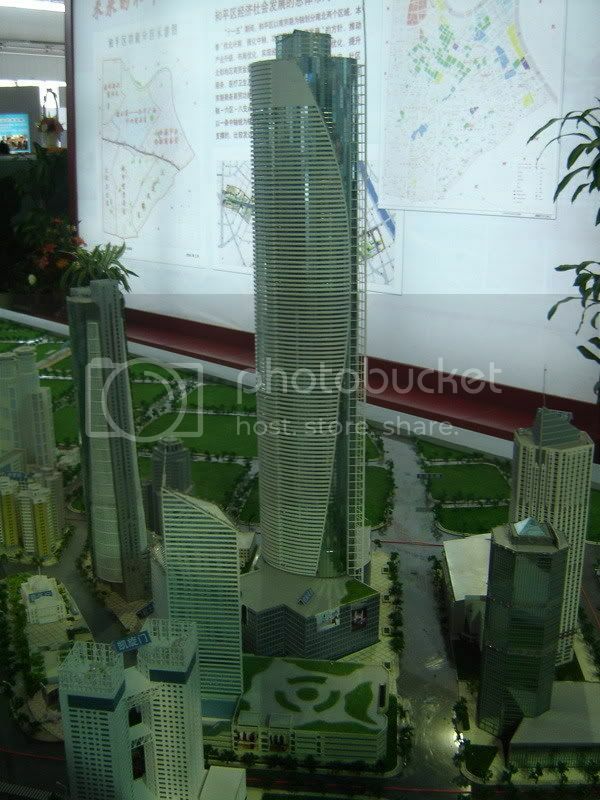 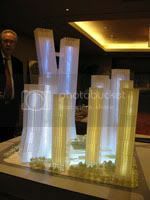 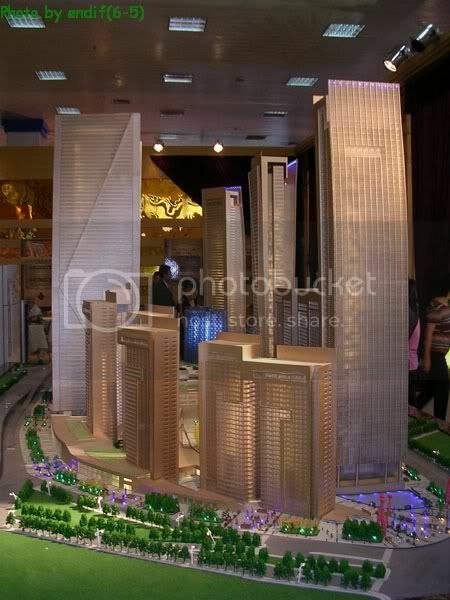 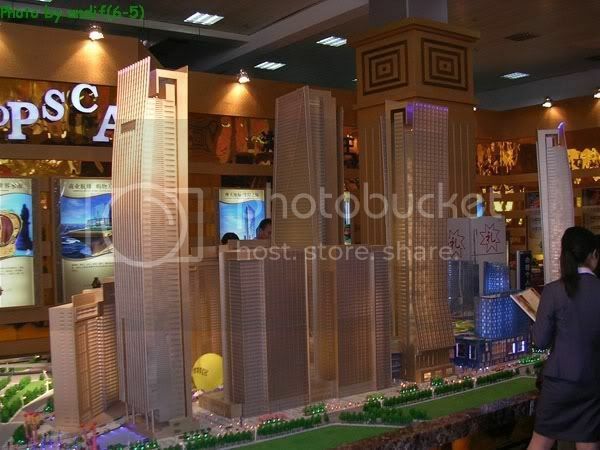 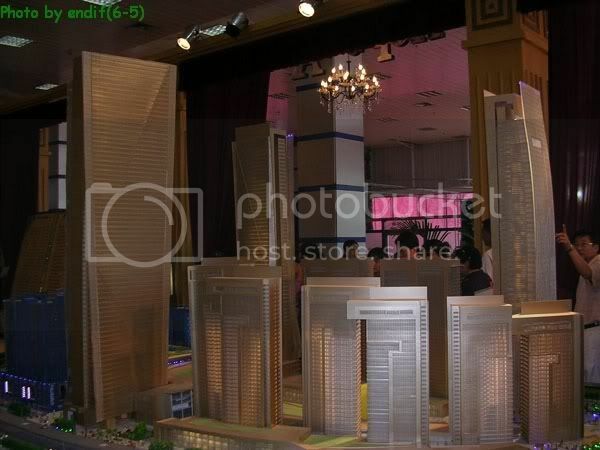 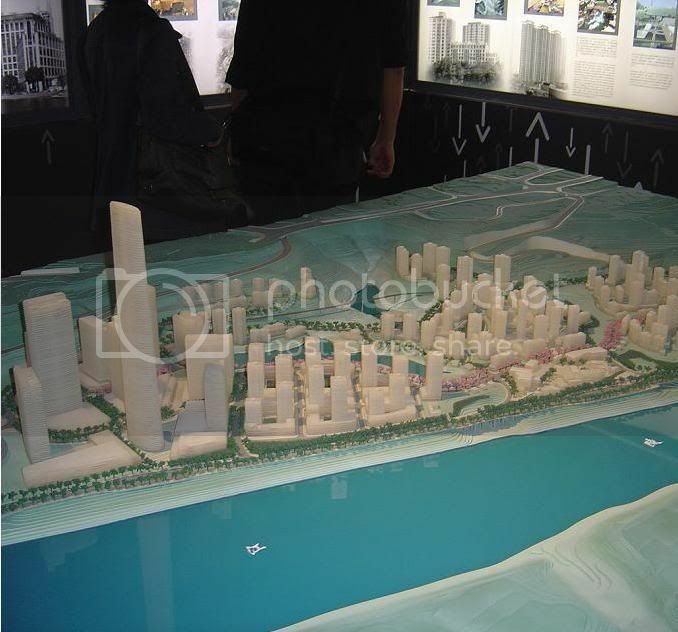 Twin tower project exposed in the concept models of Suzhou new CBD. 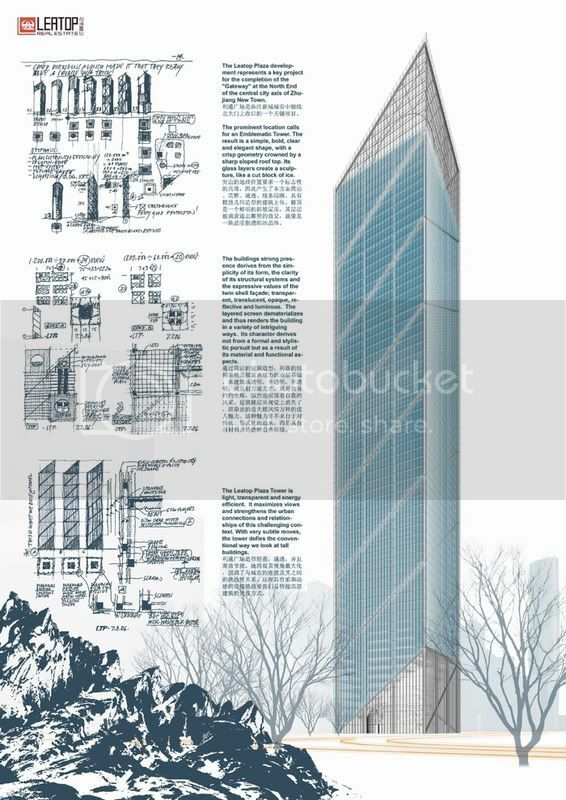 CHONGQING | Nanbin Supertall (Concept proposal): 300m~, 70~ floors. 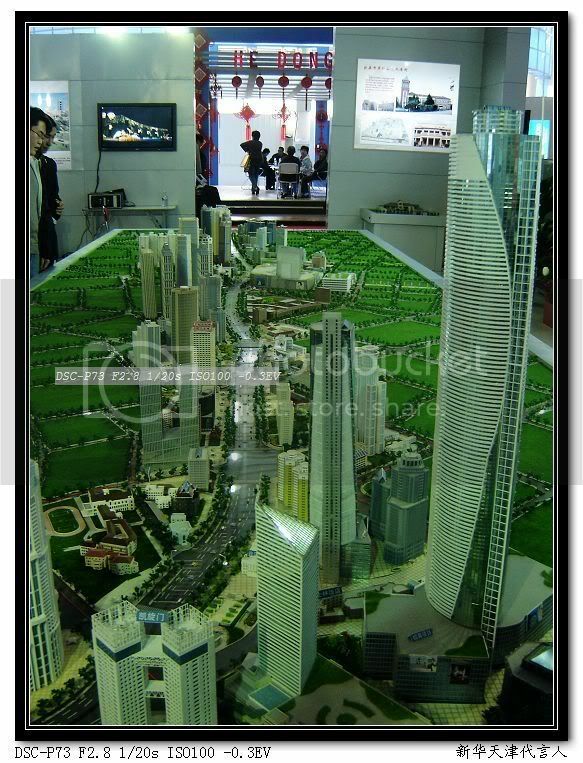 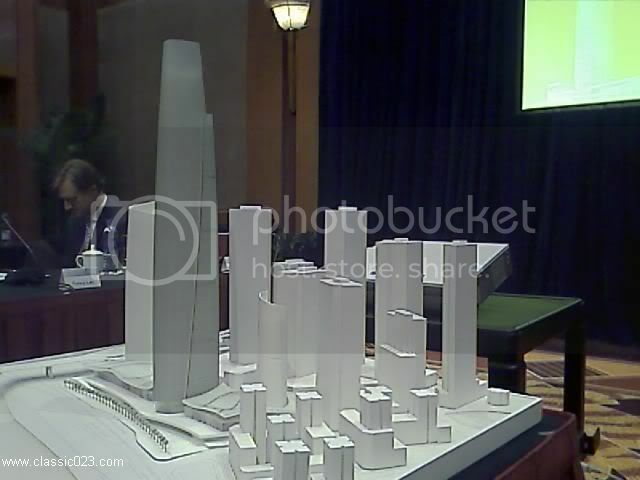 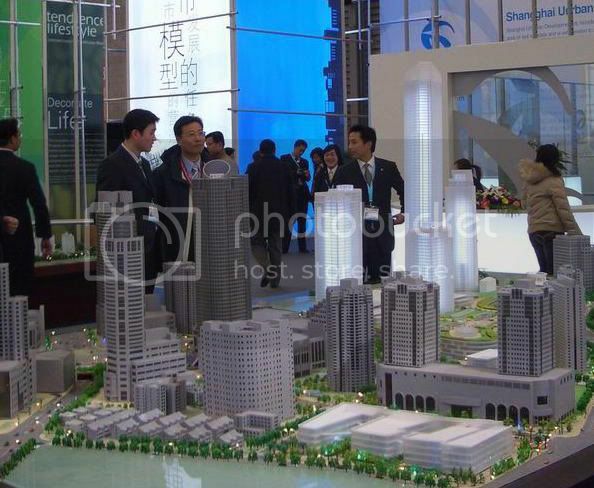 The concept models of the skycraper core at Nanbin area shows they're planning a major project there. 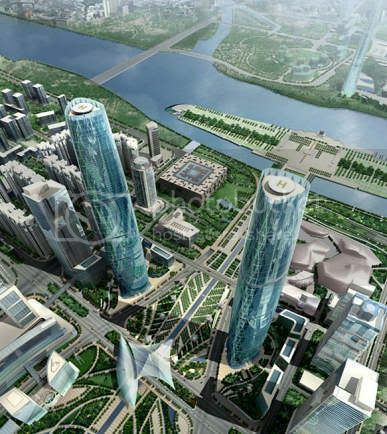 The only two known proposals show a tower around 300m and a twin project around 280m, 67 floors. 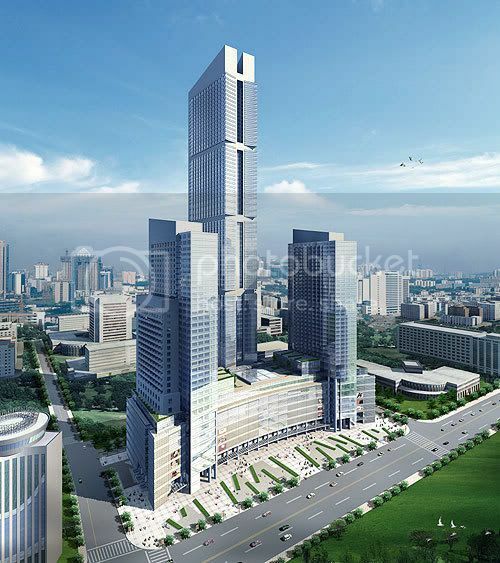 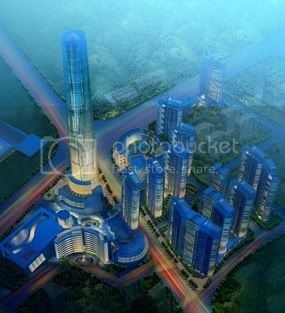 WUHAN | Gezhouba International Plaza (Proposed): 300m~, 69 floors There is very little information out about this project by the moment. 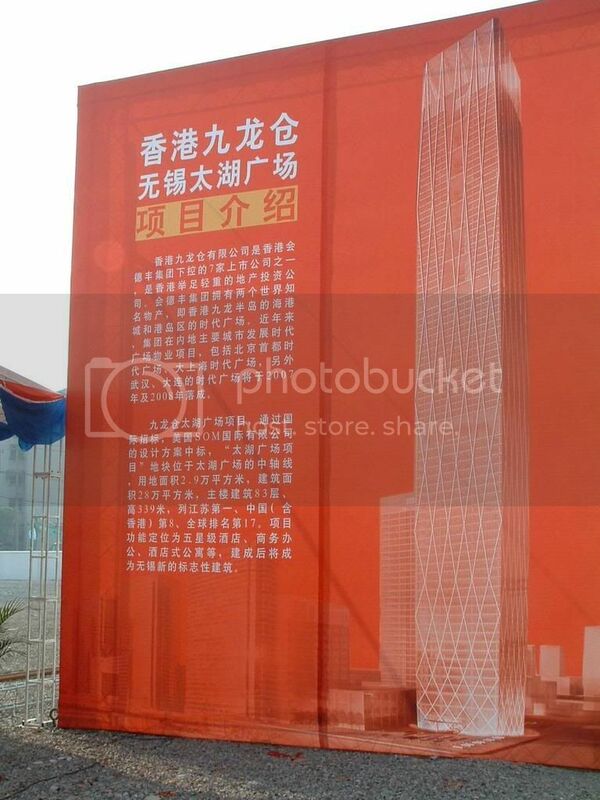 It is being designed by a local firm. 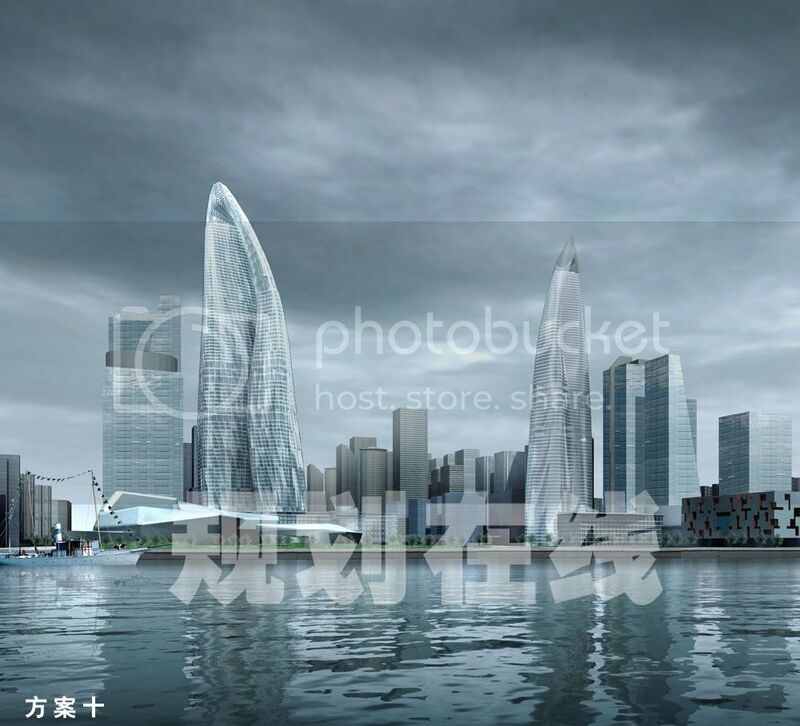 QINHUANGDAO | Qinhuangdao CBD Supertall (Concept proposal): 300m~, 68 floors. 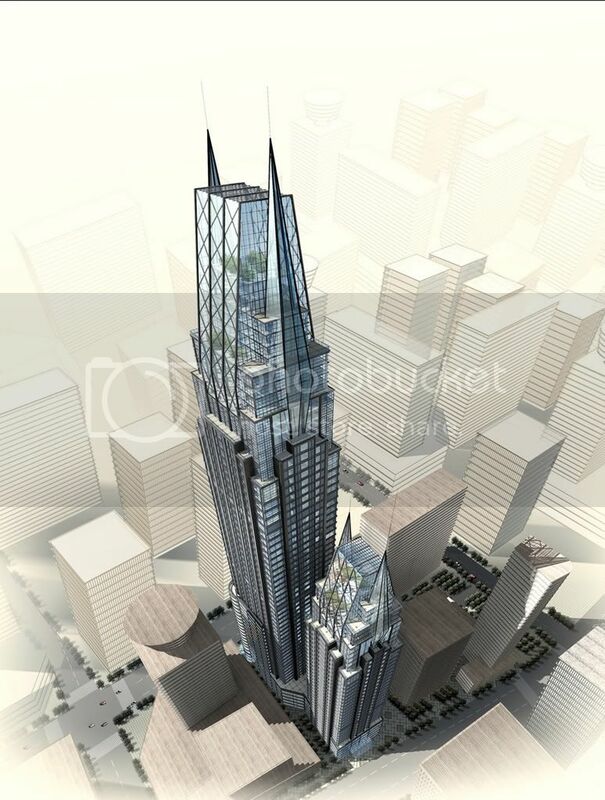 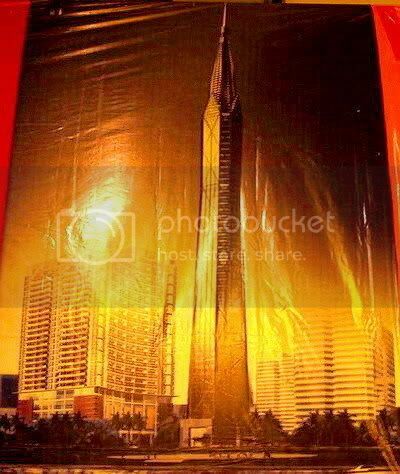 This is the landmark tower of the financial district planned for this city. 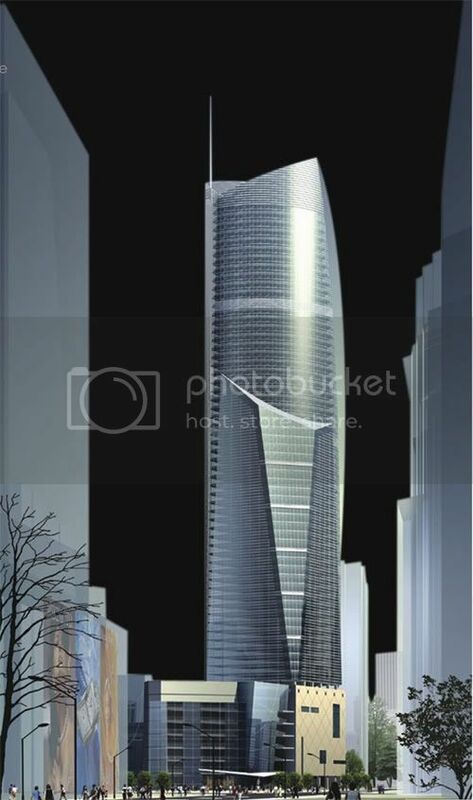 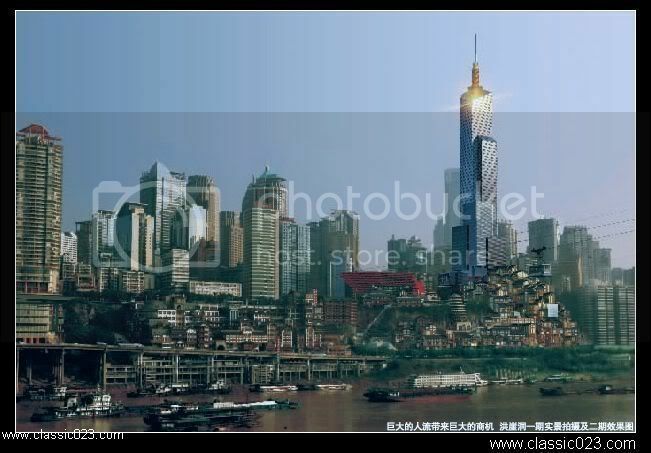 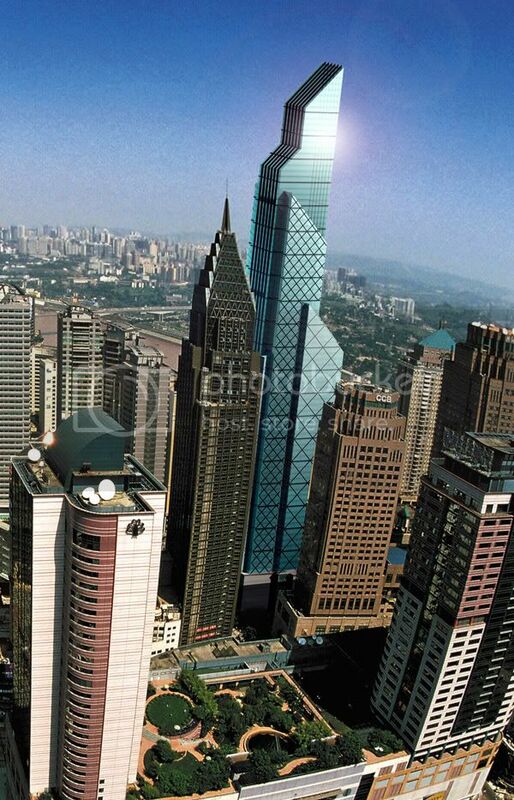 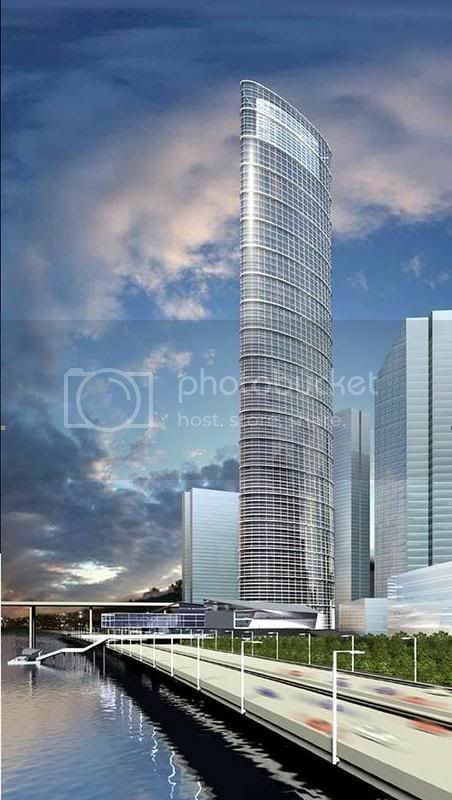 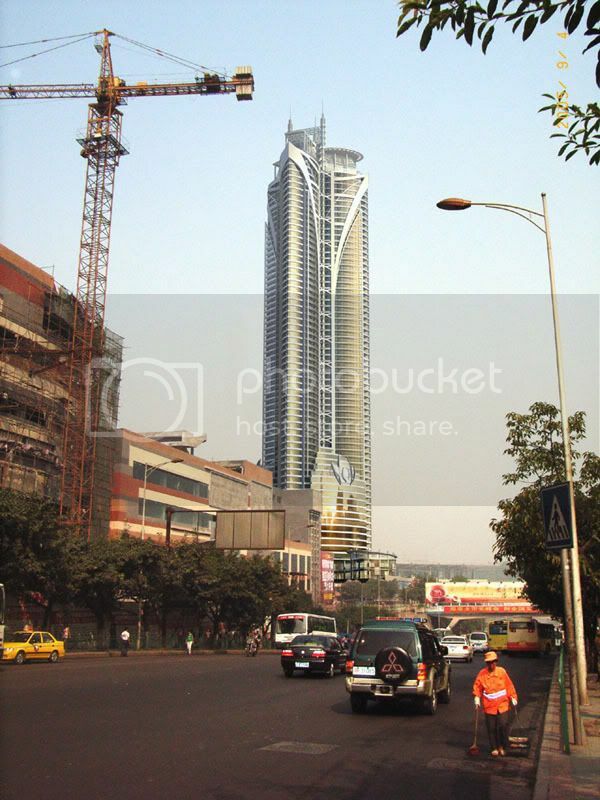 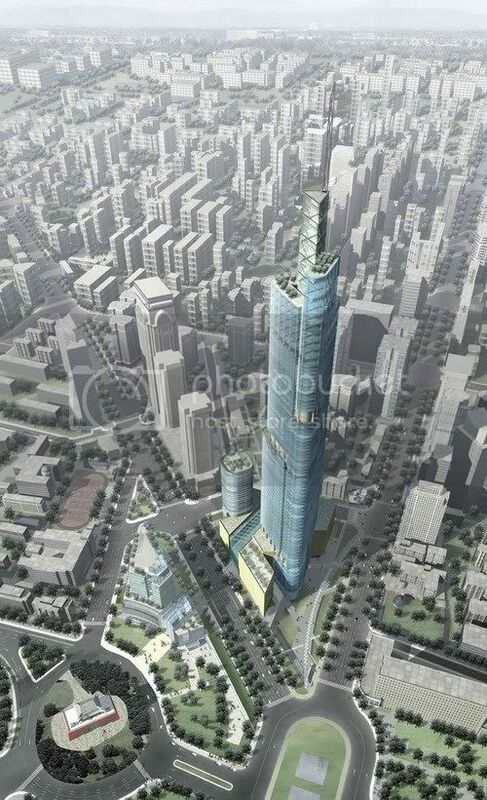 CHONGQING | Huangedu Tower (Proposed): 300m~, 68 floors Huge project proposed for Nanbin area, possible supertall. 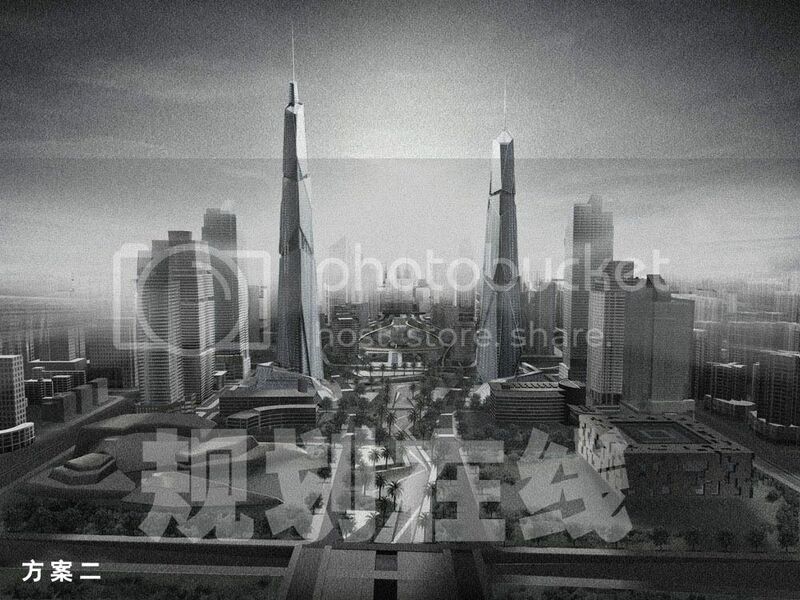 HANGZHOU | Xiaoshan CBD Supertall (Concept proposal): 300m~ . 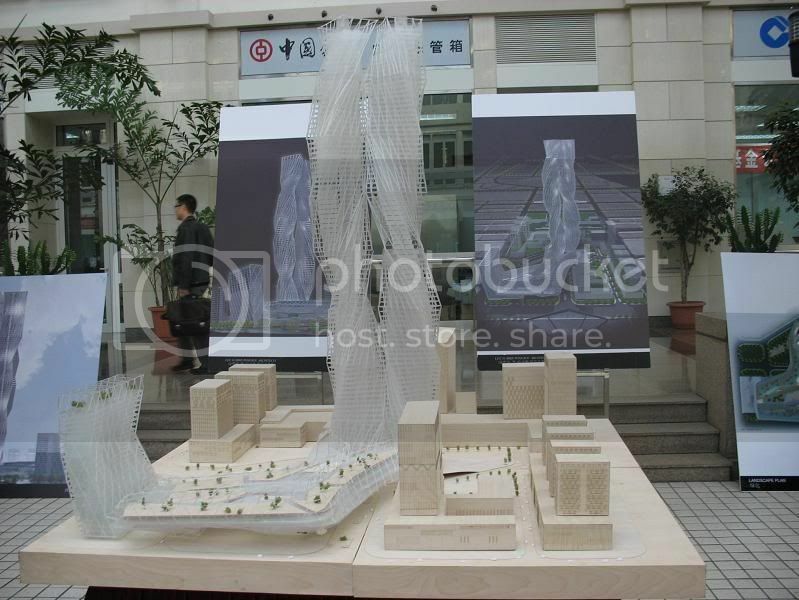 According to the conceptual models of Xiaoshan CBD, there is a supertall planned in this aera. 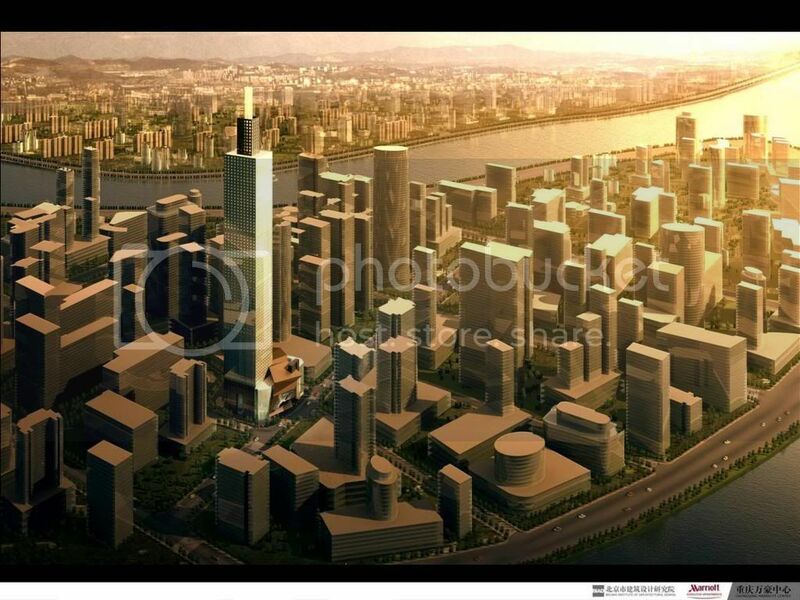 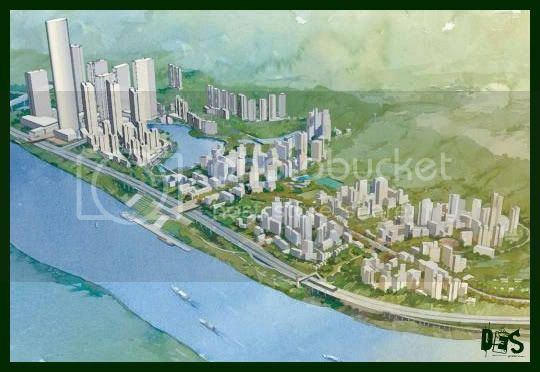 CHONGQING | Jiefangbei Vantone Project (Proposed): 300m~ . 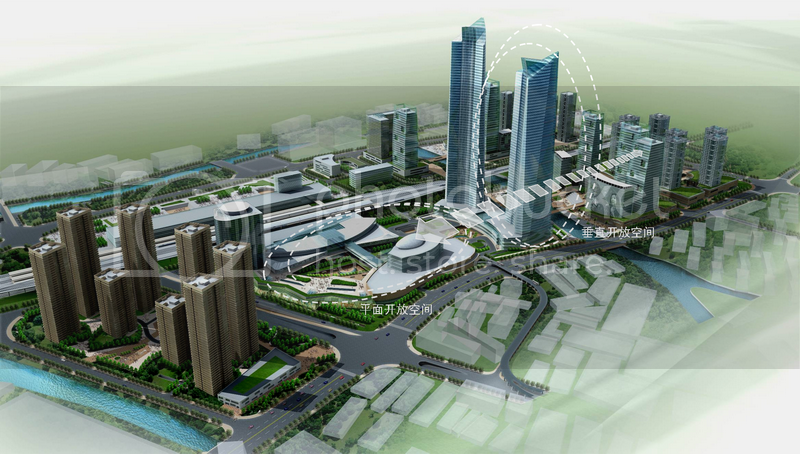 Vantone Group is known to be planning a project around 300m in Jiefangbei district. 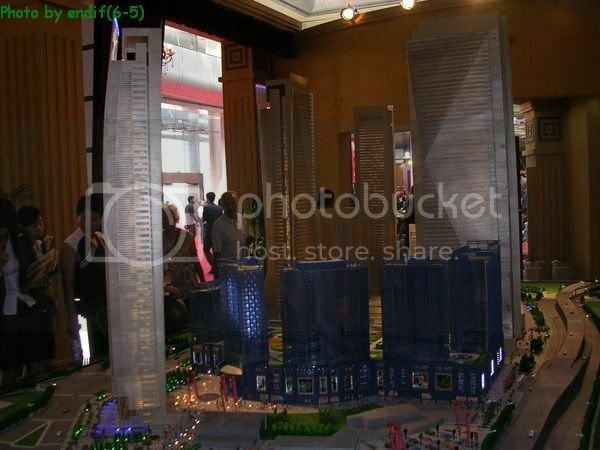 Last edited by z0rg; January 22nd, 2008 at 10:51 PM. 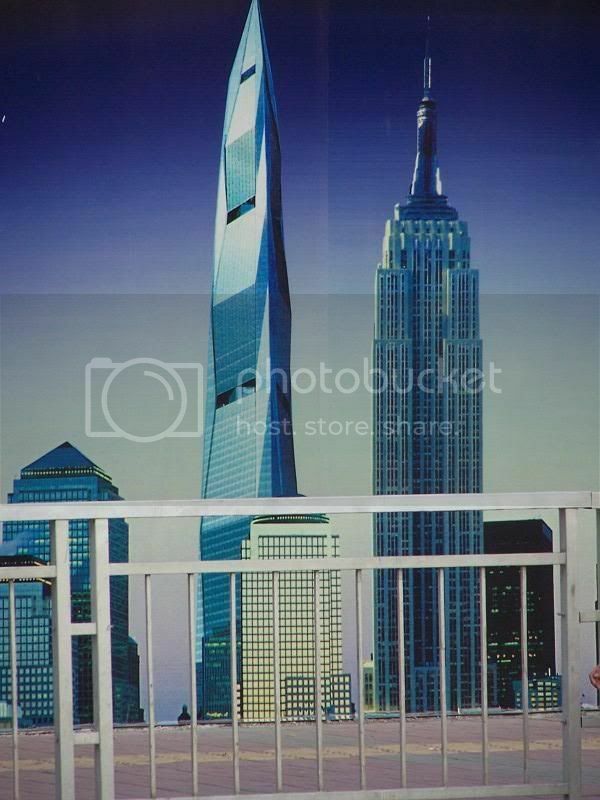 a sus pies, señor moderador. 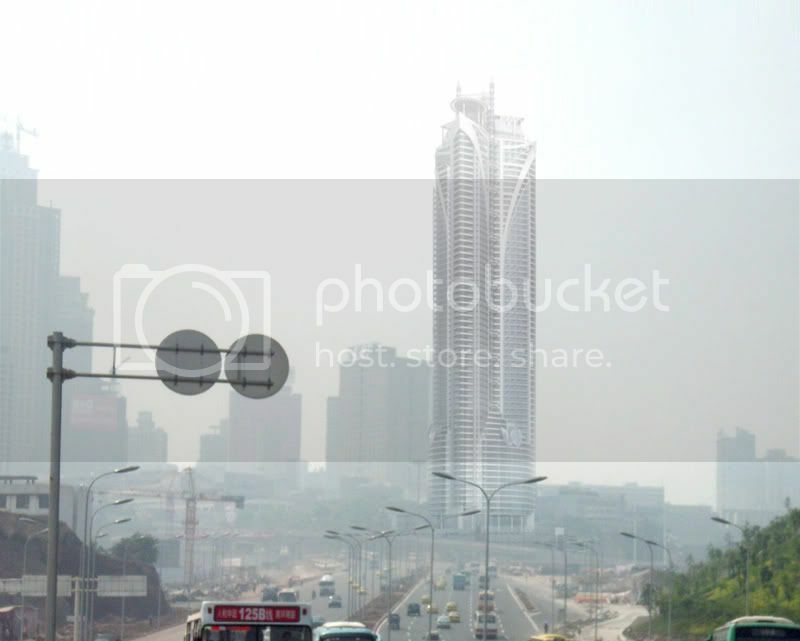 El nuevo Pekín asoma entre las contaminadas brumas del amanecer urbano. 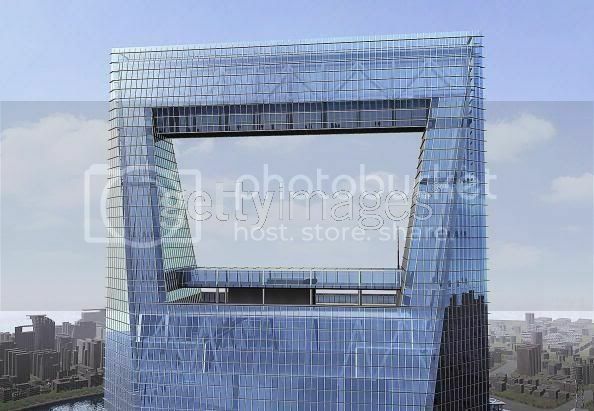 Las dos torres de la sorprendente sede de la Televisión Estatal de China (CCTV) han sido unidas, y avisan de que para el verano, la ciudad de 15,5 millones habrá realizado el proyecto de construcciones más ambicioso desde que China levantó la Gran Muralla. 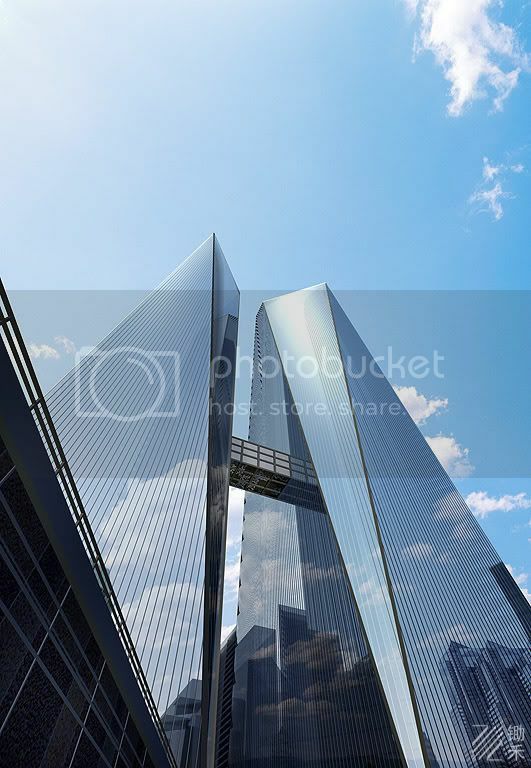 Junto con la ya coronada vecina torre del "World Trade Center", que será el edificio más alto de la ciudad, estas construcciones están cambiando el aspecto del barrio de los negocios de Pekín. 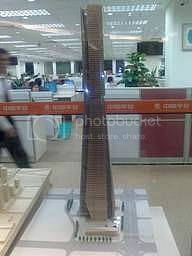 Dentro de muy poco, una docena de edificios singulares, entre ellos cuatro o cinco en la nueva y enorme Zona Olímpica, van a introducir un interés añadido a la visita a la capital china. 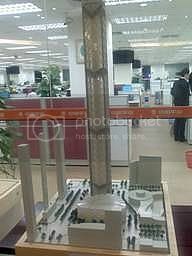 Gracias a ellos, una urbe no particularmente agraciada aunará los mejores monumentos de la antigua china (la Ciudad Prohibida, el Templo del Cielo y la Gran Muralla), con un puesto destacado en la arquitectura contemporánea. 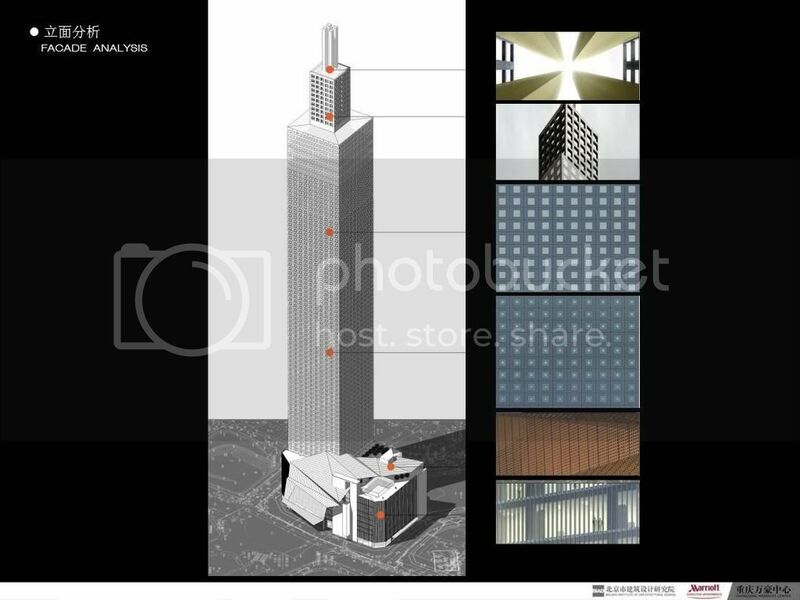 Obra del estudio OMA del holandés Rem Koolhaas y diseñada por el alemán Ole Scheeren, de la sensacional sede de la CCTV ya se ha dicho todo. 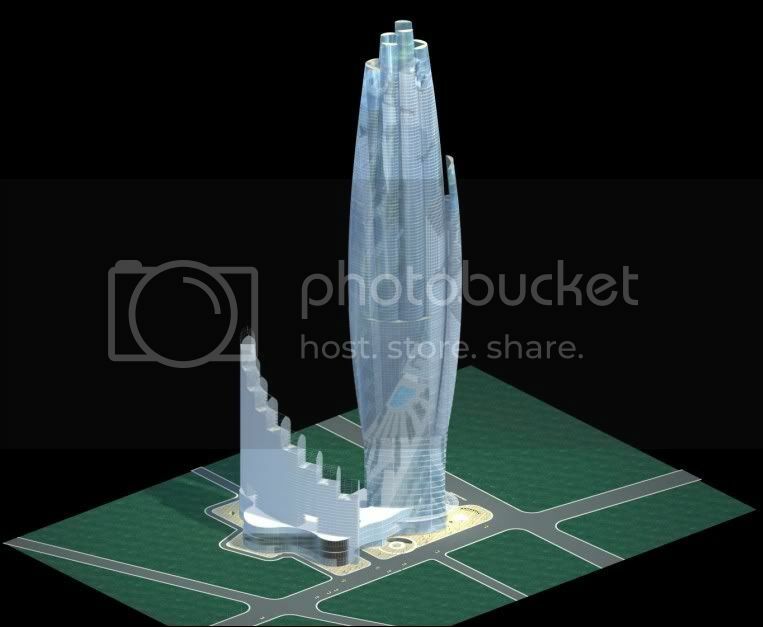 Consta de dos torres de acero y cristal de 230 metros y 40 pisos de alto con una inclinación de 60 grados, unidas por la base y la cima. 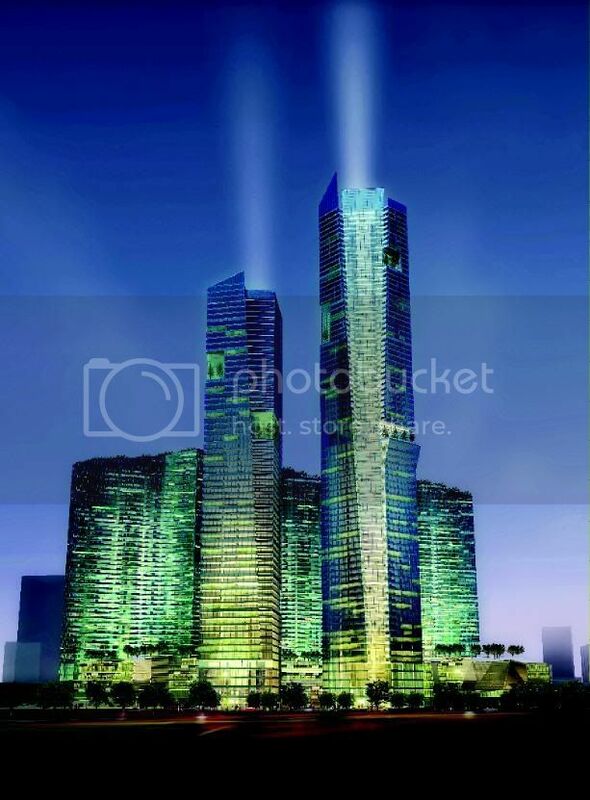 Su área de más de medio millón de metros cuadrados y más de 460 millones de euros de presupuesto, será el mayor espacio de oficinas del mundo después del Pentágono. 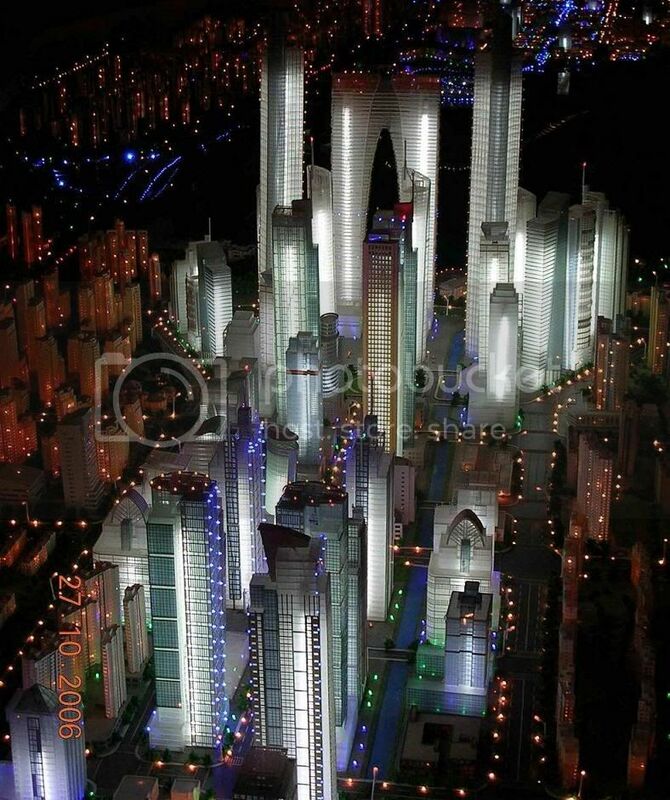 Más allá de estas miserias, el verdadero gran trajín de obras se contempla en la gigantesca Zona Olímpica. 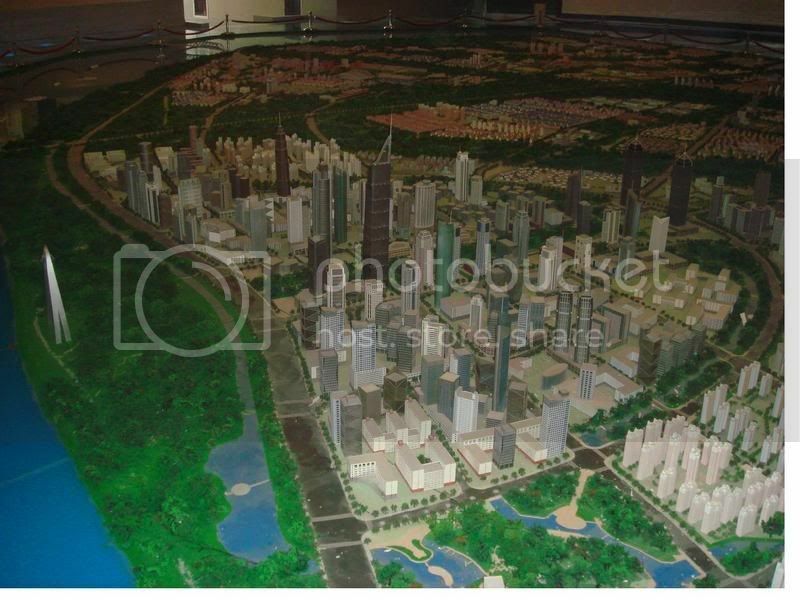 Cualquier olimpiada propicia construcciones en la ciudad sede, pero en Pekín, capital de una nación hasta hace poco muy pobre en la que el deporte era lujo excéntrico, casi todo se ha construido de la nada. 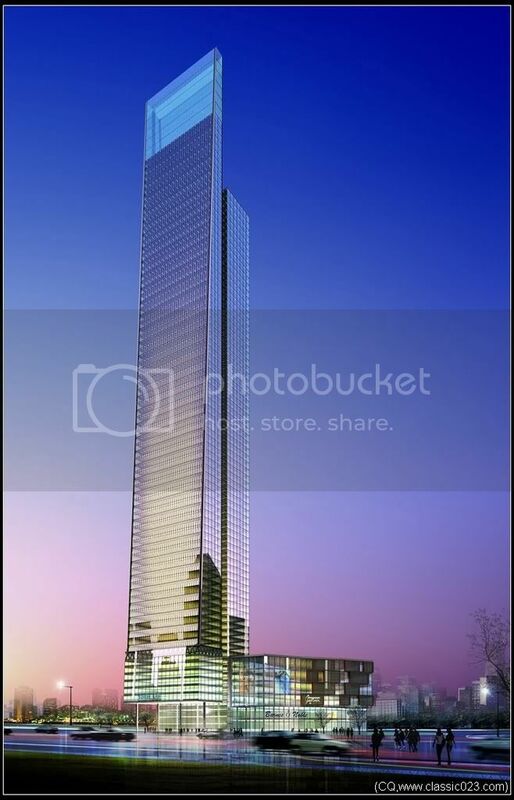 Y con ánimo de celebrar la nueva prosperidad, lo que introduce claros elementos de ostentación. 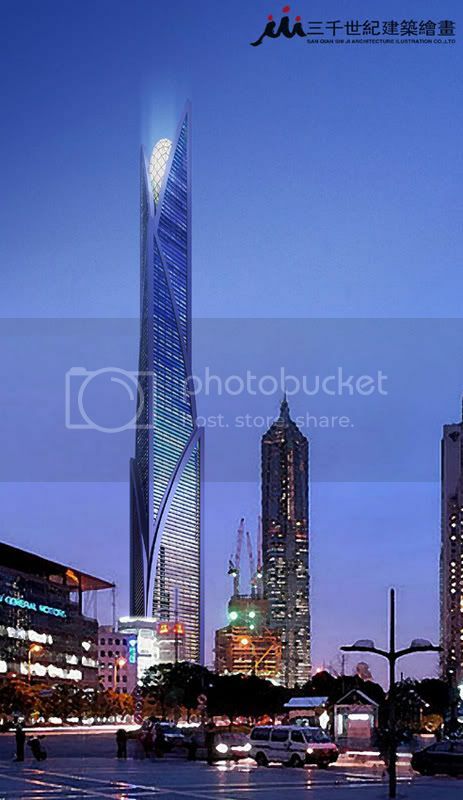 De las 31 instalaciones olímpicas que Pekín esta levantando, diez, entre ellas las más espectaculares, están en la Zona Olímpica. 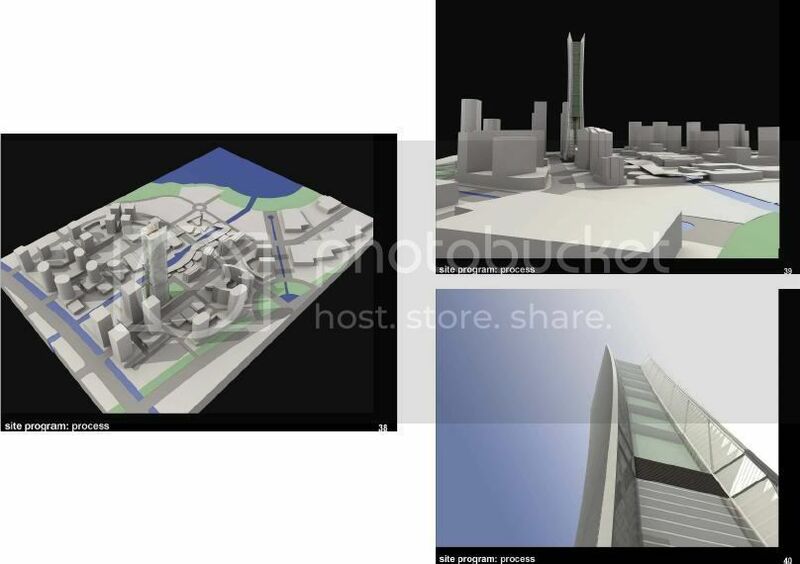 Inauguración y clausura, en "El Nido"
Tres de ellas destacan visualmente y van a dar mucho que hablar. 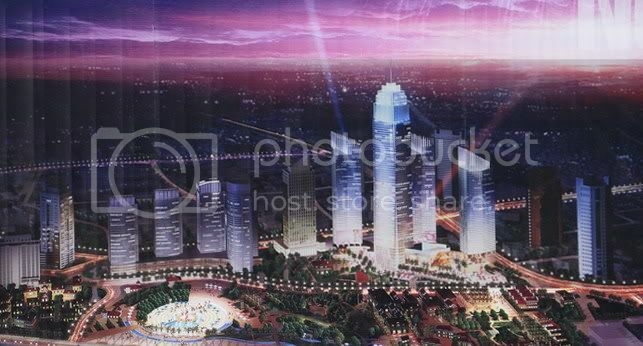 En primer lugar, el Estadio Nacional, conocido como "El Nido", que será la instalación olímpica más emblemática, escenario de las ceremonias de inauguración y clausura. 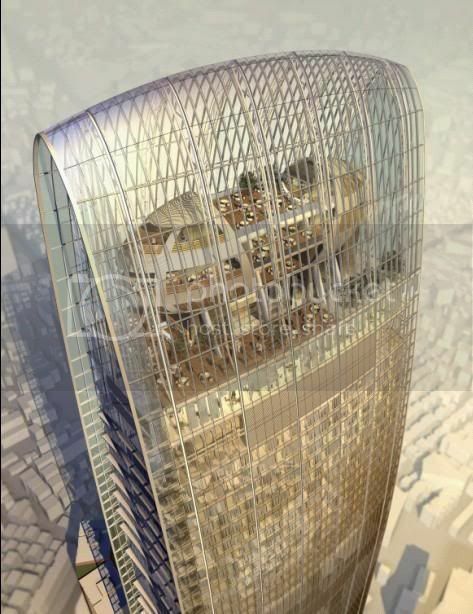 Tiene 258.000 metros cuadrados, capacidad para 91.000 espectadores y ha costado 3800 millones de euros. 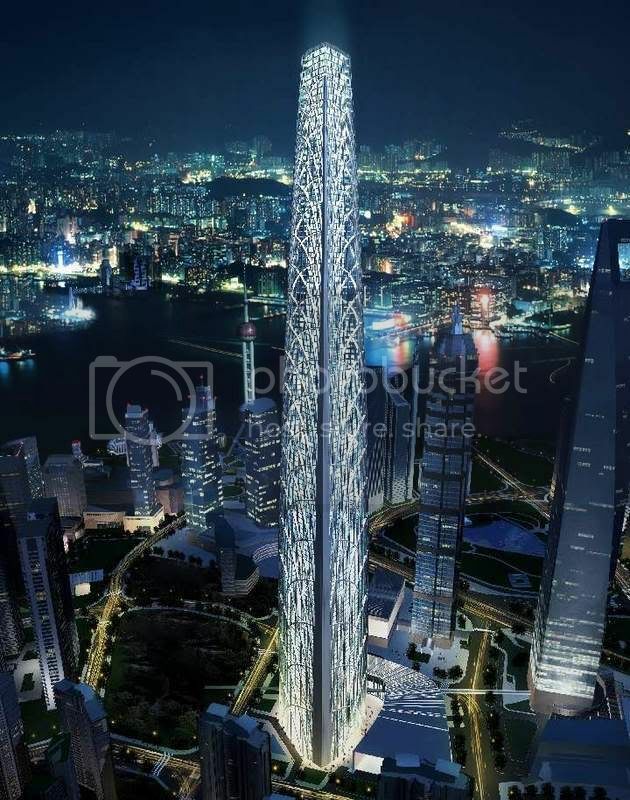 Su estructura de acero entrelazada de 42.000 toneladas crea una impresión de ligereza, a la vez tradicional y vanguardista. 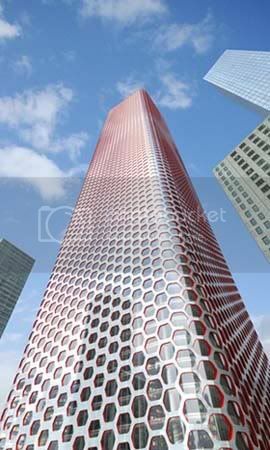 Sus autores son los arquitectos suizos Jacques Herzog y Pierre de Meuron. 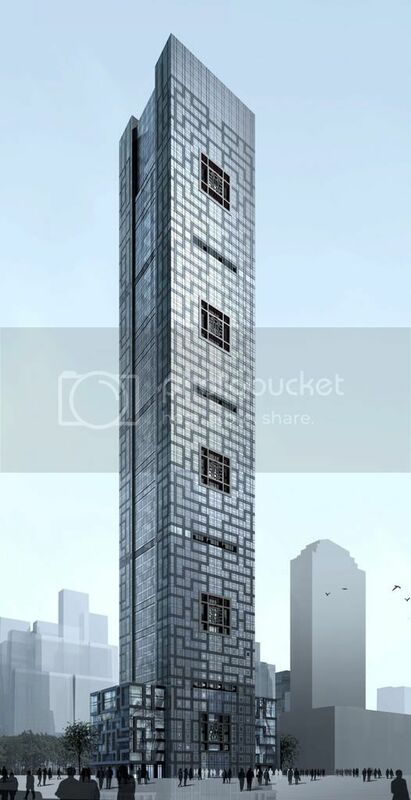 La segunda es el llamado "Cubo de Agua", el Centro Acuático Nacional, situado frente al "Nido", en perfecto contraste de formas. 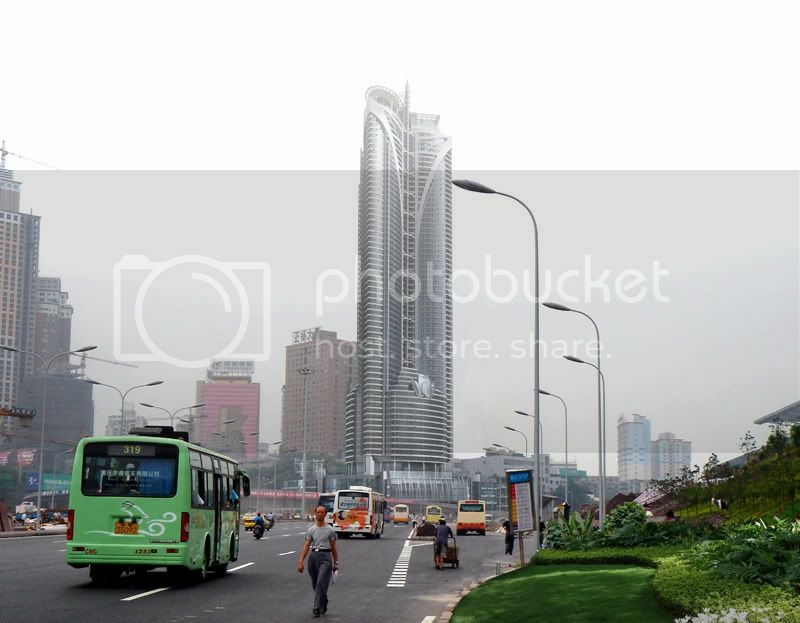 Su estructura de 79.500 metros cuadrados y 17.000 plazas de capacidad, está recubierta por un envoltorio de 3000 cojines blandos de plástico reciclable, que produce un efecto visual líquido. 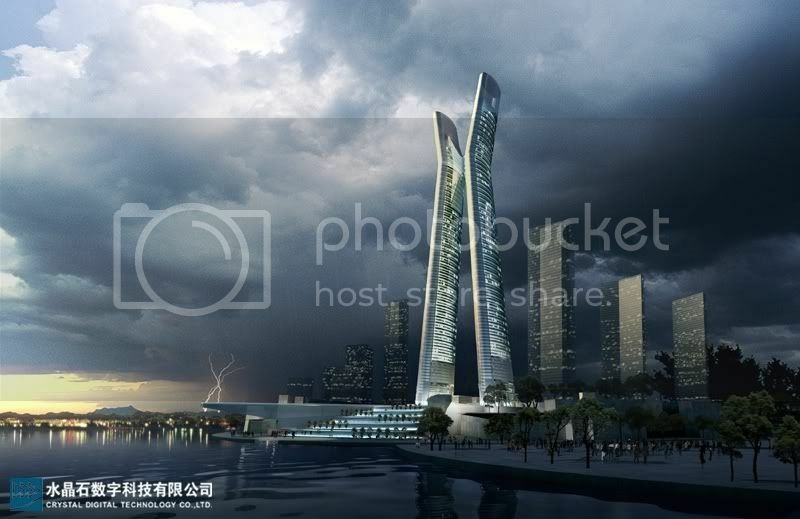 Obra del estudio australiano PTW y del chino CSCEC, el "Cubo"es un edificio de gran eficiencia energética, en el que la estructura ayuda a calentar las cinco piscinas que contiene. 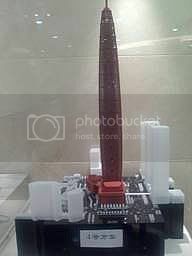 Mención especial merece también el centro de comunicaciones de los juegos, llamado "Pekín Digital". 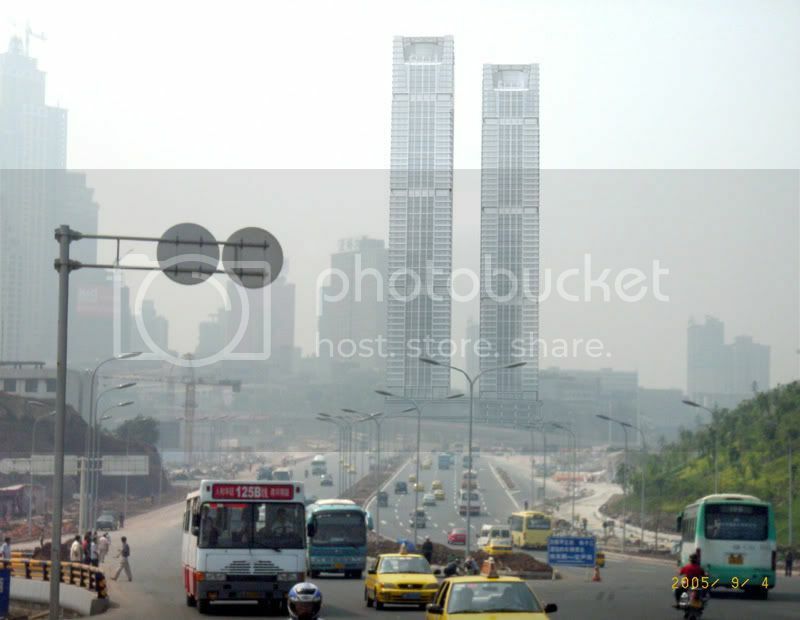 Es un edificio rectangular de cuatro bloques, obra del arquitecto Zhu Pei y del estudio "Urbanus" de Shenzhen, la ciudad más moderna de China. 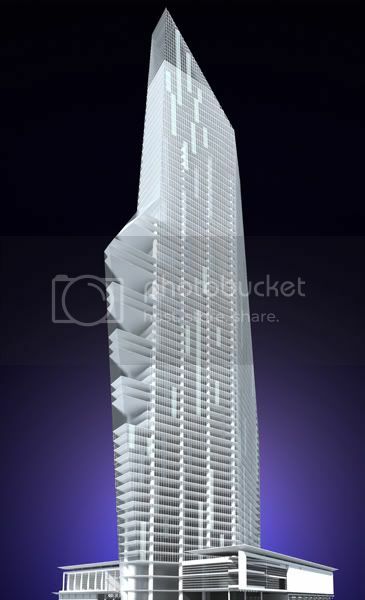 Sus materiales, cemento, cristal y aluminio, y sus líneas exteriores de luz, crean un efecto extraño y atractivo de gran modernidad, que ya cautiva a los paletas que echan sus horas en los edificios de los alrededores. 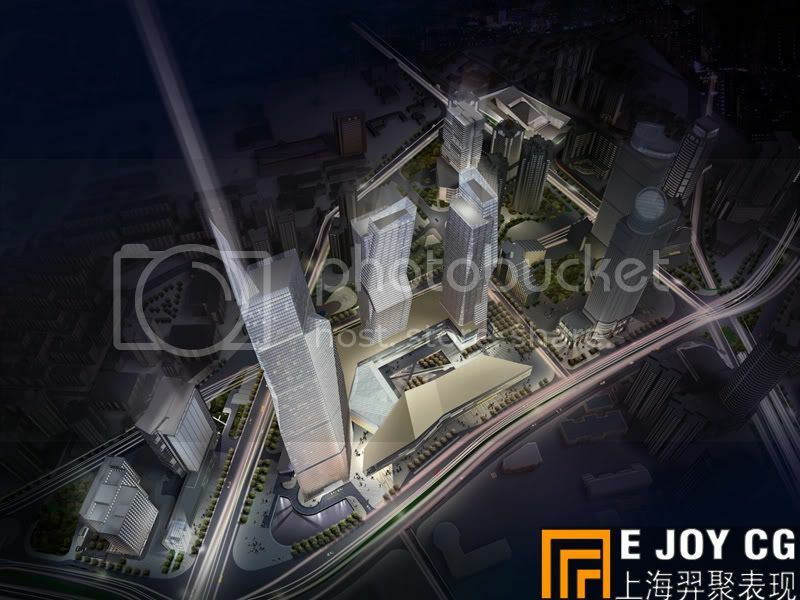 Fuera de la Zona Olímpica, el moderno aeropuerto de la ciudad, que funciona mucho mejor (en atención, celeridad y eficacia) que cualquiera de sus homólogos europeos, está concluyendo una nueva terminal de 2500 millones de euros a cargo del británico Norman Foster. 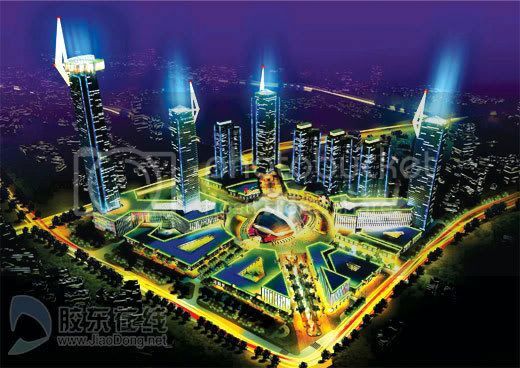 En ambición y calidad estas grandes obras pekinesas, "superan todo lo que se ha hecho hasta ahora, no sólo en China sino seguramente en cualquier otra ciudad en un mismo momento de su historia", dice Scheeren, el diseñador de la sede de CCTV. 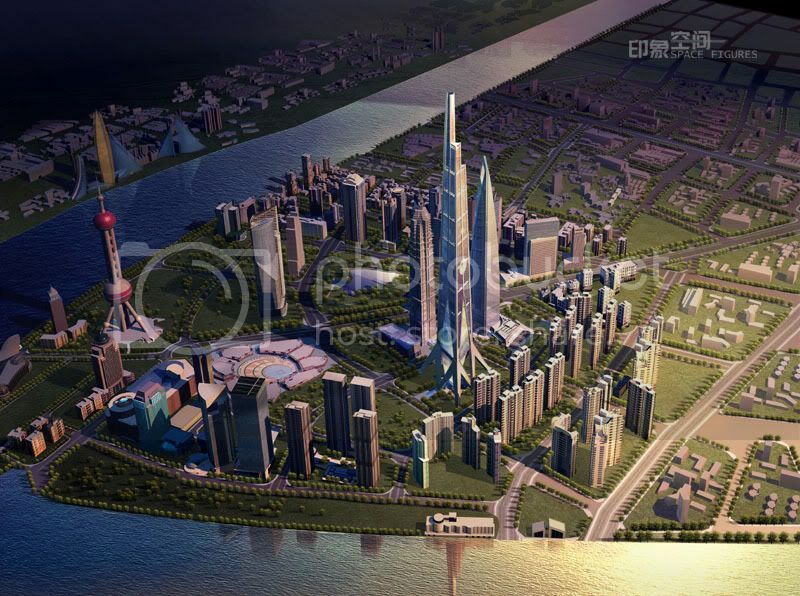 Su colega Mario Bellini apunta otro aspecto de la oportunidad que China brinda a los arquitectos: la abundancia de obras y su rapidez. 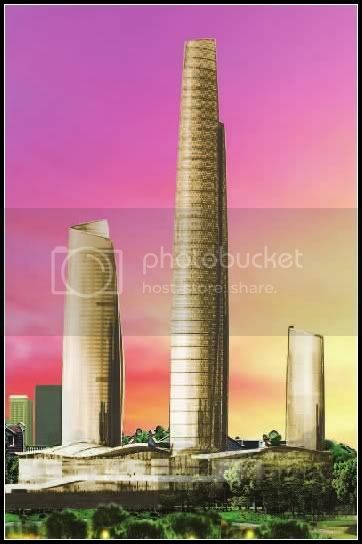 "En lo que aquí se tarda en levantar un rascacielos, en Europa construimos una casa pequeña". 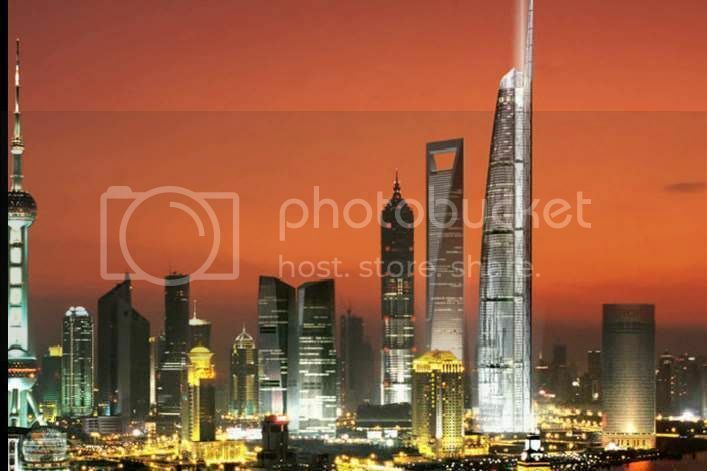 "En Italia entre que te pones a ello y concluyes, tardas diez años, hagas lo que hagas", dice. 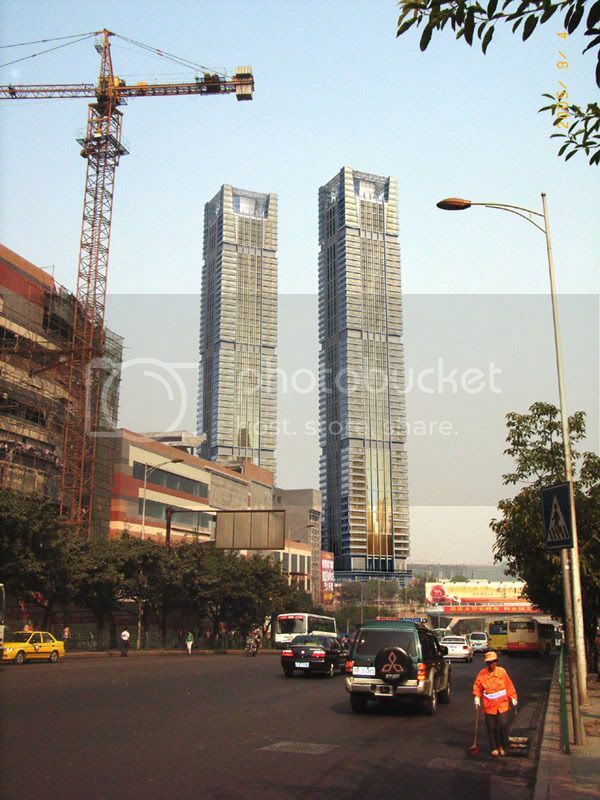 Pero ¿Cuál será el resultado final de toda esta fiebre?. 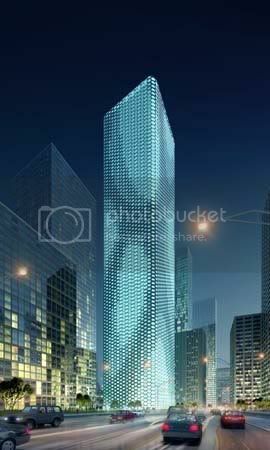 Las ciudades son mucho más que el dinero y la voluntad política de embellecerlas de sus dirigentes. 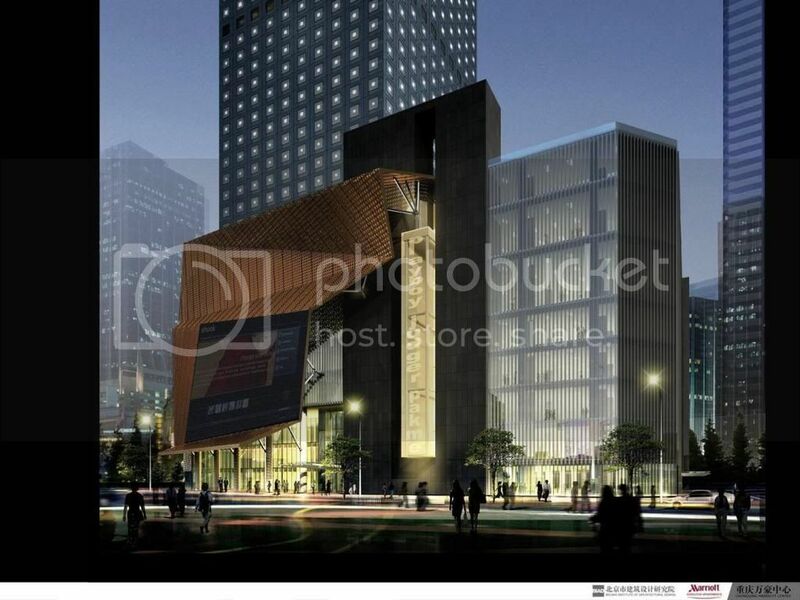 Según el arquitecto japonés Keichiro Sako, uno de los autores de la remodelación del barrio diplomático de SanLiTun, en Pekín hay grandes estructuras, como los enormes y suntuosos edificios del Pekín olímpico, y pequeñas estructuras, como las cada vez más contadas humildes zonas de casas residenciales de una sola planta de los barrios tradicionales (hutong), pero, "no hay nada entre unas y otras". 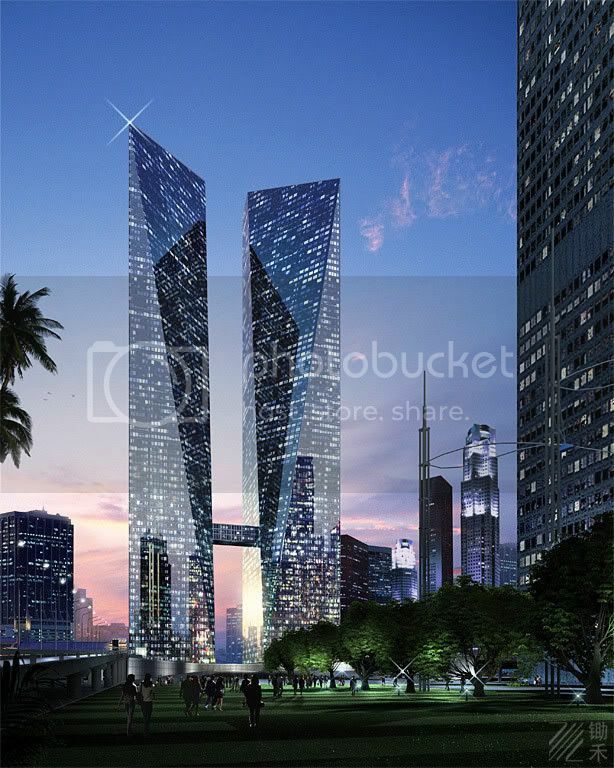 Otro gran inconveniente del urbanismo de Pekín, apuntado por Sako y otros arquitectos, como el venezolano Antonio Ochoa, es la manía de rodear de muros y vallas las nuevas comunidades residenciales. 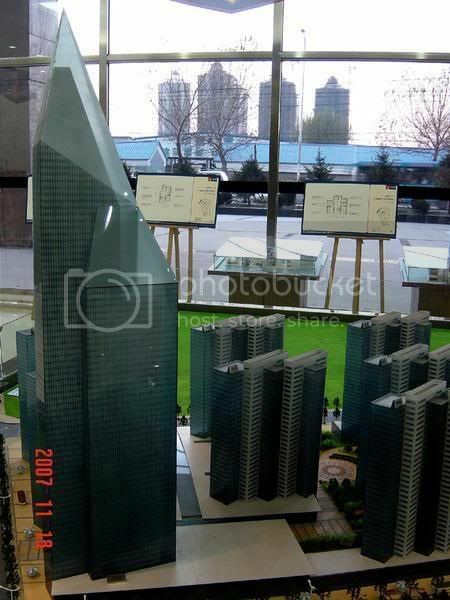 Por doquier, uno se encuentra nuevos y altos edificios de viviendas rodeados de vallas. 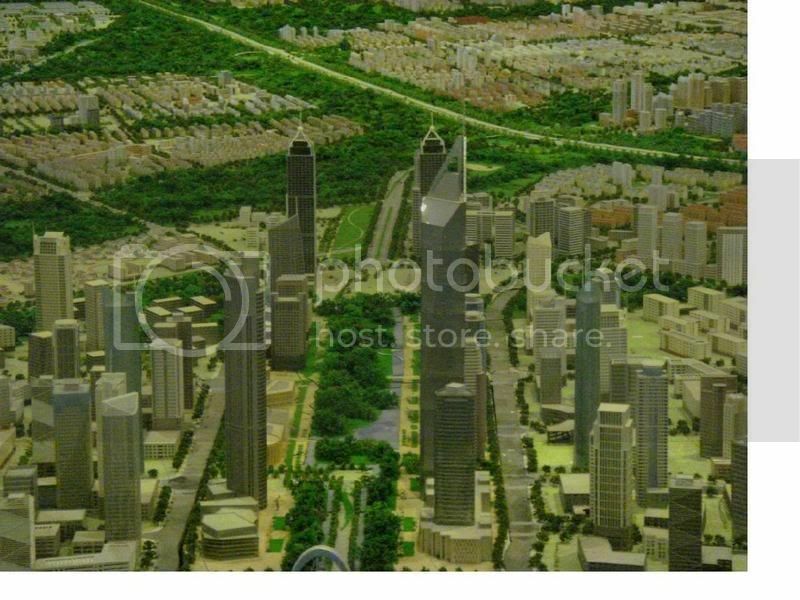 Ochoa llama la atención sobre los grandes parques amurallados de la ciudad, a los que solo se puede acceder por exiguas entradas (y pagando). 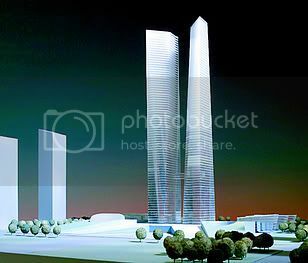 "Si se continua con esa filosofía, Pekín será pronto un lugar en el que la gente no podrá moverse libremente", dice Sako. 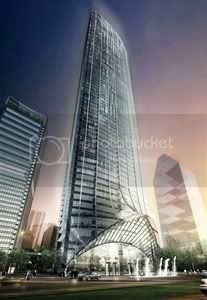 "Quienes trabajan en la arquitectura deben tener en cuenta la continuidad de los edificios con el entorno que los rodea", considera. 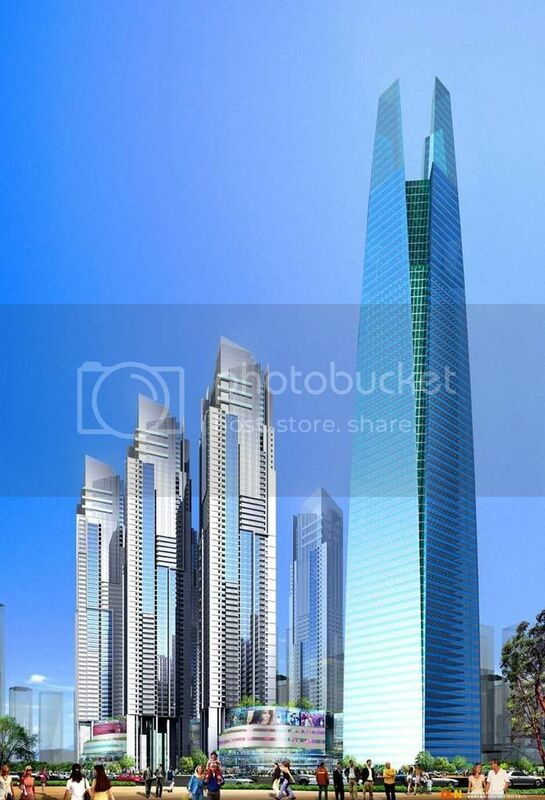 Ochoa afirma que todo urbanismo refleja la sociedad que lo creó. 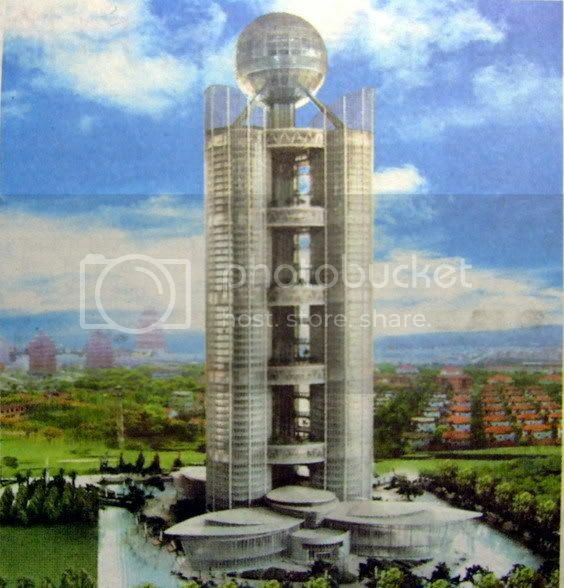 El de Pekín, sin duda, transmite muchas veces el capricho y dictado de la planificación. 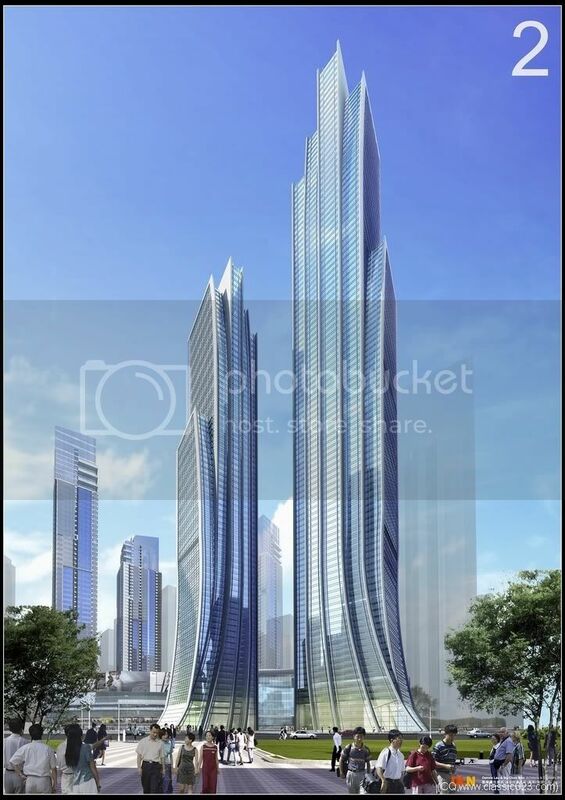 Los burócratas plantan edificios aquí y allá, sin ton ni son. 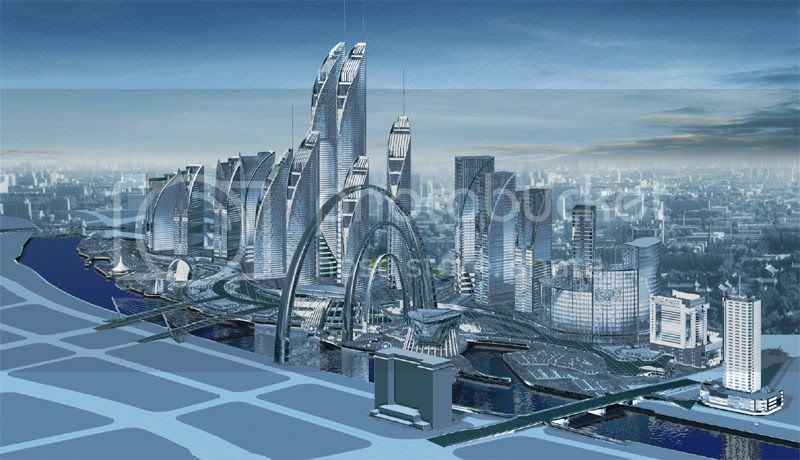 Se nota que los ciudadanos aun pintan muy poco en el paisaje del que son usuarios principales. 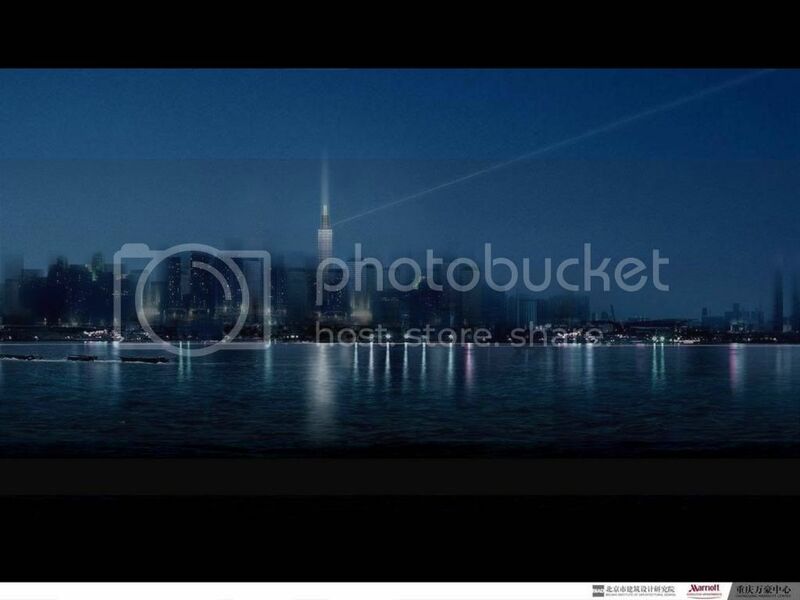 El resultado es cierta artificialidad. 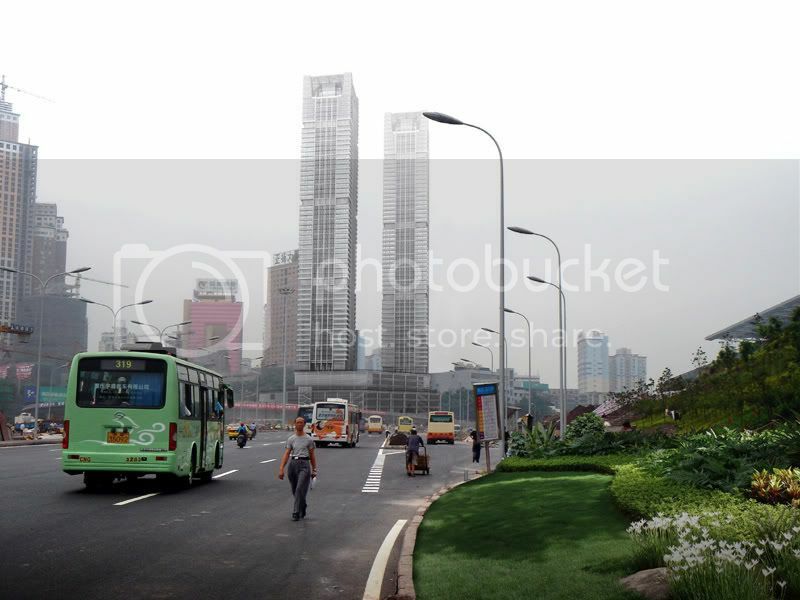 Paisajes urbanos sin alma que tienen que ver con la manifiesta minoría de edad cívica del hombre chino. 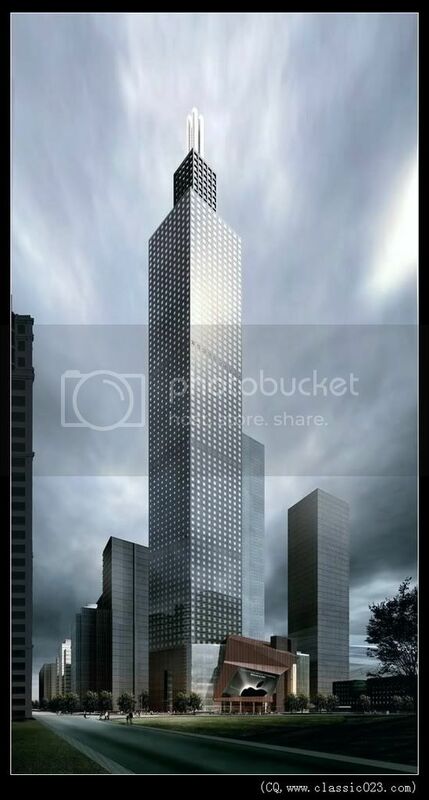 Al mismo tiempo, cuando se recuerdan los terribles sufrimientos y carencias del pasado más inmediato, cuando se recuerda que hace solo treinta años aquí se adoraba a un líder dios, y que la alimentación de todos era objetivo nacional, resulta difícil no quitarse el sombrero. 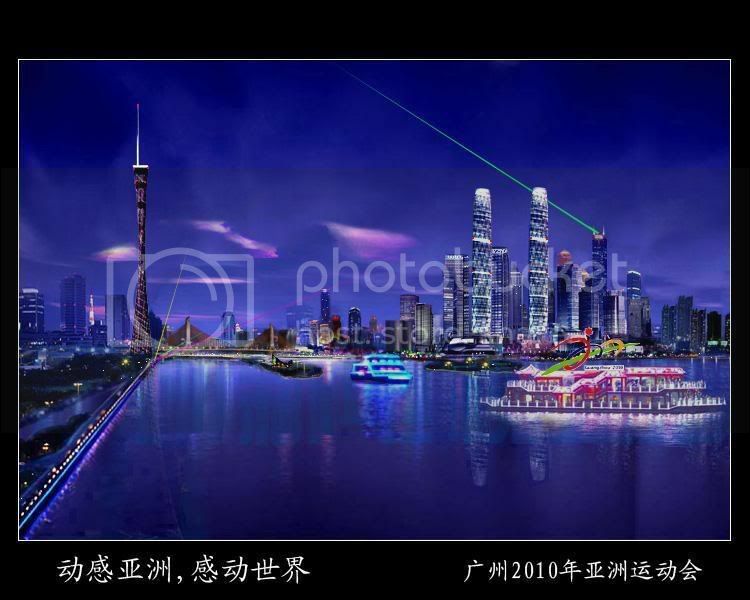 Así mismo, entrando a éste hilo me he dado cuenta que ZOrg es moderador- aunque tendría que serlo del foro chino XD-. 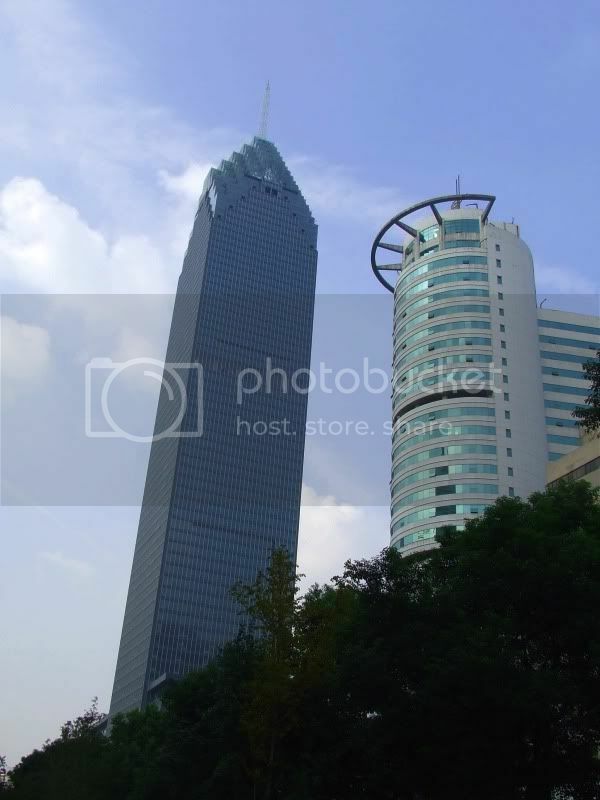 Bueno, vaya mis felicitaciones a ZOrg por éste bien merecido ascenso. 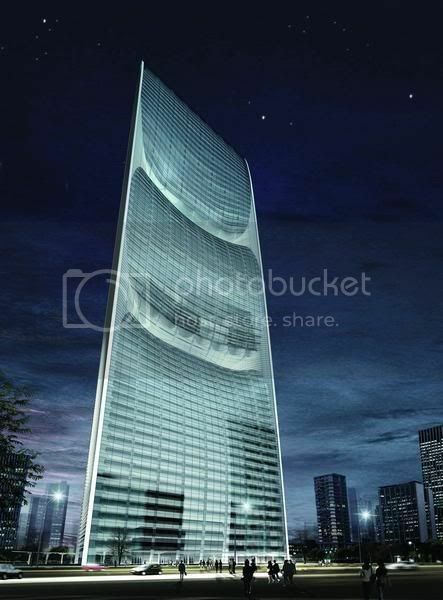 Ojala que te sea comoda y placentera ésta nueva tarea, y que así mísmo no te quite tiempo para participar como "forero comun" informandonos todo cuanto acontesca en el sudeste asiatico. 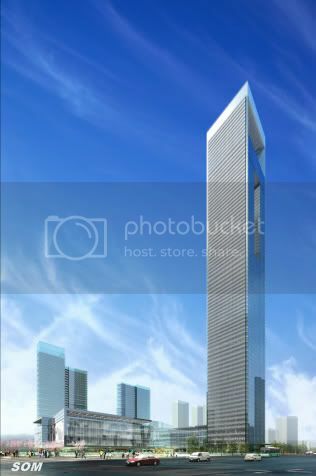 Espero que no abuses de tu podes de moderador para sancionar a los foreros antichinos. 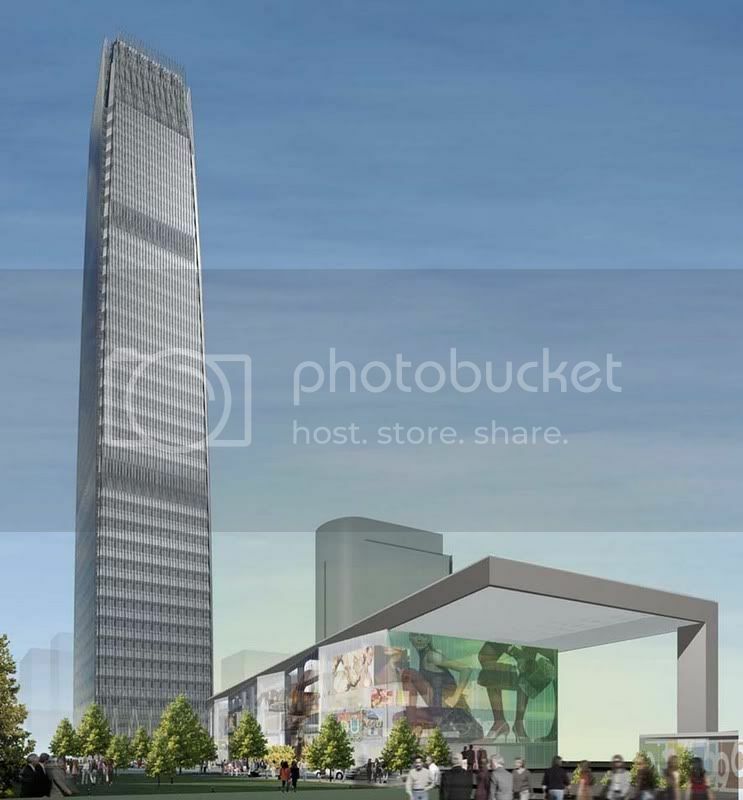 PD: Hacía tres días que no entraba a éste subforo. 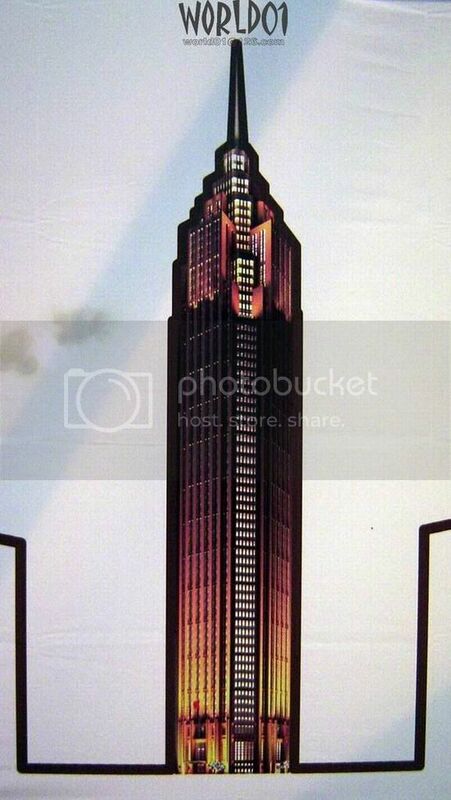 Lo veo muy cambiado, lo has hecho tú? 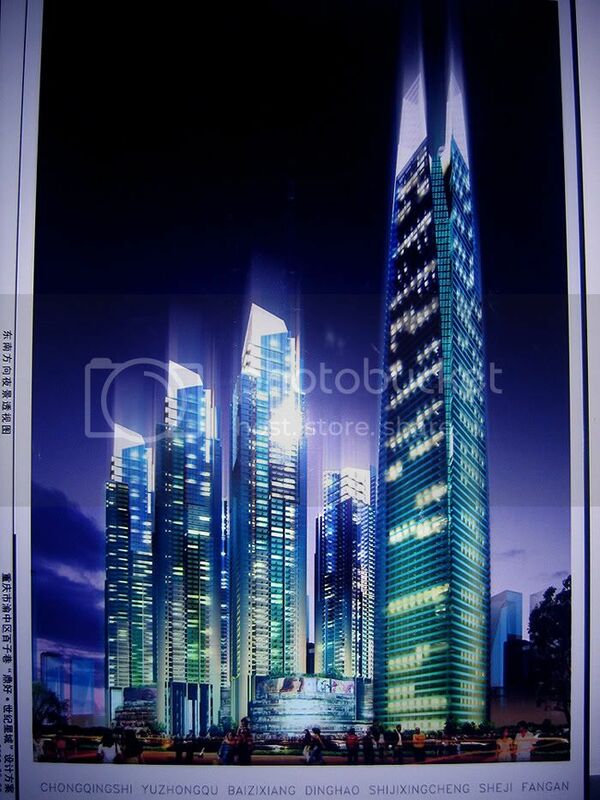 Imágenes de la nueva versión, 70 pisos. 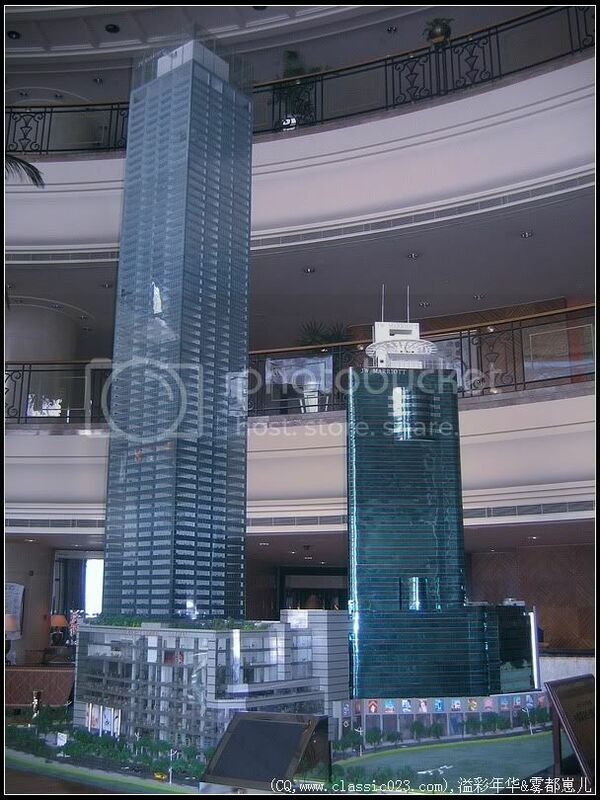 Alguien me hace un resumen? 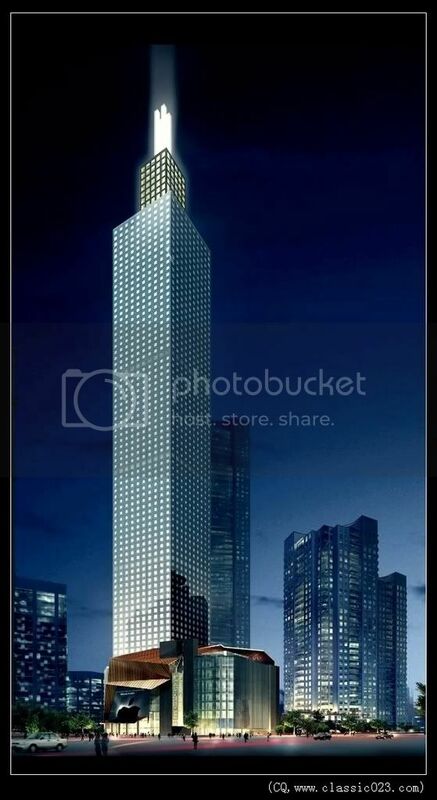 xd Qué brutalidad! 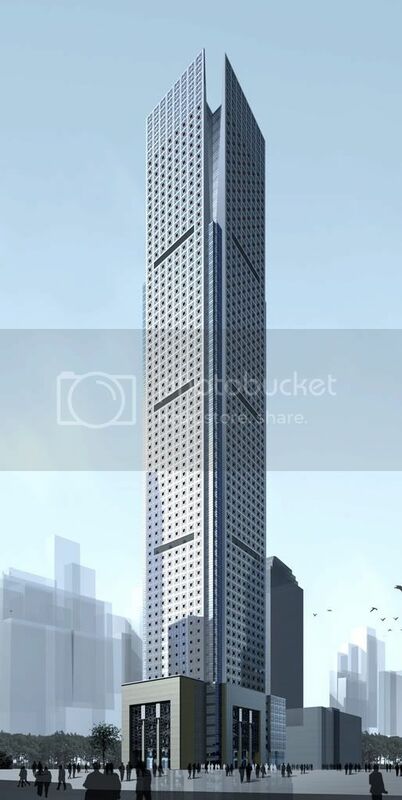 Parece que tiene 36 secciones de 3 pisos, con lo que finalmente serían 108 pisos, bastante plausible teniendo en cuenta la obsesión de los chinos con que los rascacielos intenten terminar en 8 tanto en pisos como en altura. 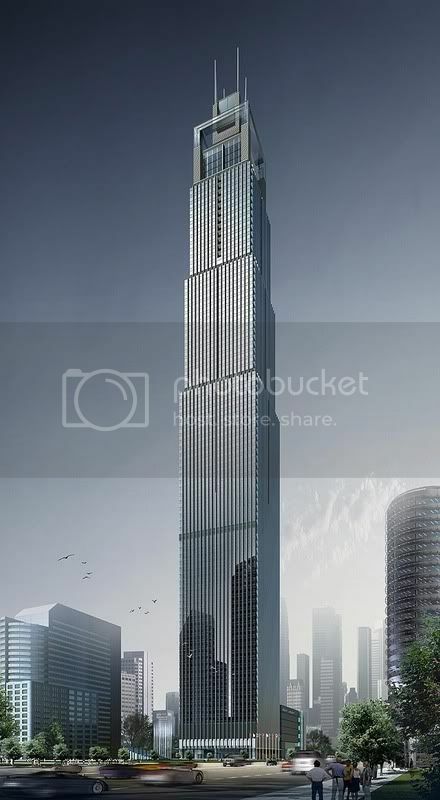 Imagino que la altura final quedará en los 450-500m. 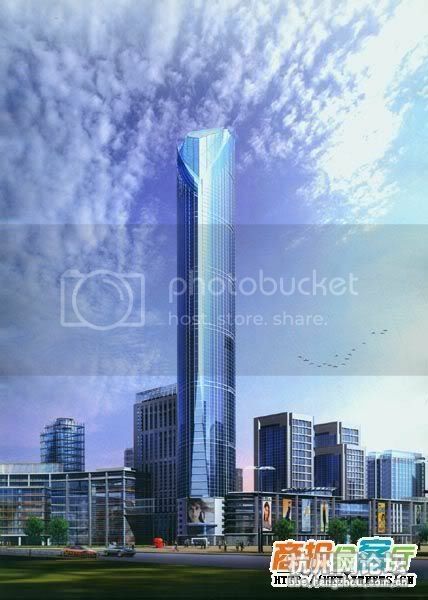 Last edited by z0rg; January 12th, 2008 at 07:27 PM. 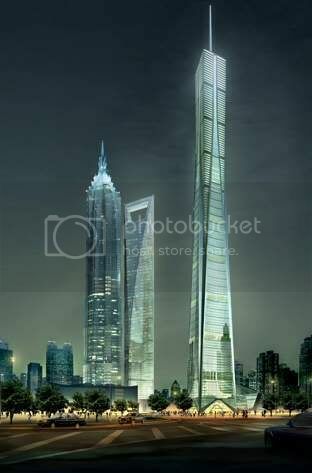 Y lo de China ya empieza a agotar cualquier adjetivo superlativo existente. 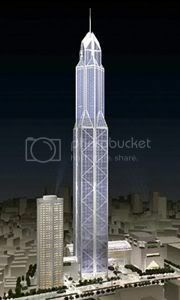 Megalomaníaco. 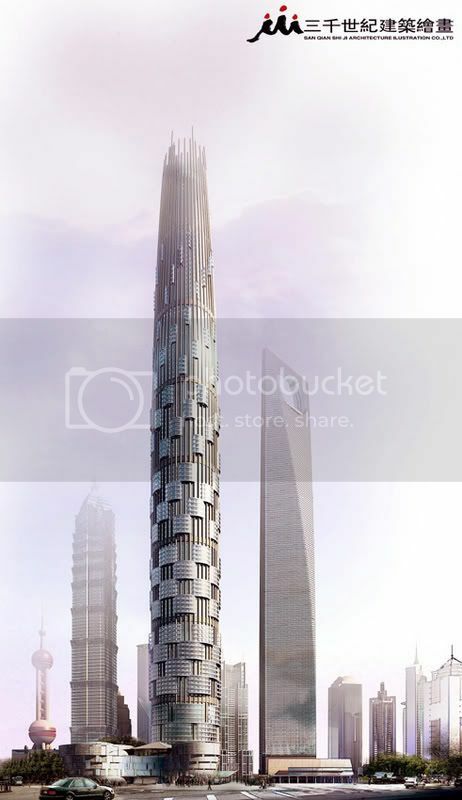 Que digo: Gigalomaníaco. 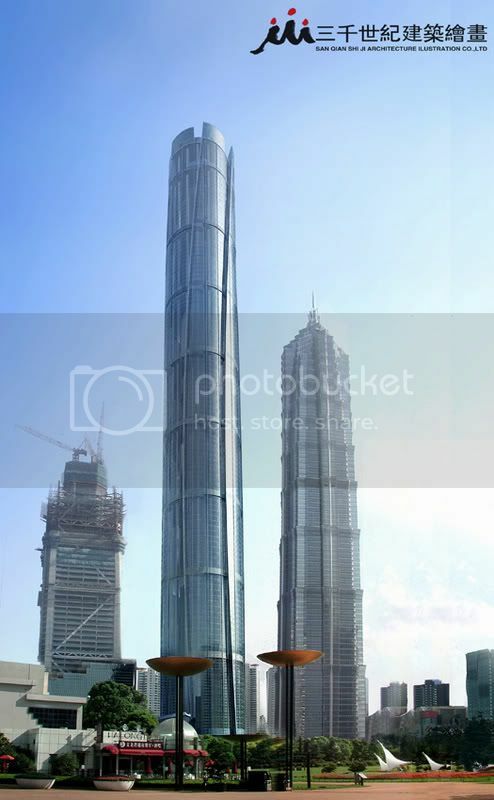 Rozando quizá lo teralomaníaco. 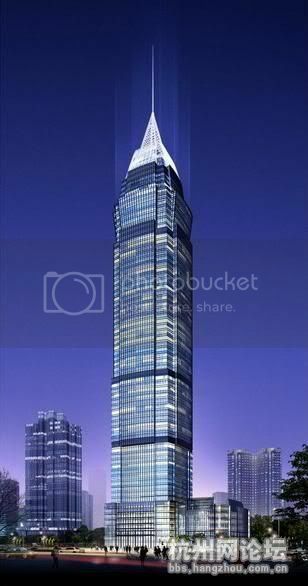 Last edited by Blue_caT; January 12th, 2008 at 11:00 PM. 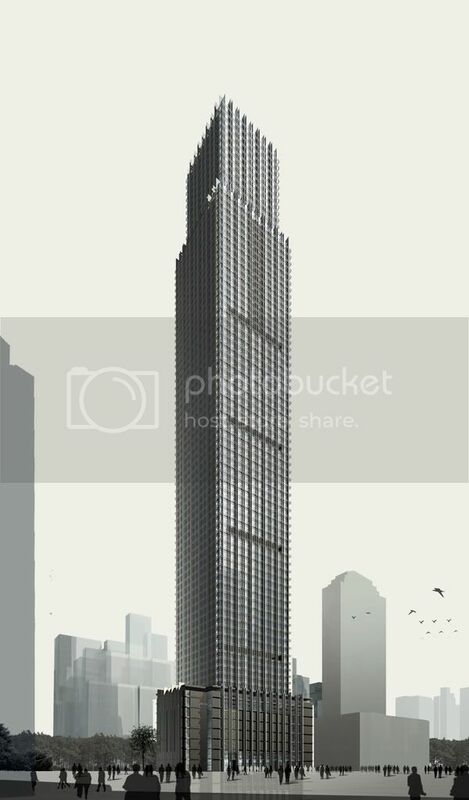 Para hacerme una idea de toda la recopilación he tenido que dividirlo en un par de días XD. 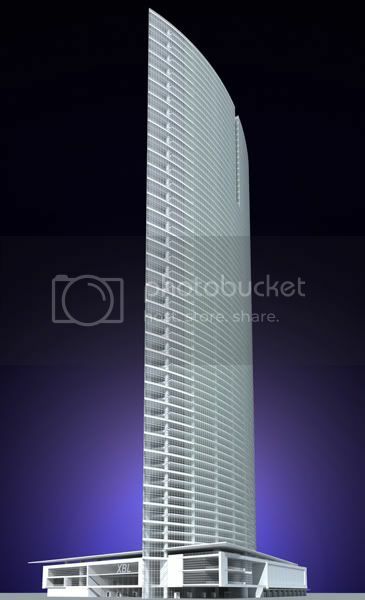 El trabajo impresionante como siempre. 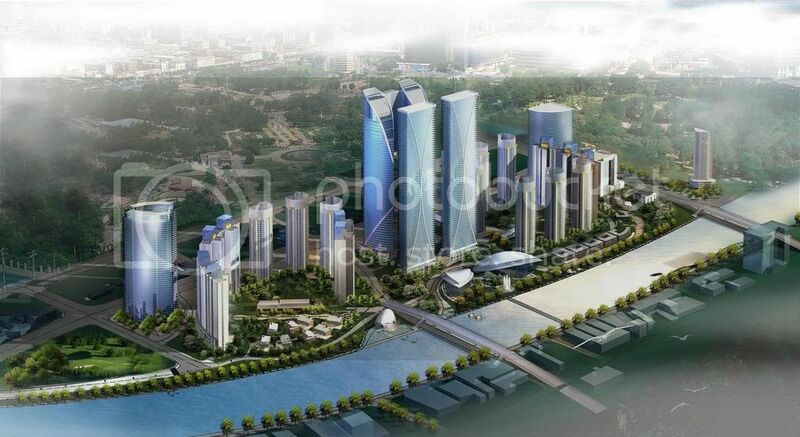 Lo de Chongqing acojonante, ya se podría a llevar aquí esas revisiones al alza. 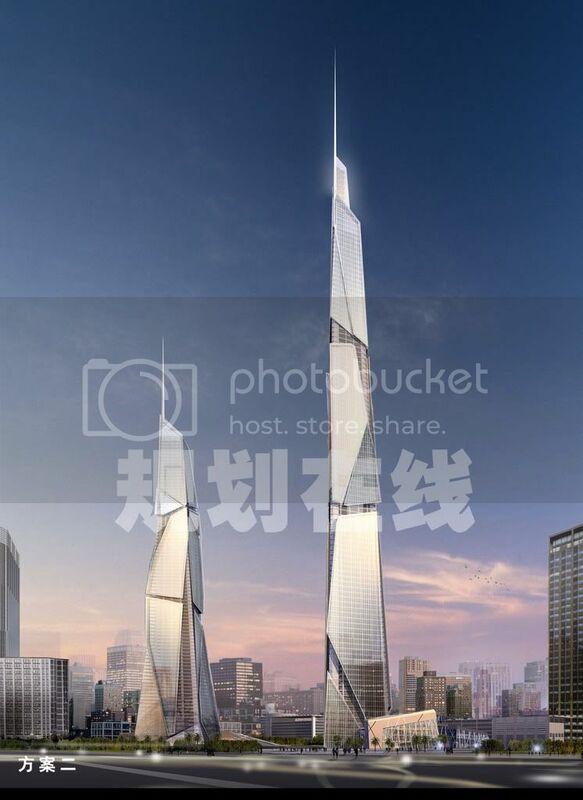 Por cierto z0rg, hace tiempo que no veo ningún estado de obras de ninguno de los megapuentes que se estaban construyendo o en proyecto, sino recuerdo mal había unos cuantos en la AM de Shanghai..
Nunca podremos agradacerle suficientemente a z0rg por el curre que se pega con estos hilos. 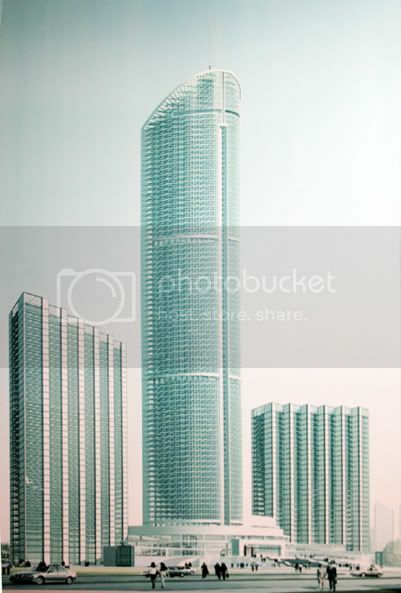 Sin él China casi sería invisible e este subforo. 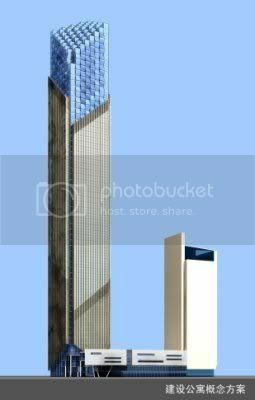 El urbanismo que está padeciendo España es un atentado contra derechos fundamentales, movido por intereses bastardos de constructores sin escrúpulos conchabados con alcaldes de poca monta, enfeudados unos y otros en la codicia y la avaricia. 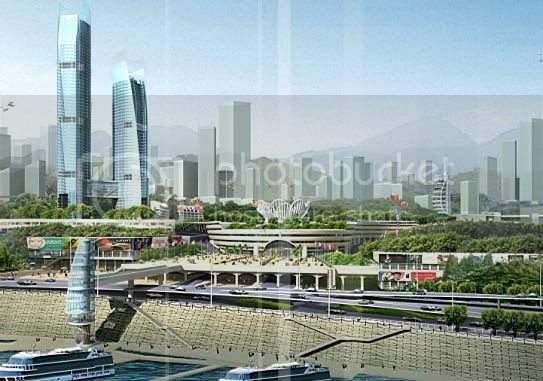 Europarlamentarios tras su visita a España. 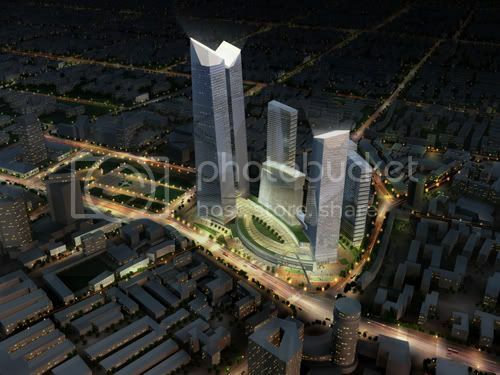 Más imágenes, el proyecto final es de KPF y no de SOM. 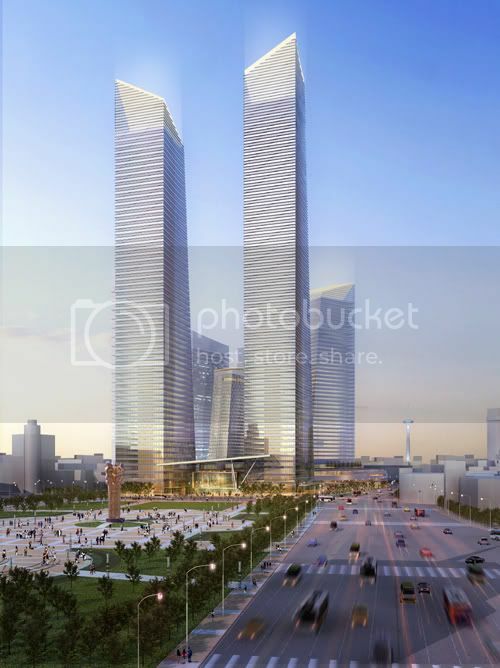 Parece que añadirán 3-5 torres de 200m+ en vez de una. 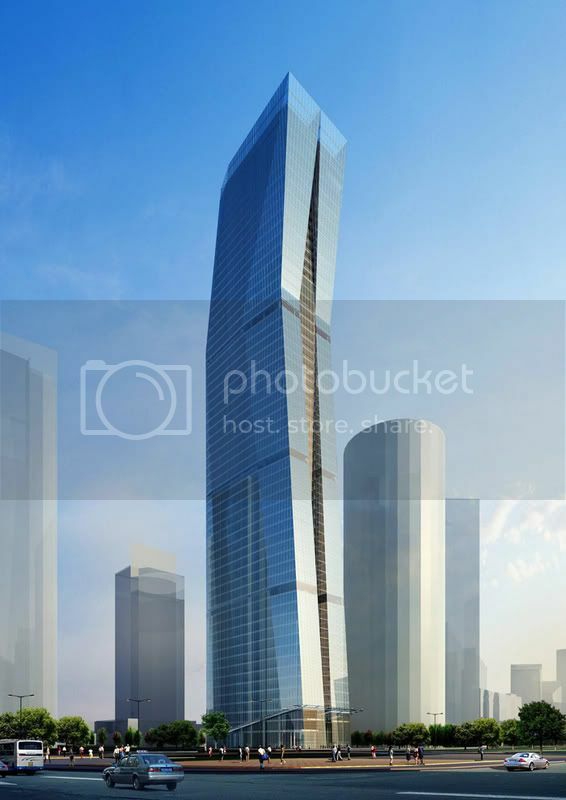 Acojonante. 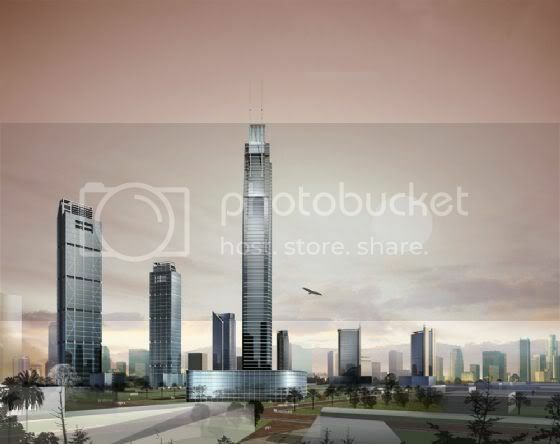 El proyecto final será de 400m+. 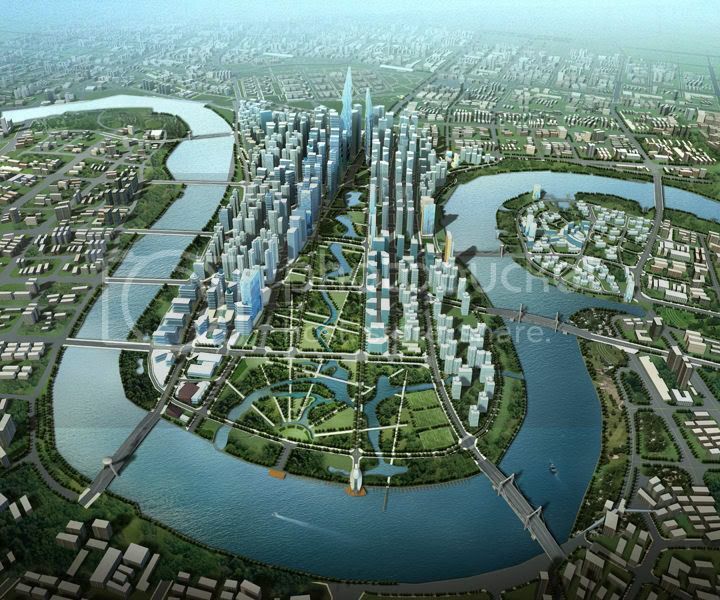 Todos los retrasos que están teniendo los megaproyectos de Chongqing se explican por la feroz carrera por construir el rasca más alto de la ciudad, que ya es abierta y oficial. 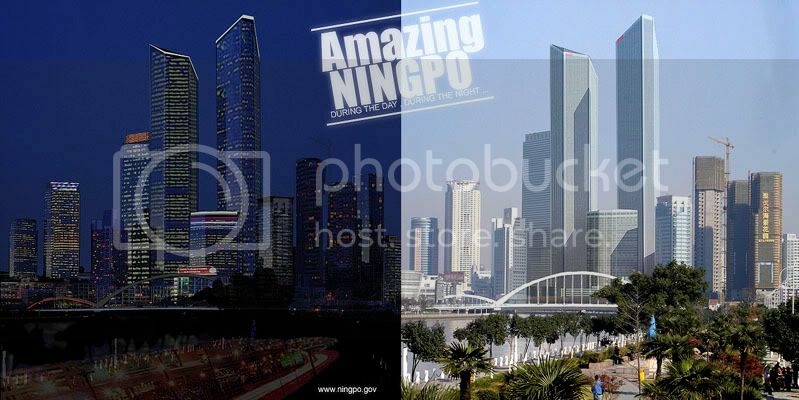 Last edited by z0rg; January 14th, 2008 at 06:28 PM.